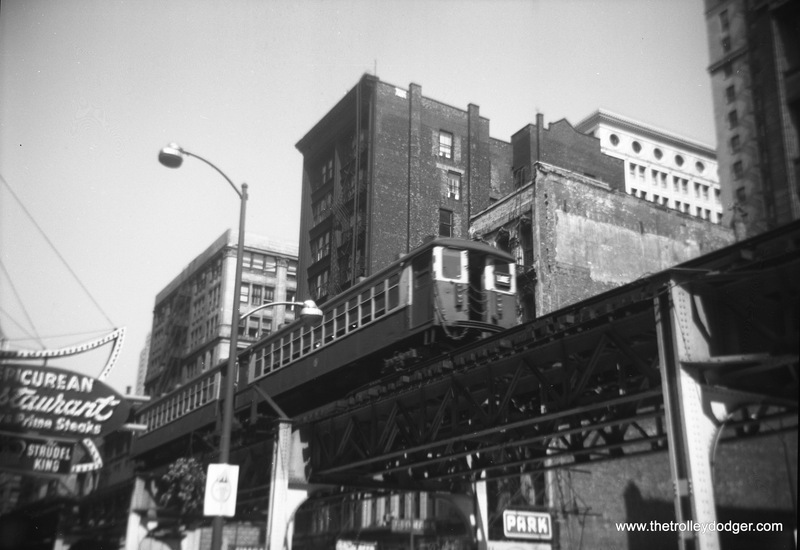 After our recent forays to the East Coast, part of a series by guest contributor Kenneth Gear, we are back in Sweet Home Chicago for this one. 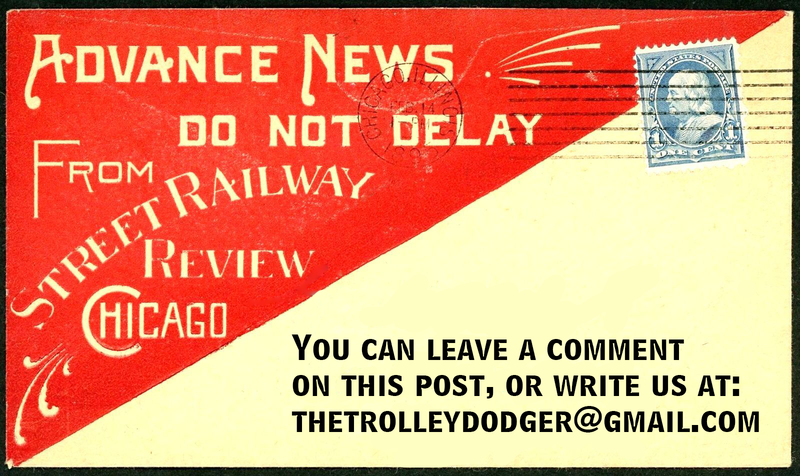 Watch this space for additional posts in Ken’s series. 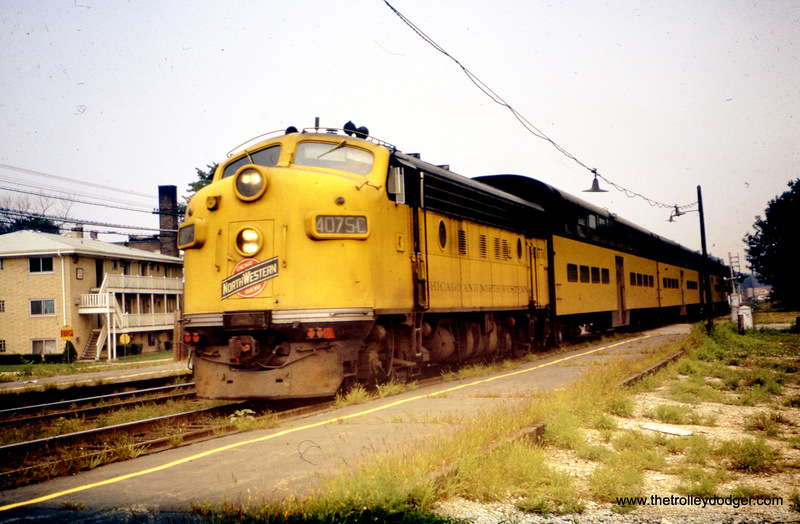 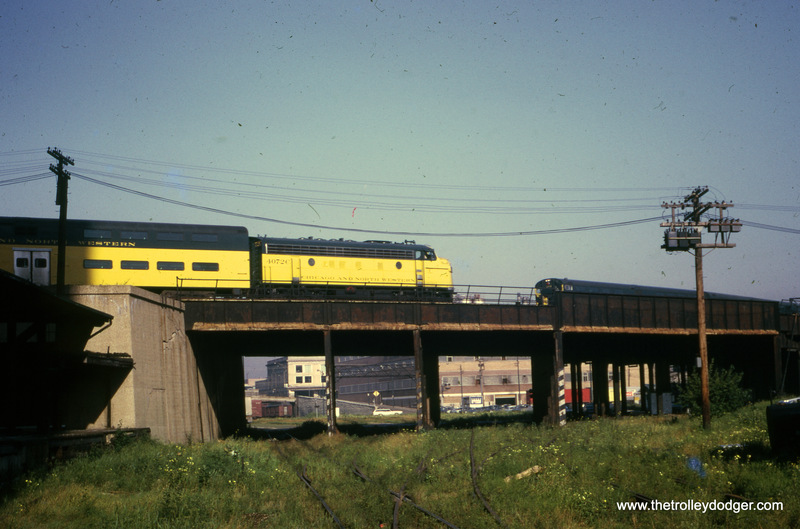 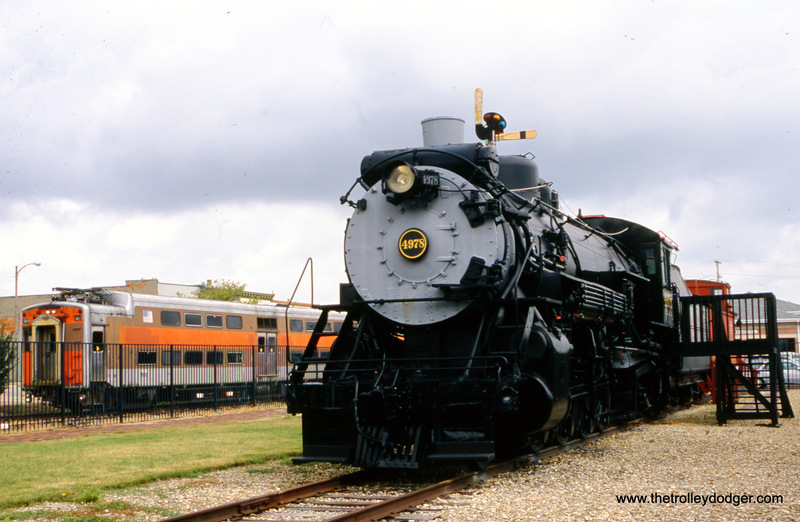 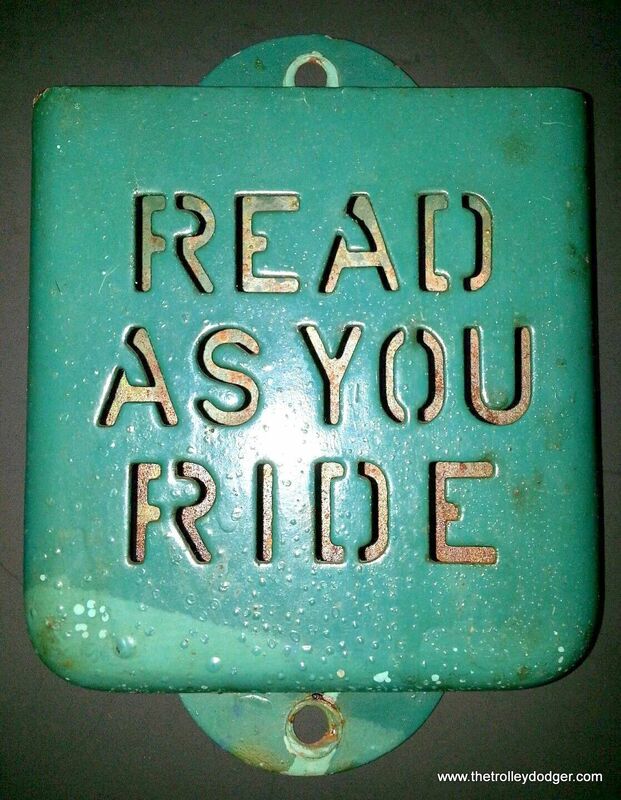 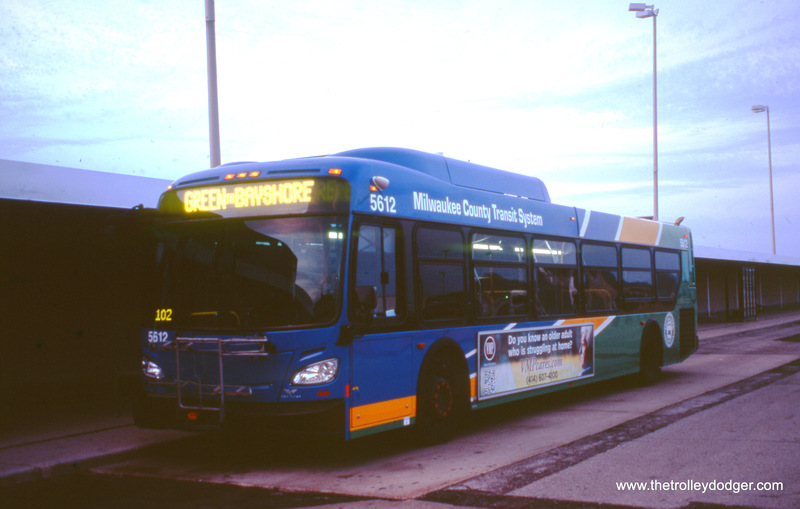 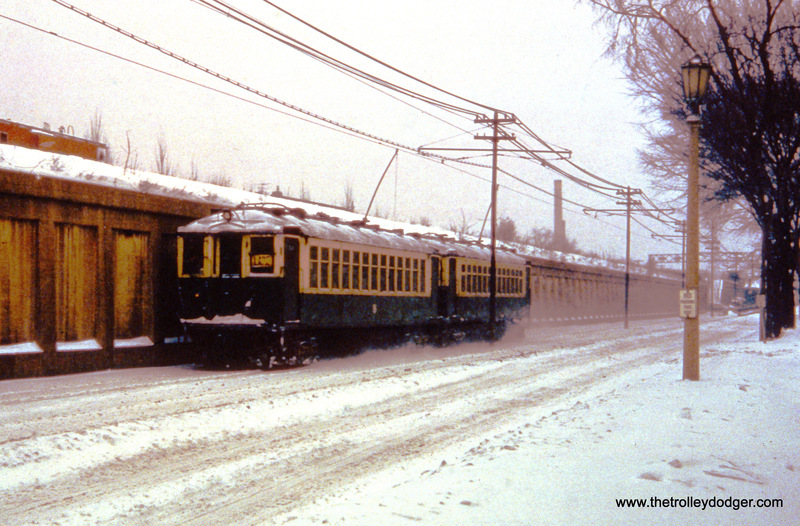 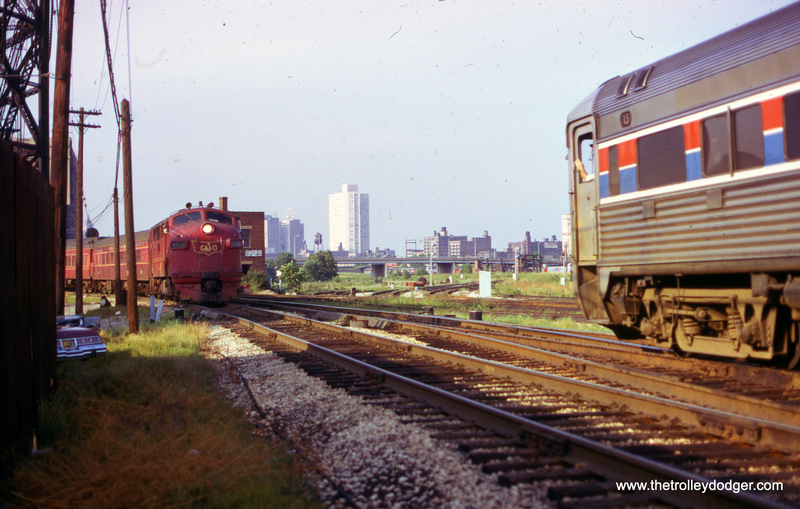 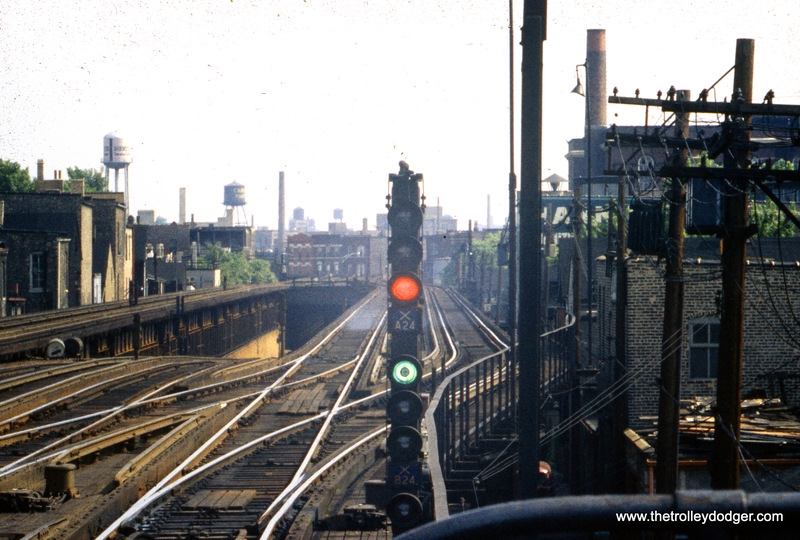 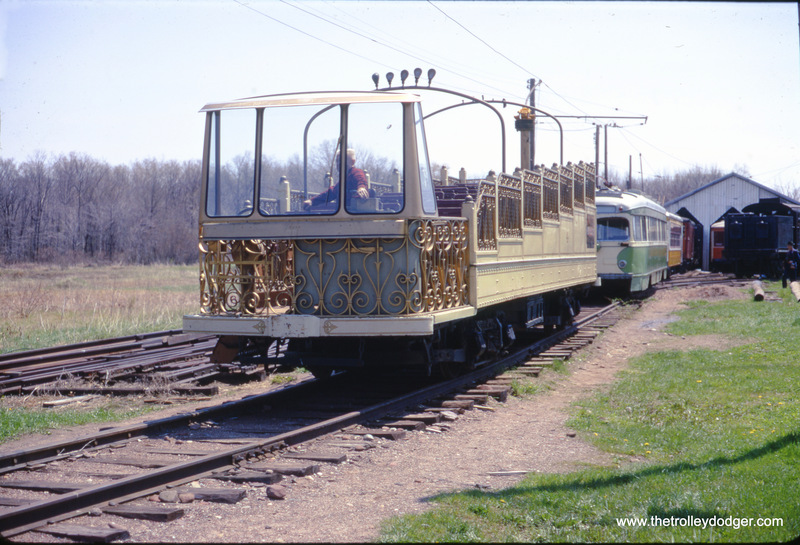 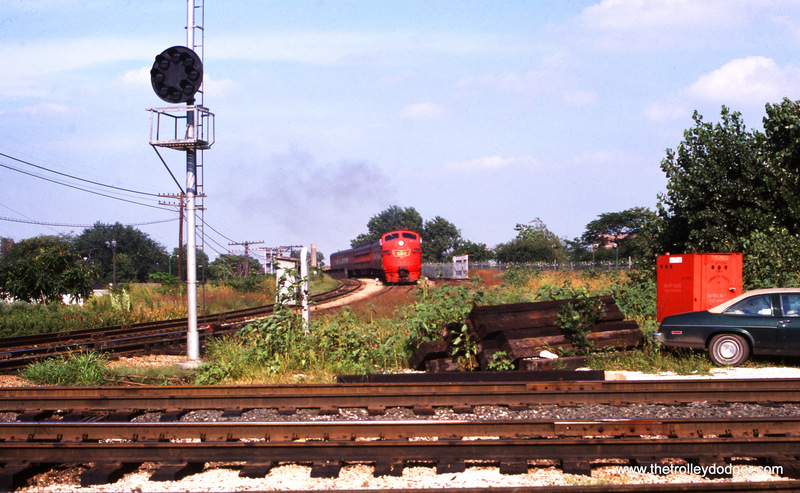 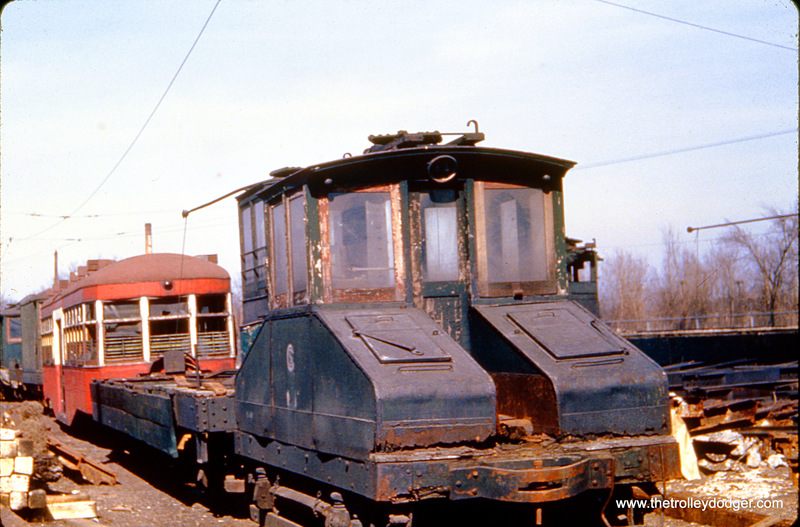 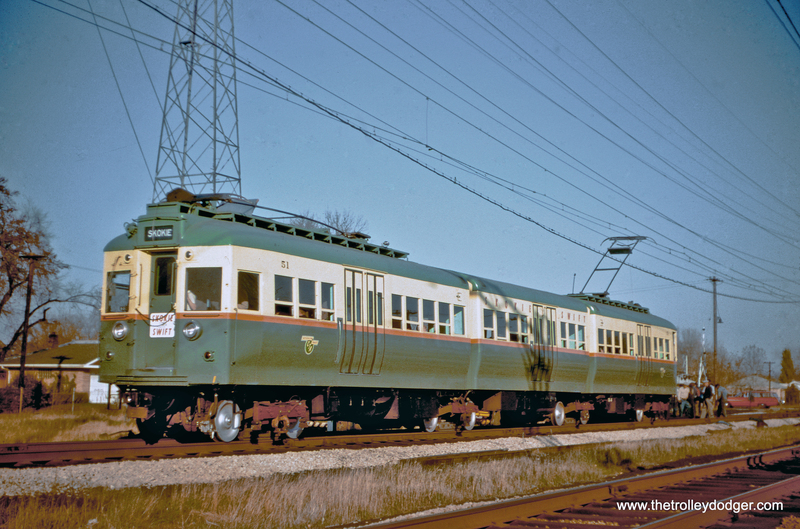 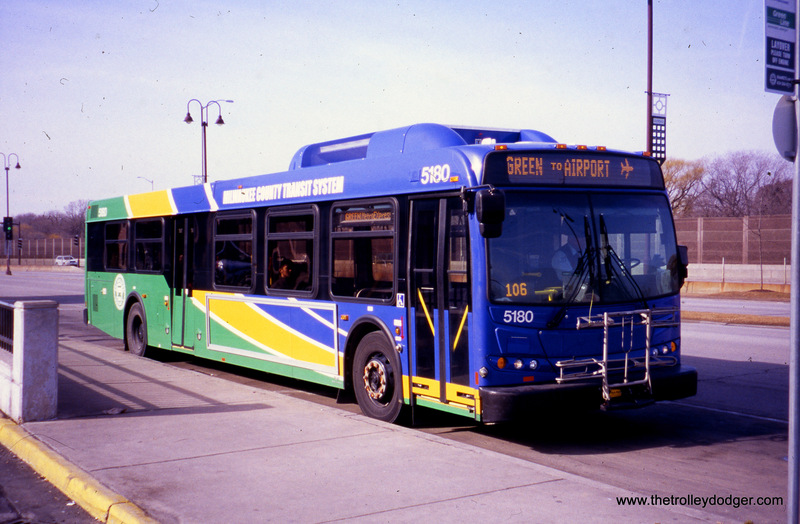 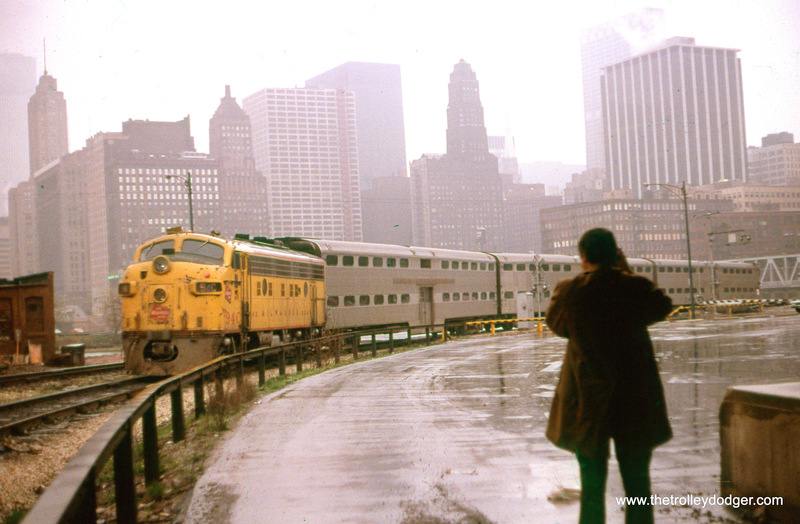 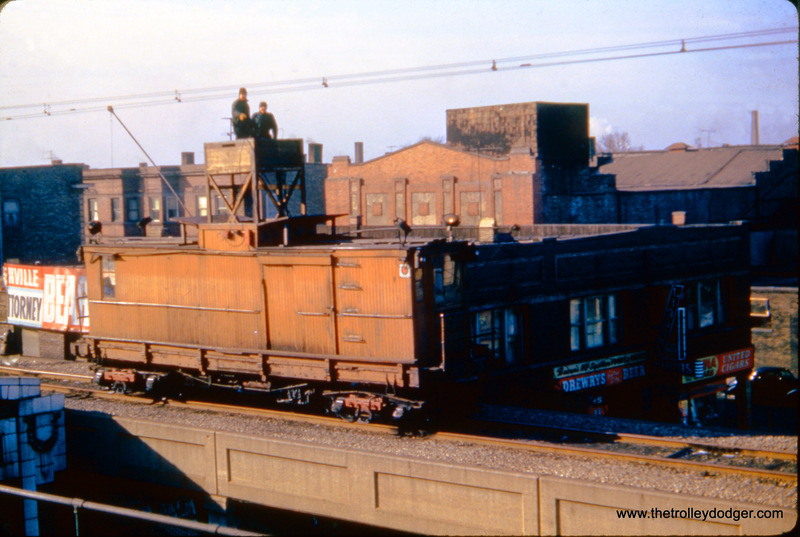 Although we are a few days late for Valentine’s Day, we nonetheless have many photographic gifts for Chicago-area traction fans in today’s post, that constitute a virtual Valentine to our readers. 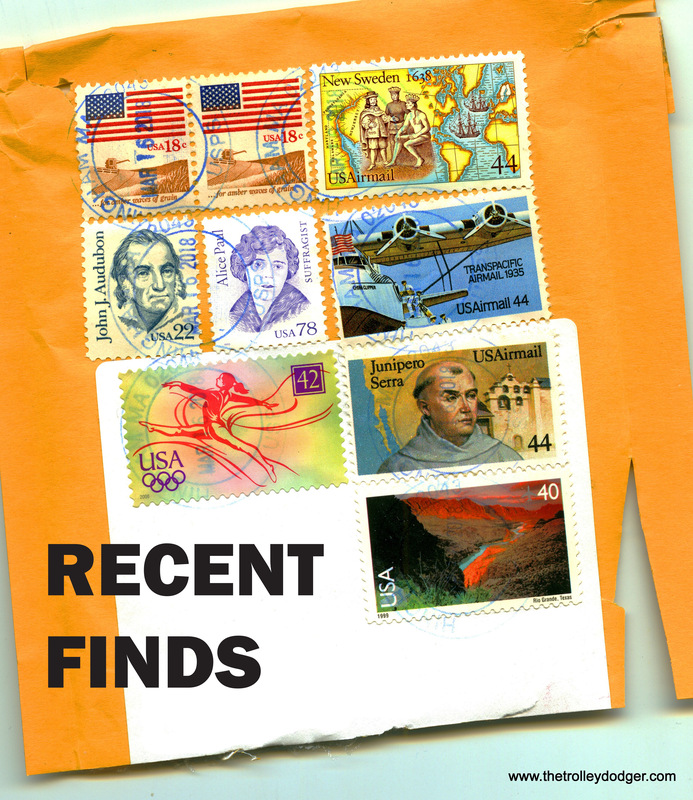 First, we have some recent finds. 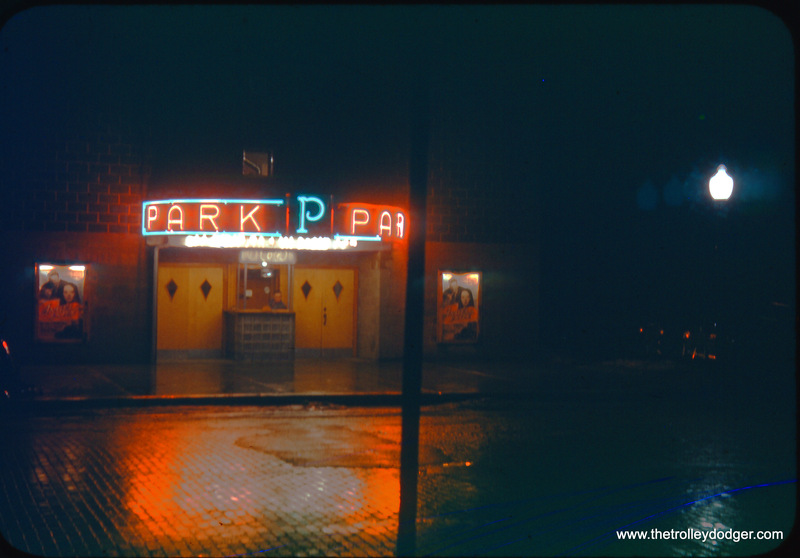 Next, a few color slides courtesy of William Shapotkin. 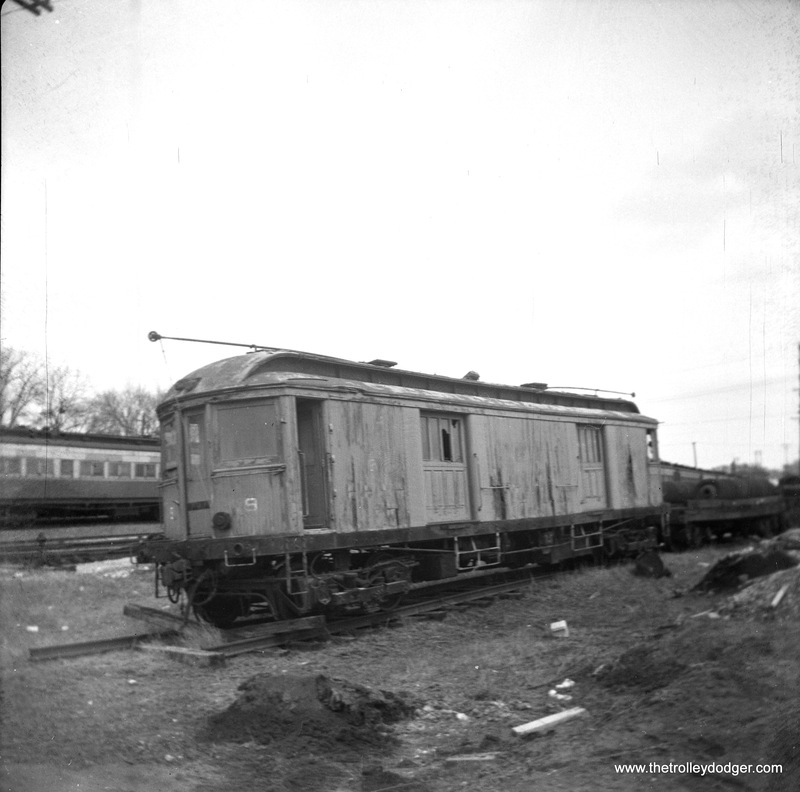 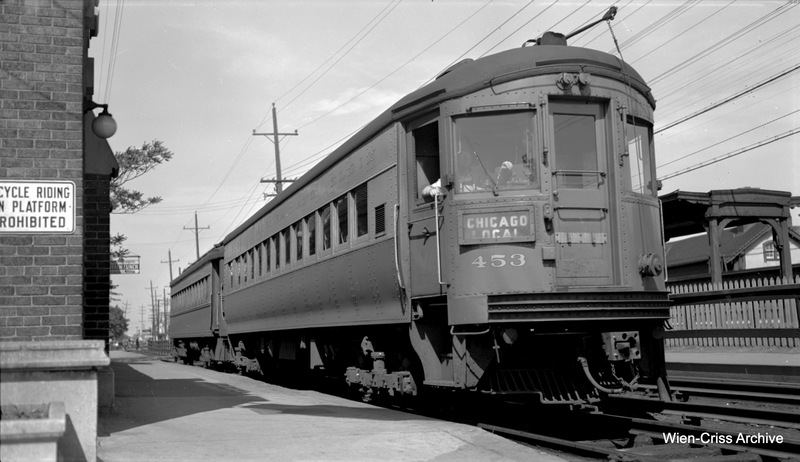 Then, a bevy of classic black-and-white images taken by the late Robert Selle, one of the greatest railfan photographers. 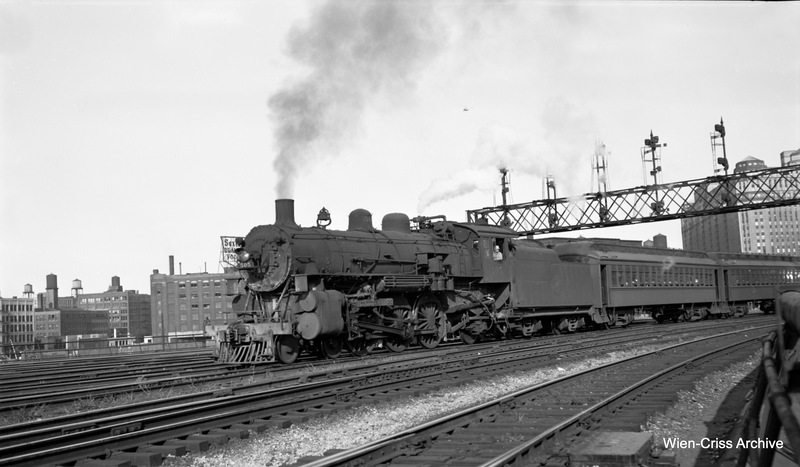 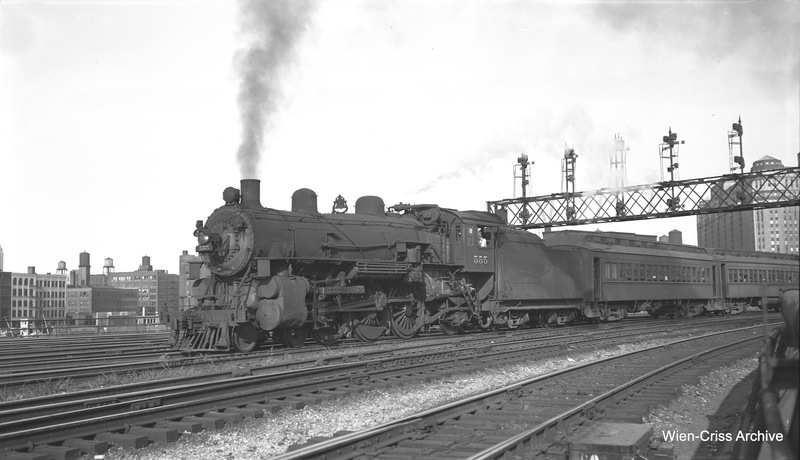 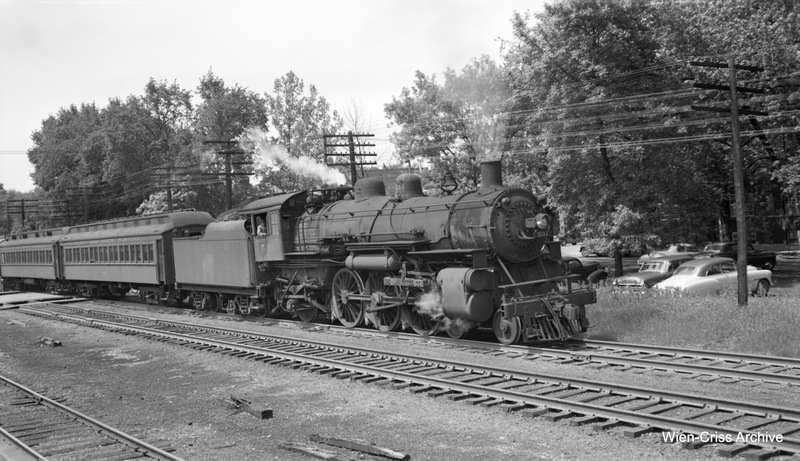 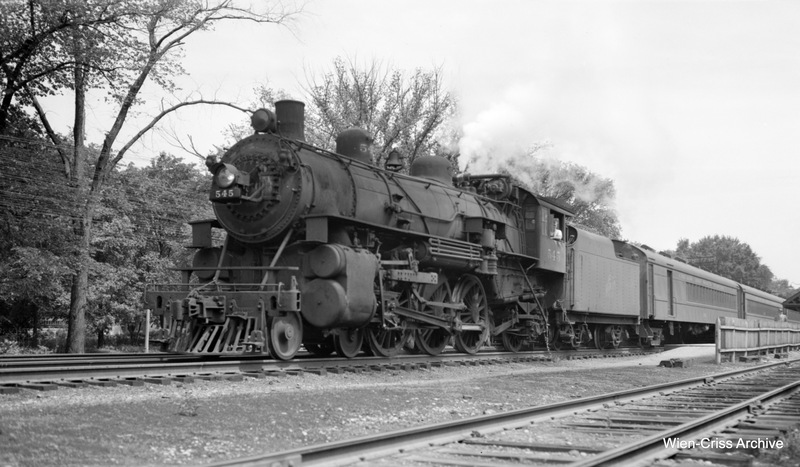 We also have a book review, and there are two new audio CD collections in our ongoing efforts to digitize 1950s steam railroad audio for the 21st Century. 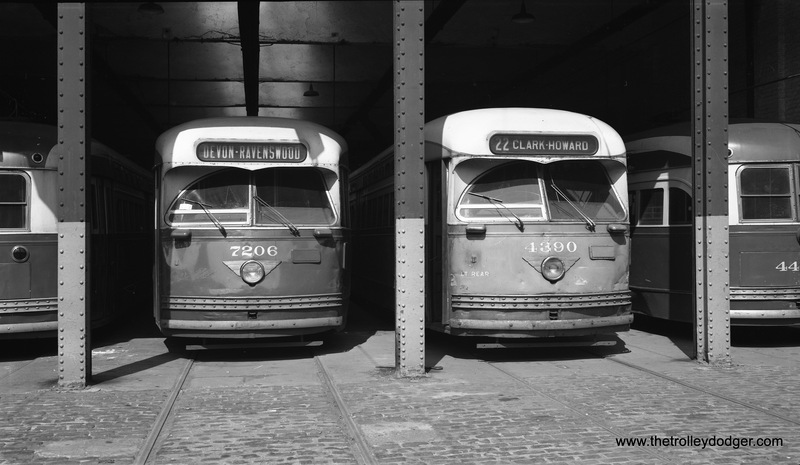 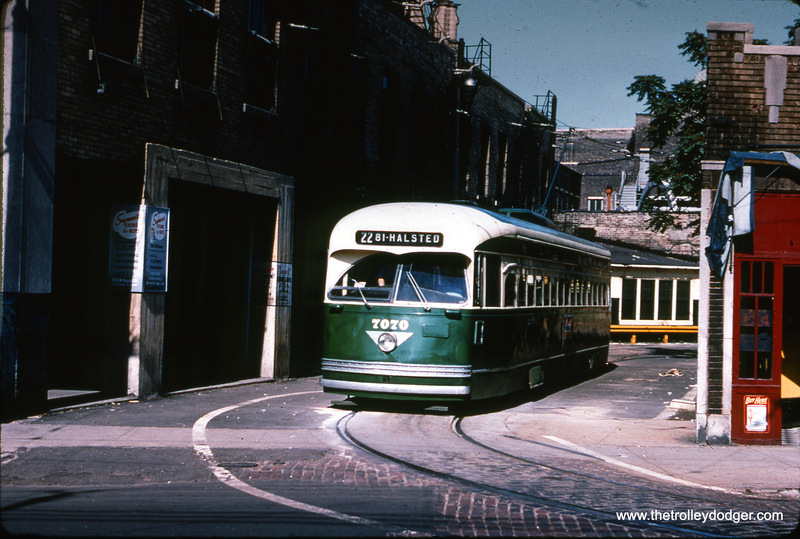 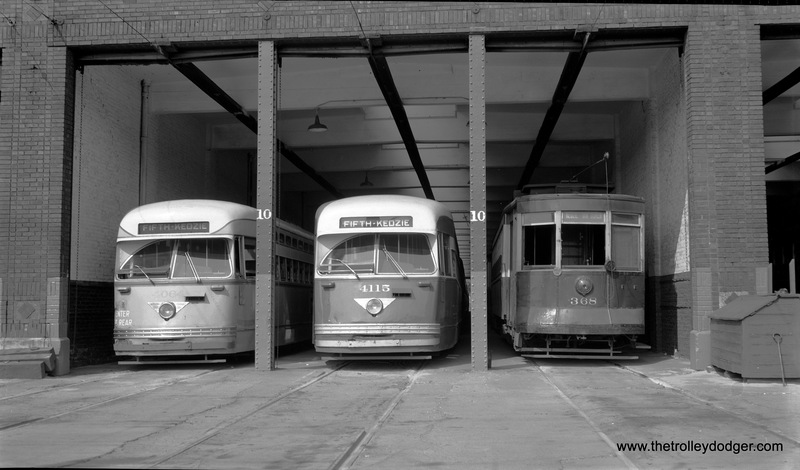 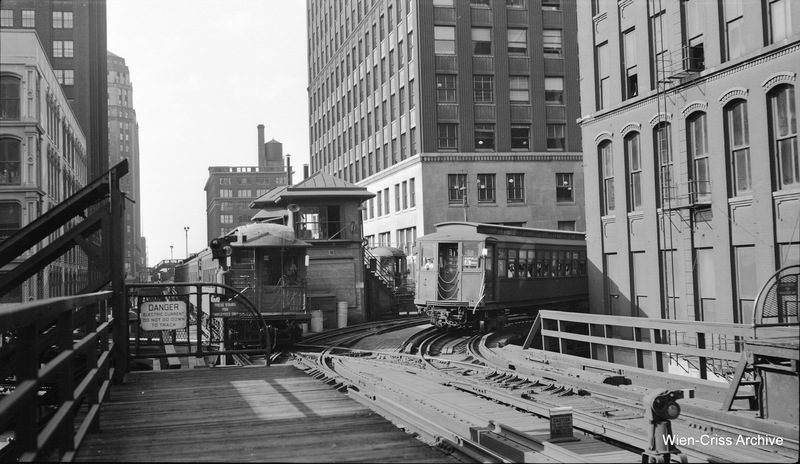 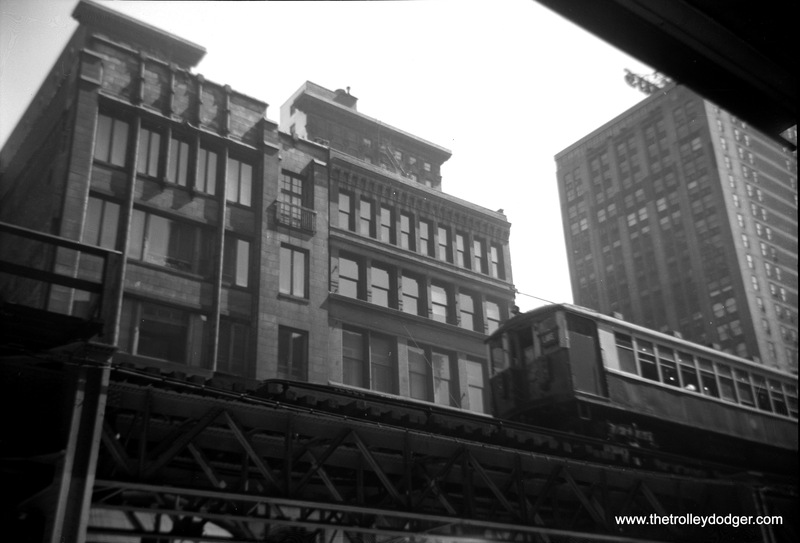 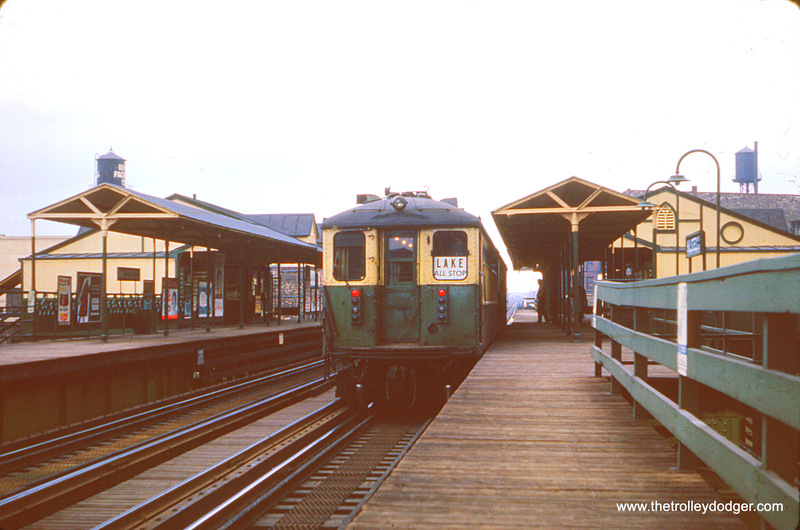 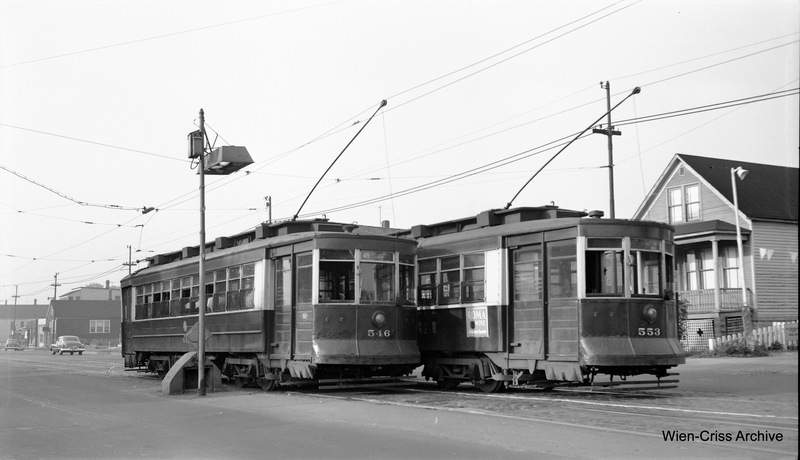 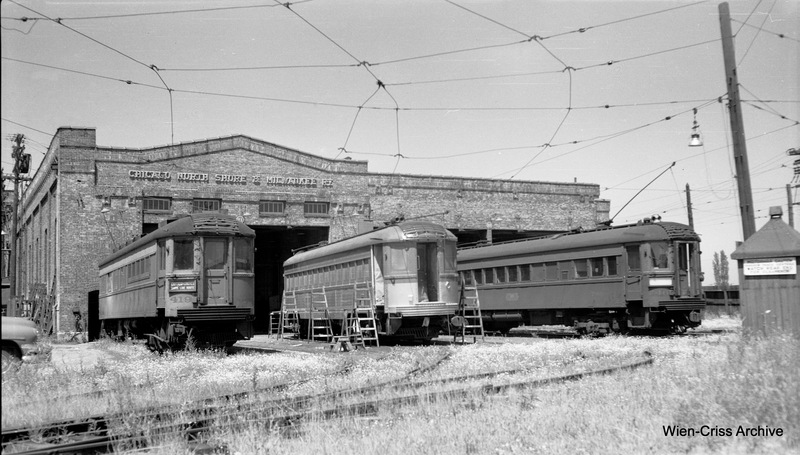 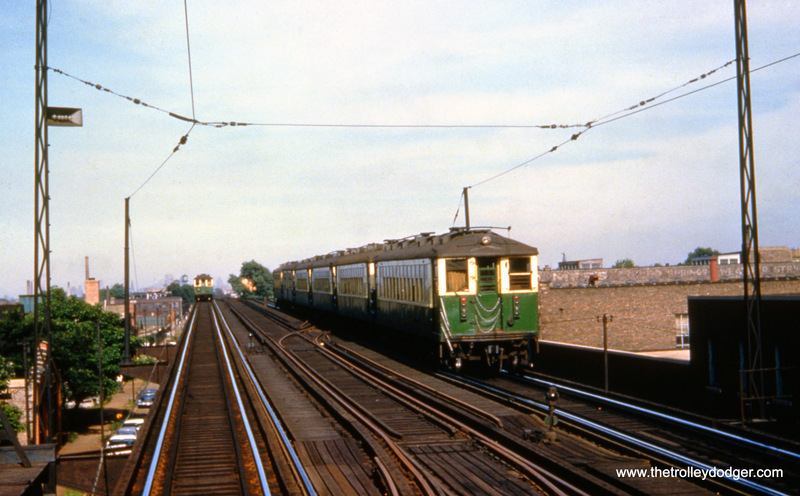 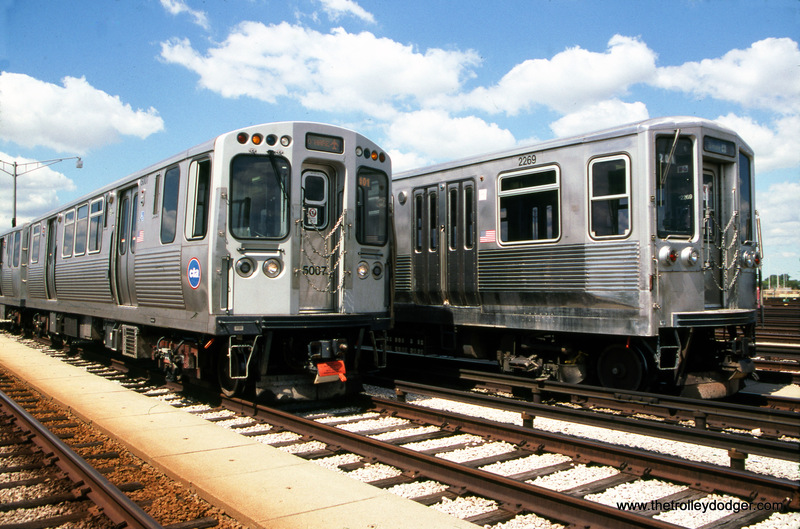 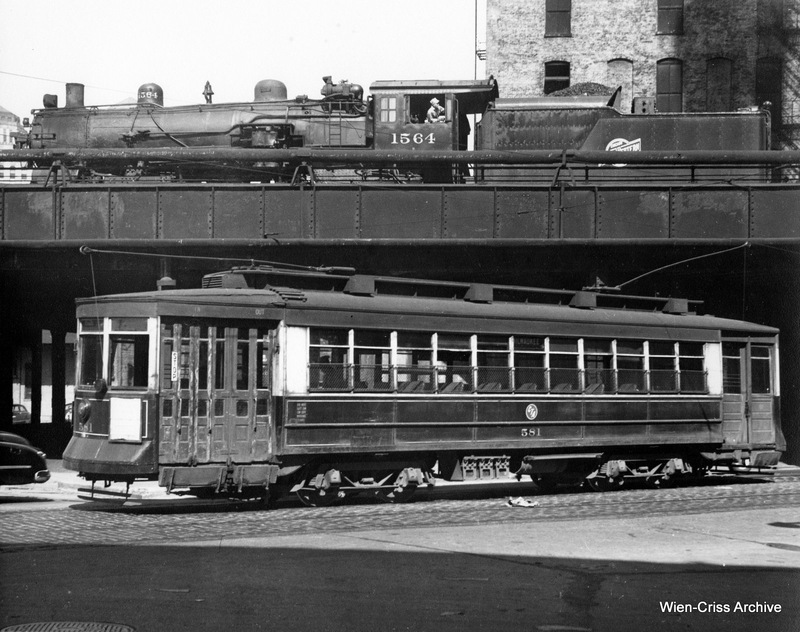 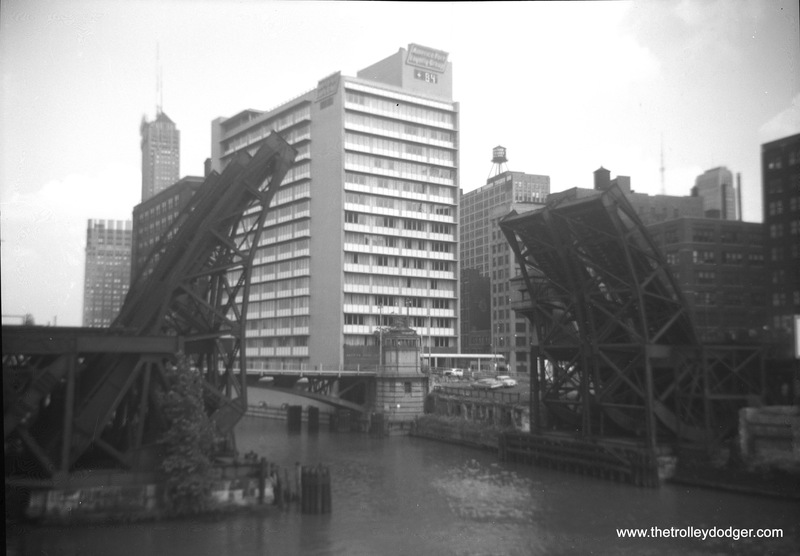 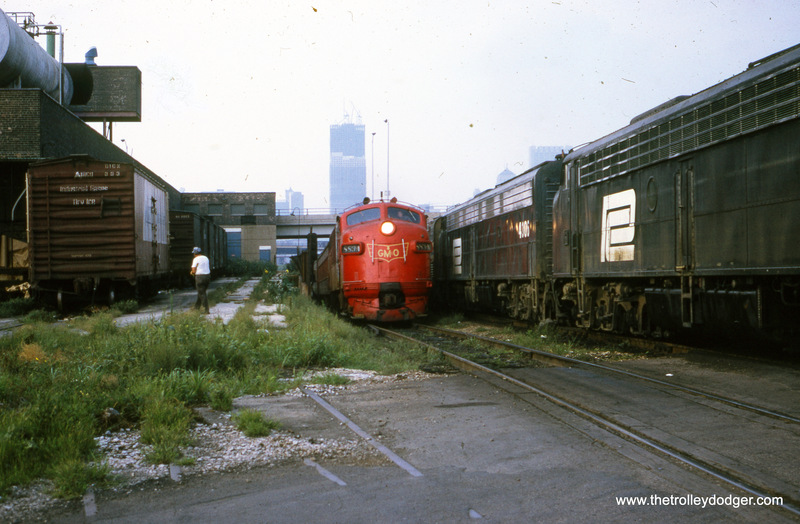 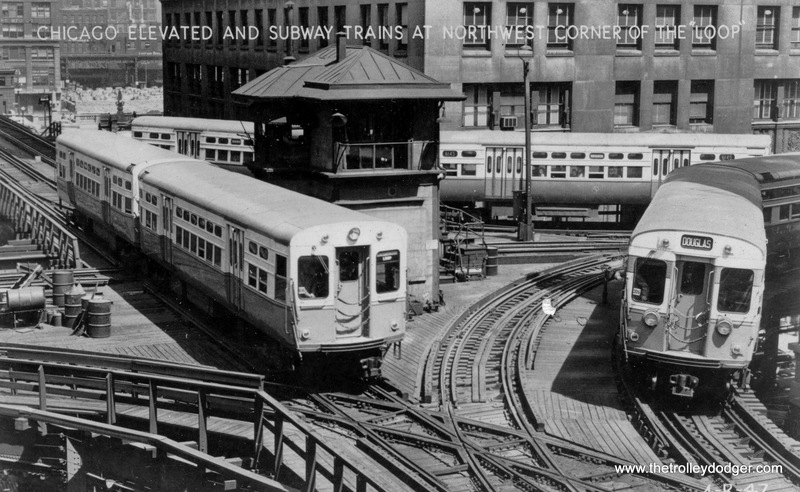 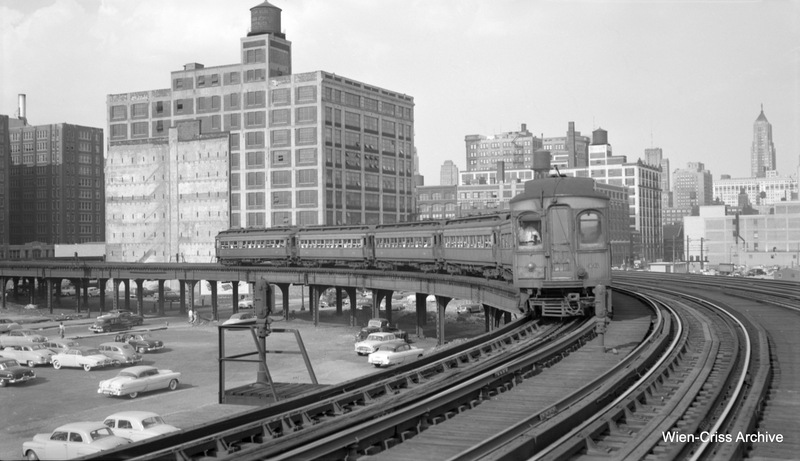 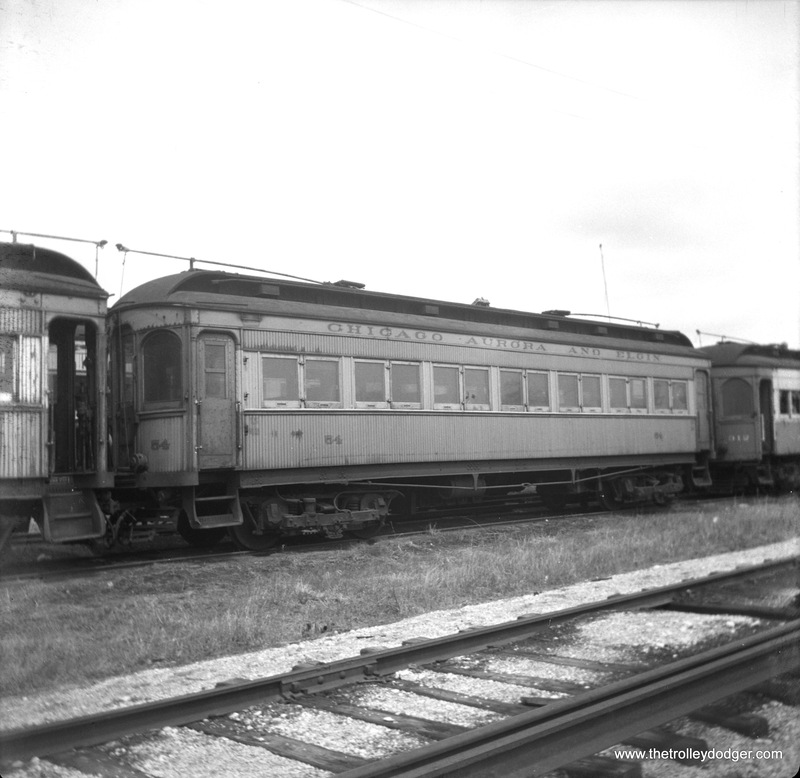 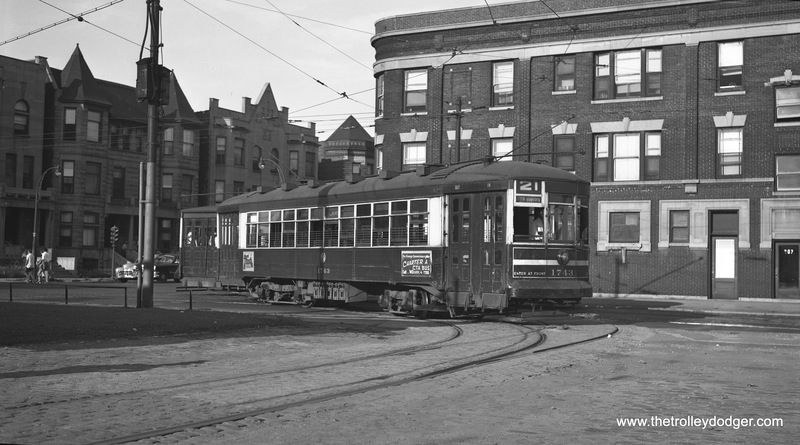 Three CTA trains of 6000-series “L”/Subway cars are lined up by the old Tower 18 in the early 1950s. 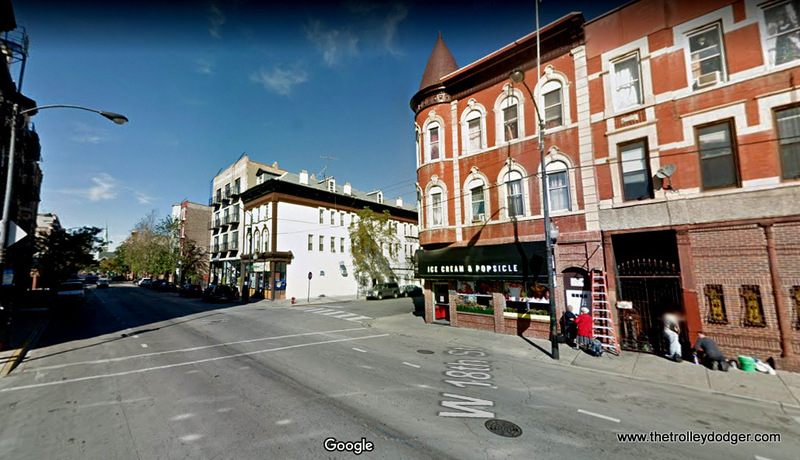 As you can see, with the tower in the middle of the junction, not all moves could be made. 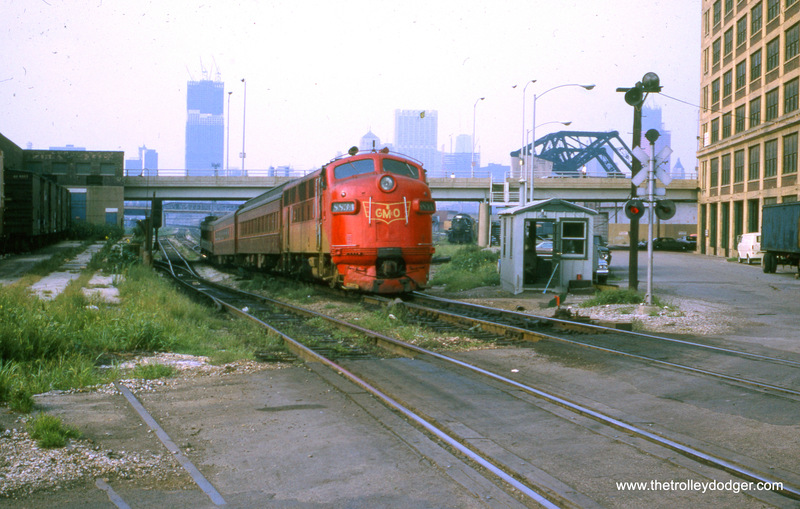 For example, eastbound trains coming from Lake Street could not go straight east, but had to turn south. 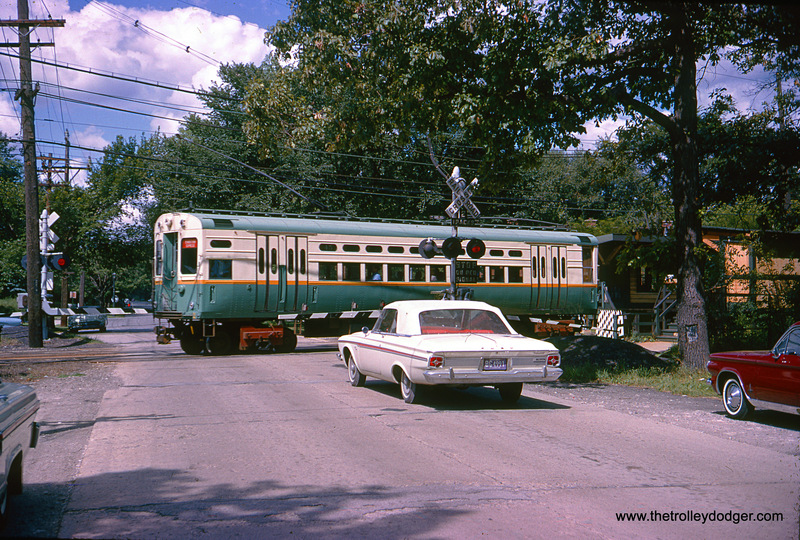 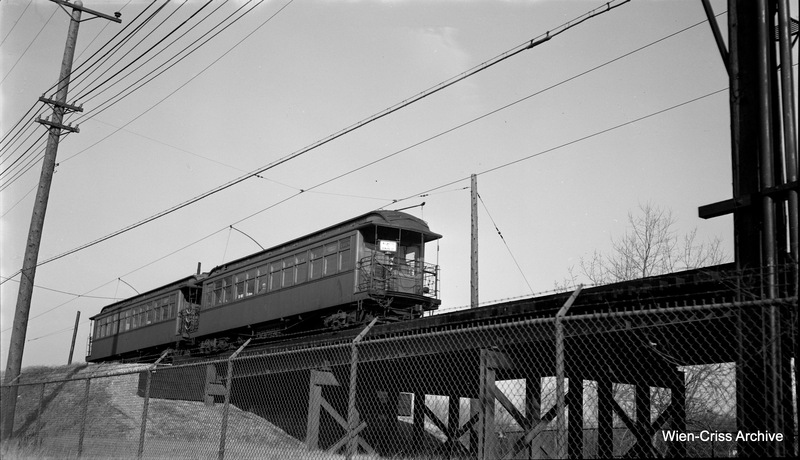 At this time, traffic on both the inner and outer Loop tracks went in the same direction (counter-clockwise). 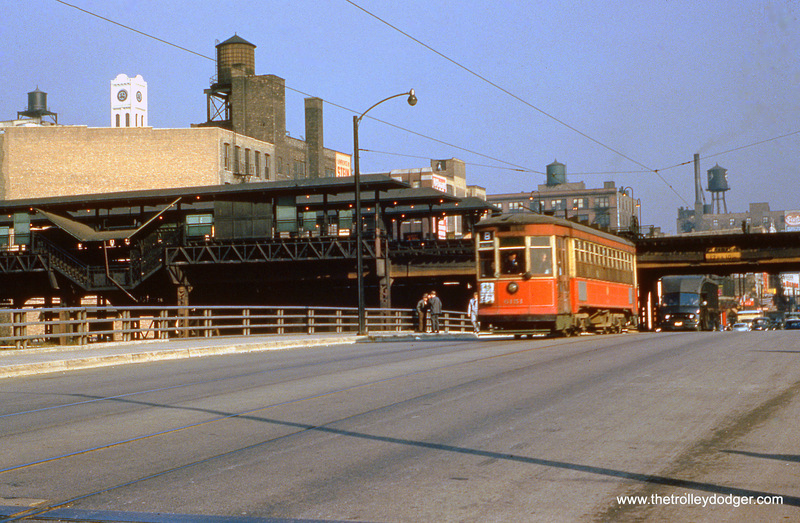 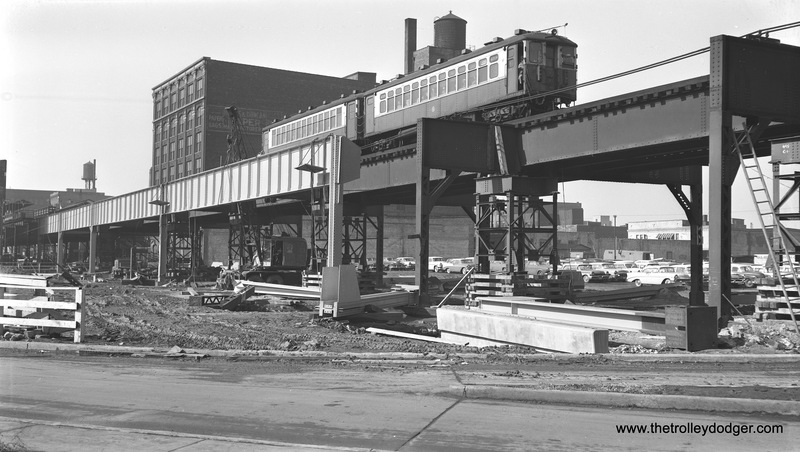 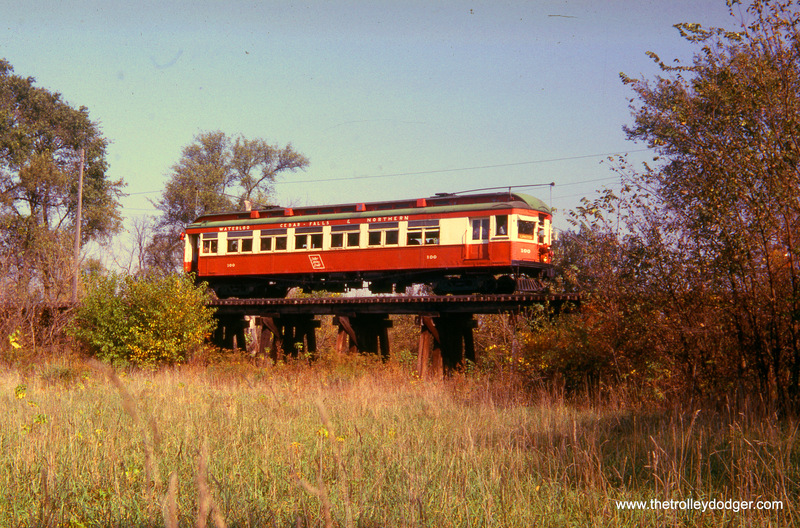 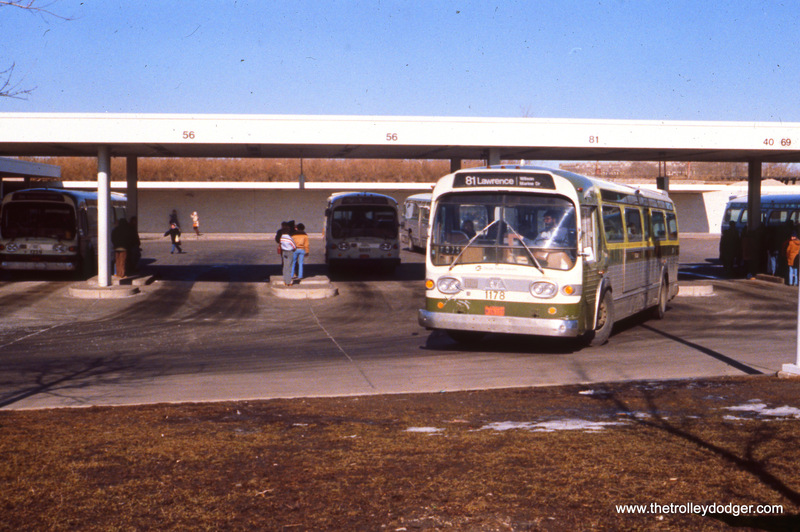 This arrangement was changed in 1969 when the CTA wanted to through-route Lake with the new Dan Ryan line. 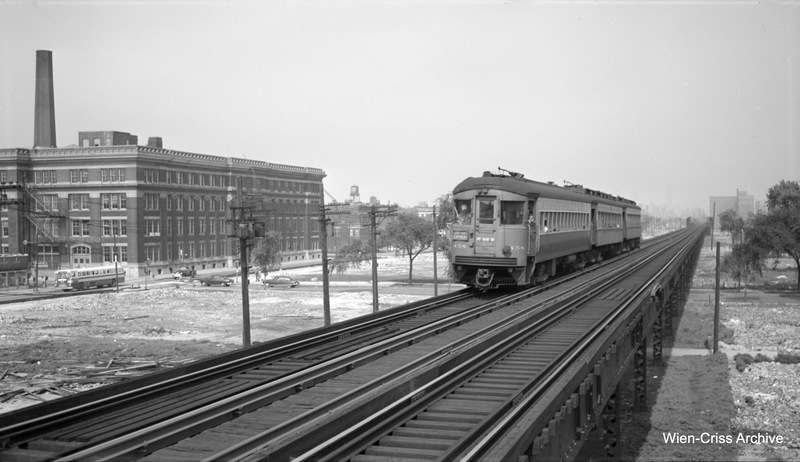 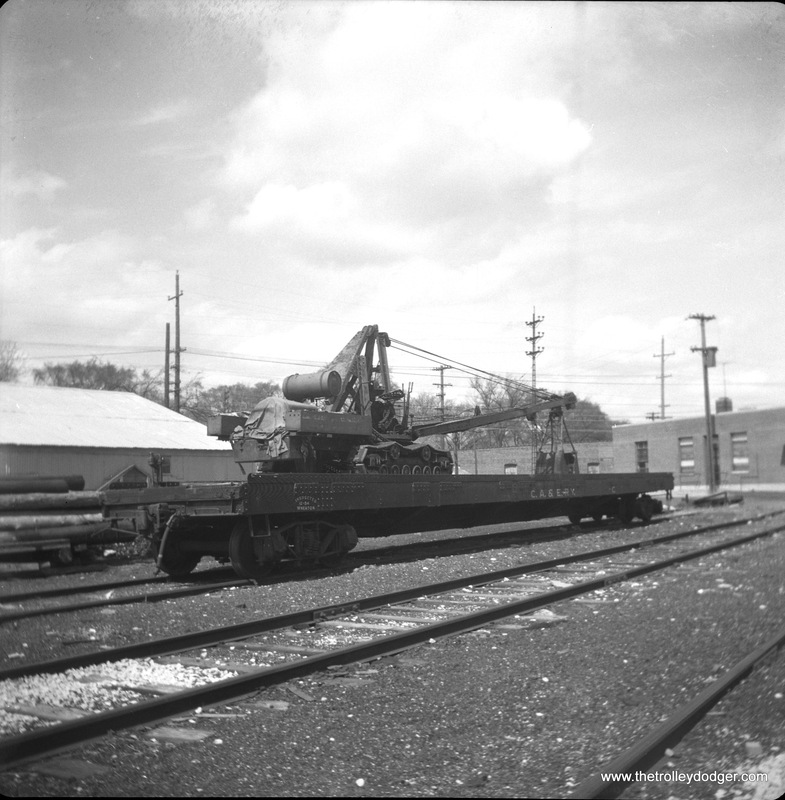 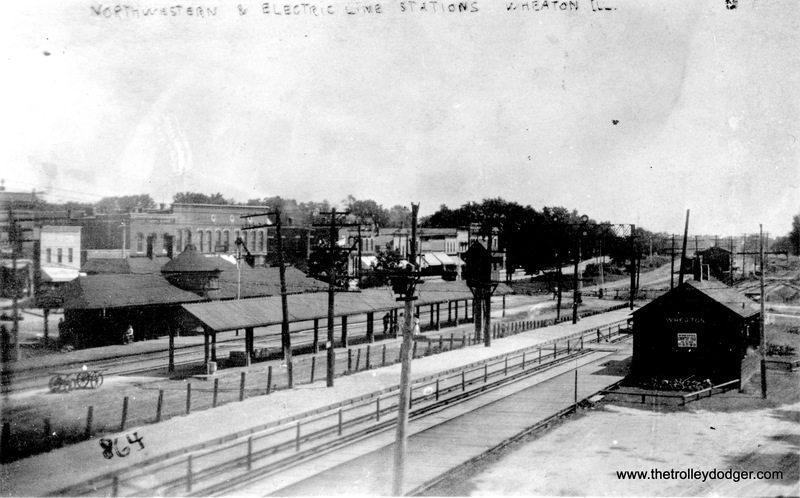 The tower was moved and replaced with a new one, and new eastbound trackage was built where the old tower was. 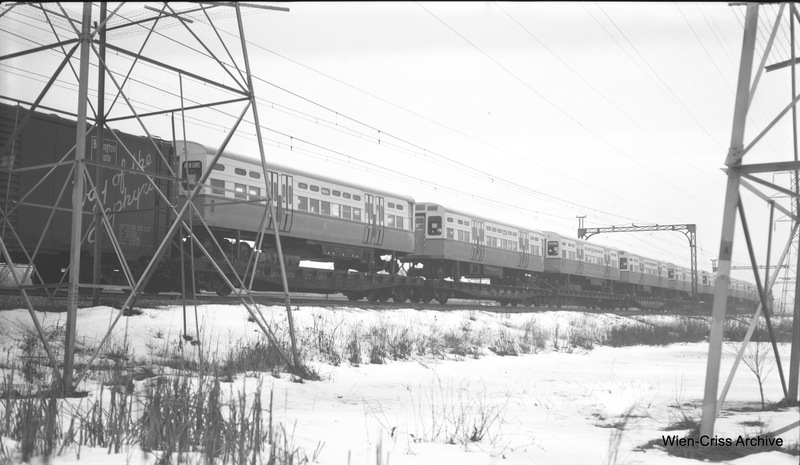 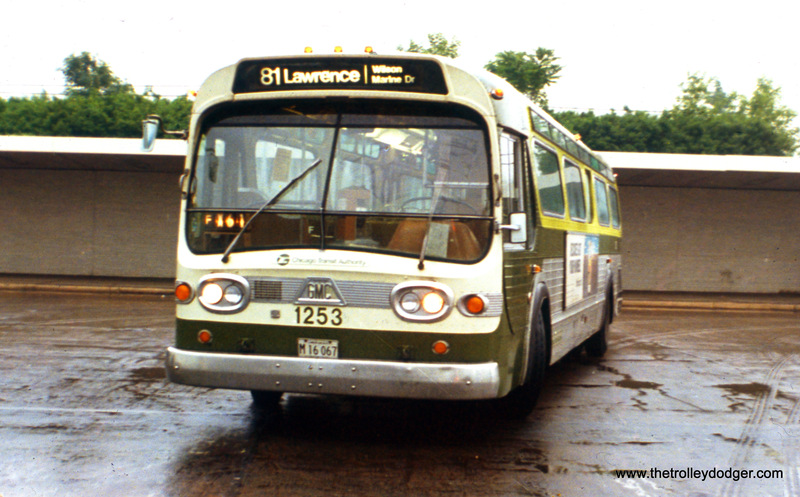 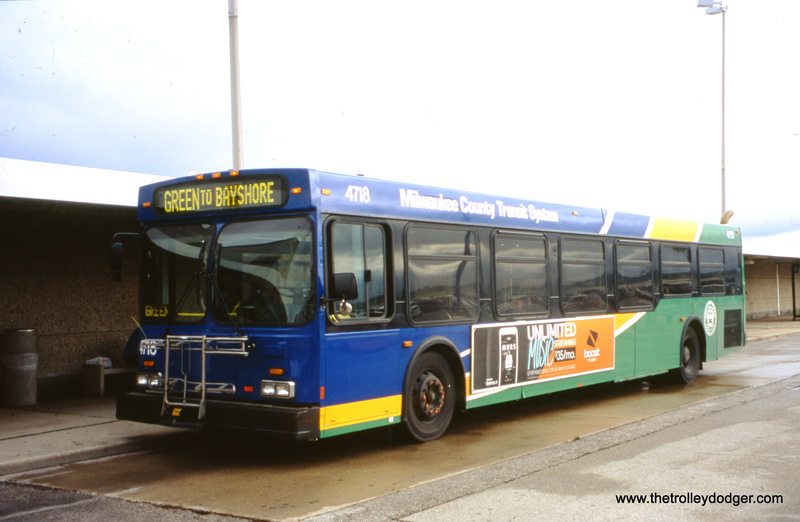 That was also the beginning of bi-directional operations on the Loop, which continue to this day. 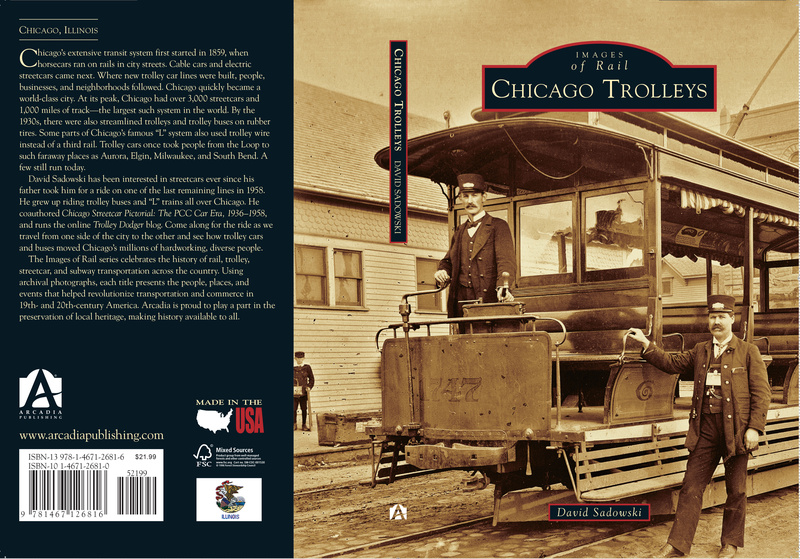 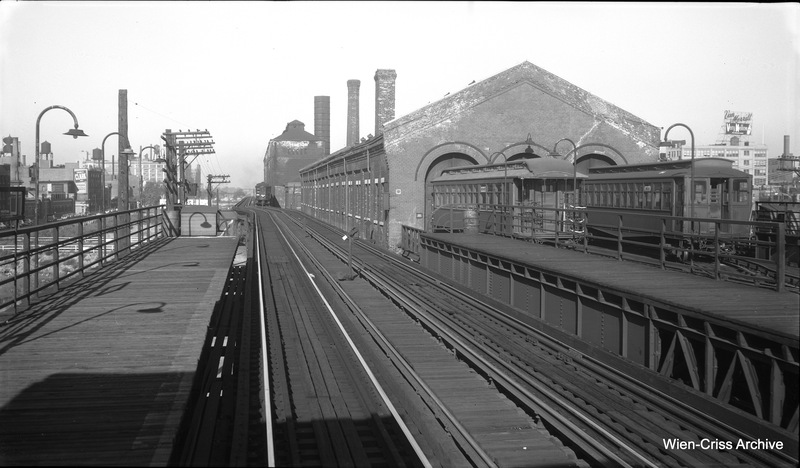 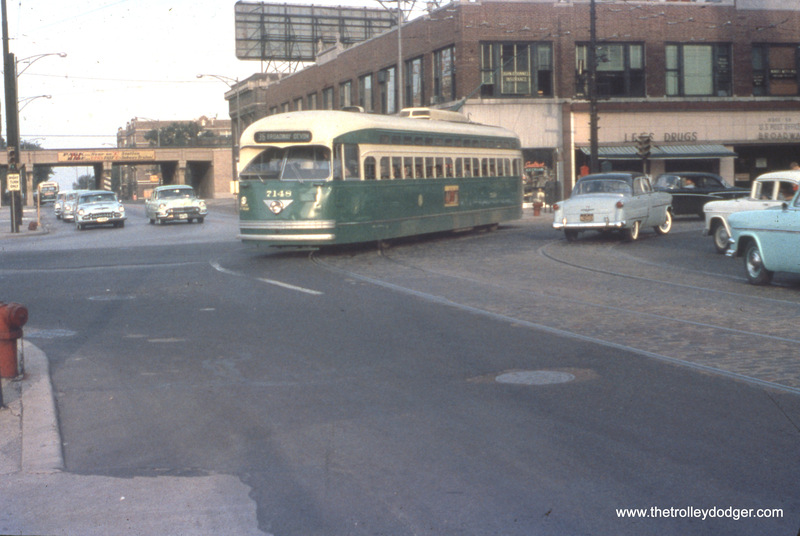 “Looking westbound on (North) Lake Street toward Austin Boulevard., cars 3153 and 1757, woring CTA Lake Street line, lay over at west end-of-line. 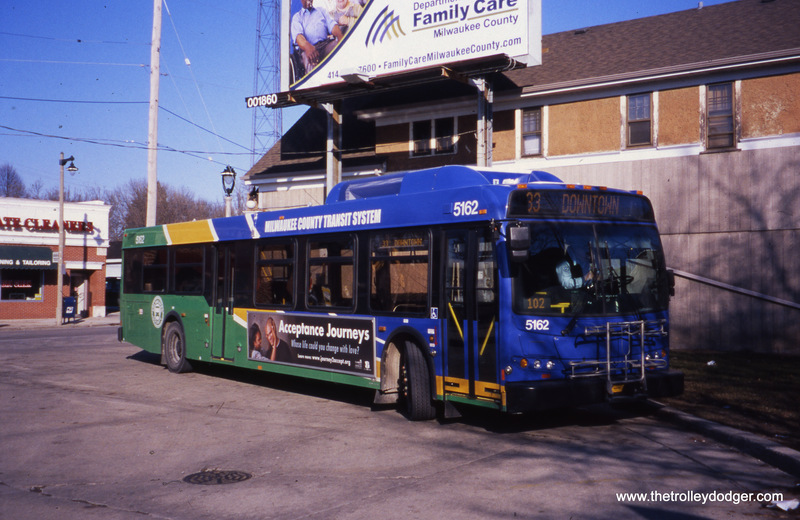 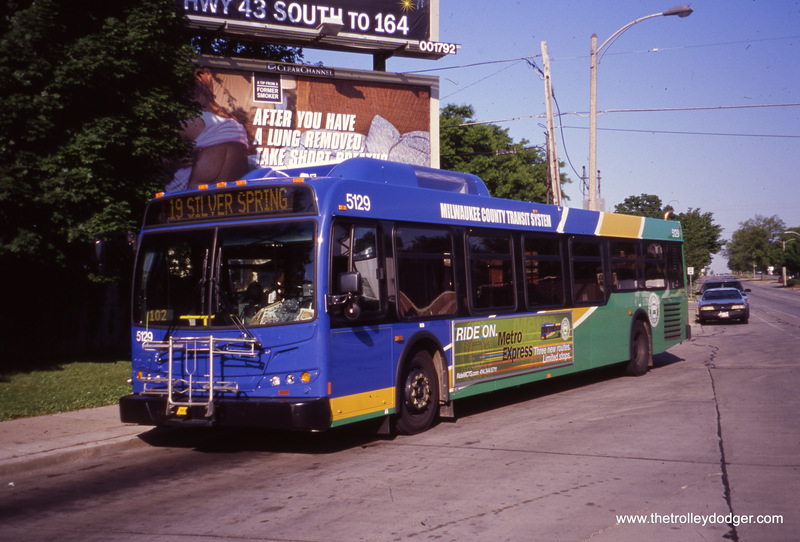 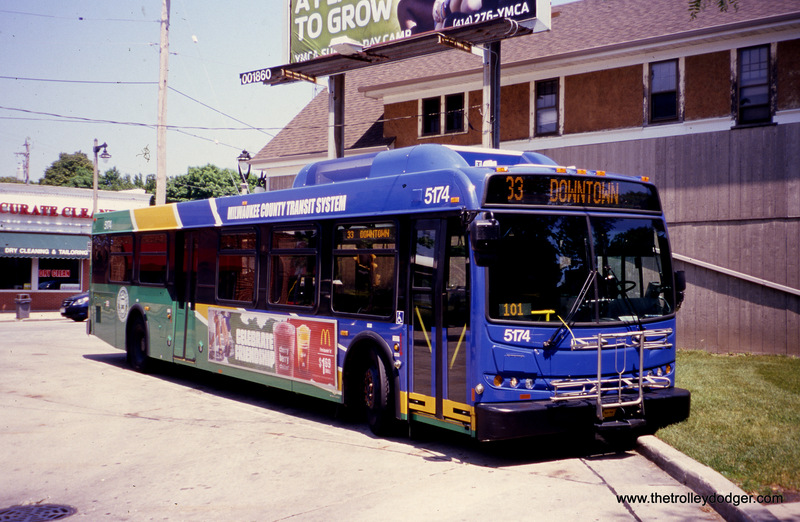 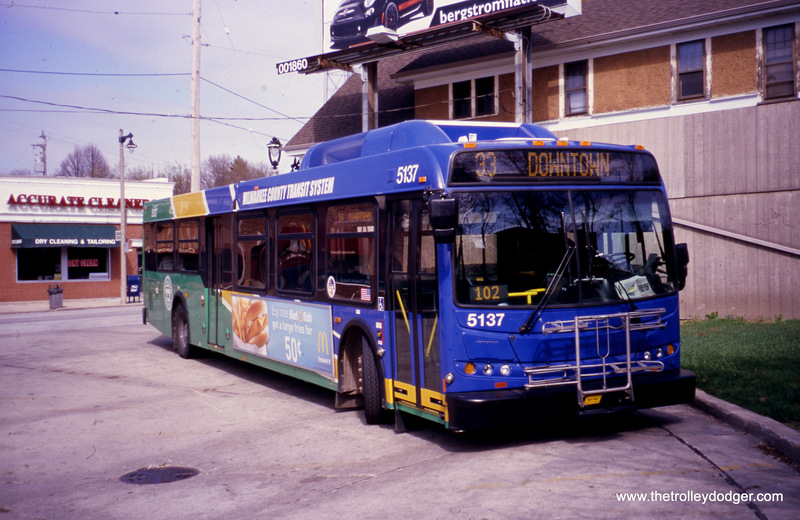 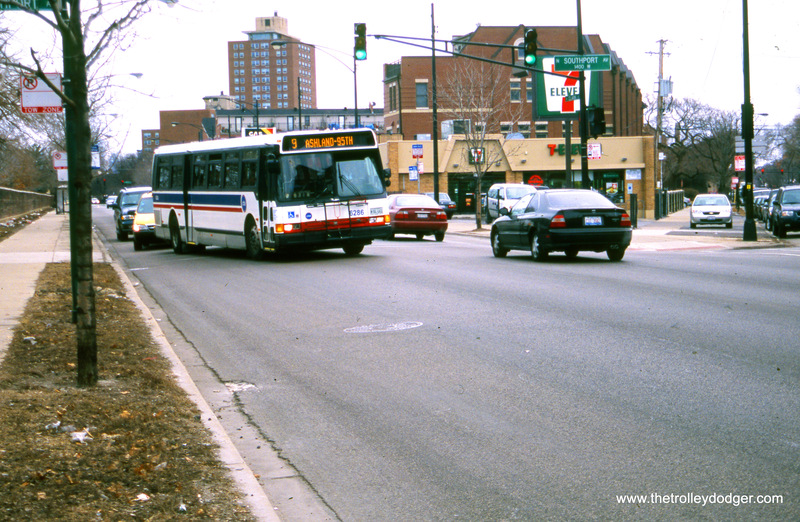 In distance (SW corner of Lake and Austin in Oak Park), a bus working the Chicago & West Towns Lake Street line takes its layover. 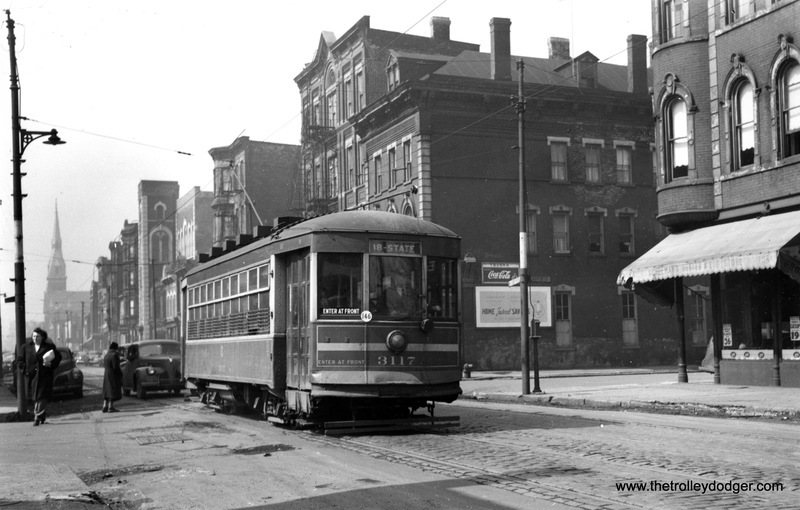 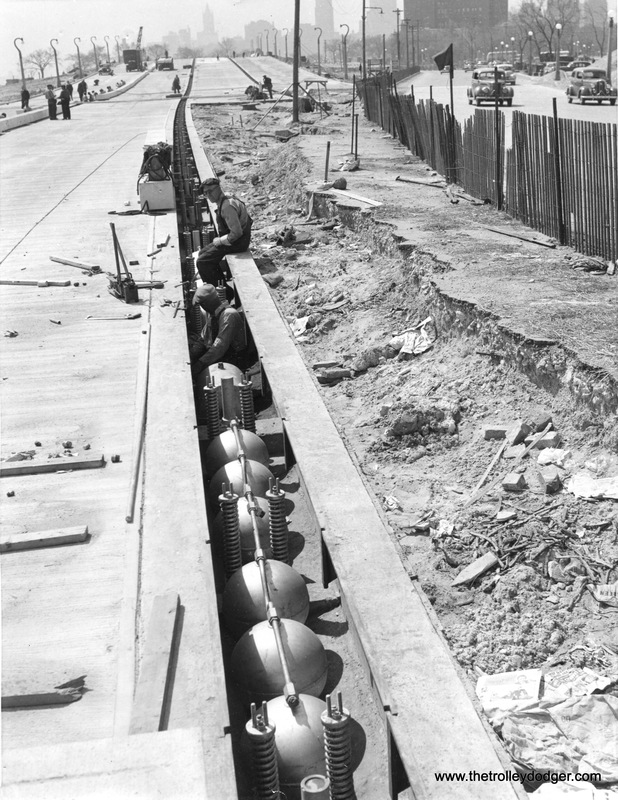 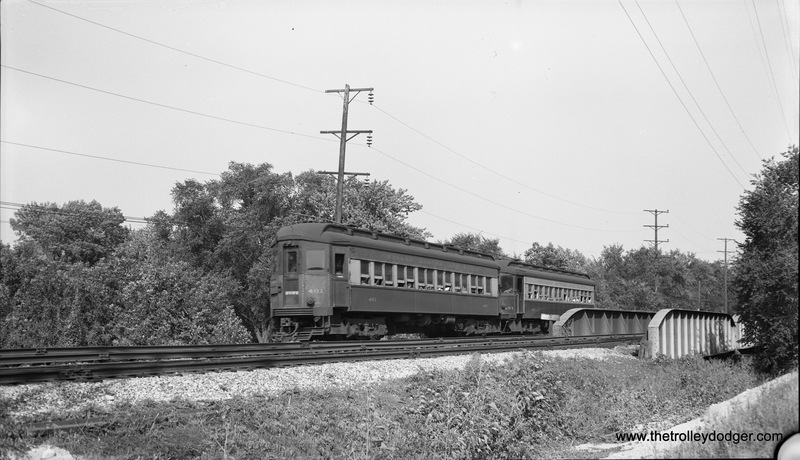 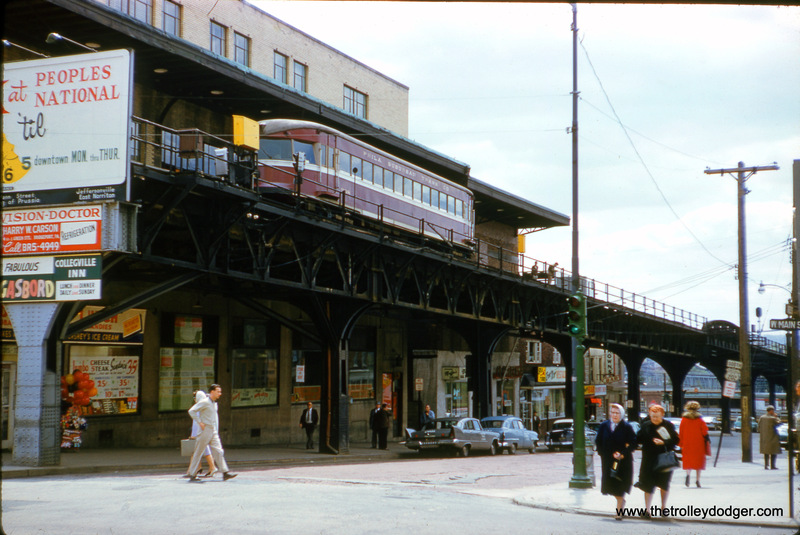 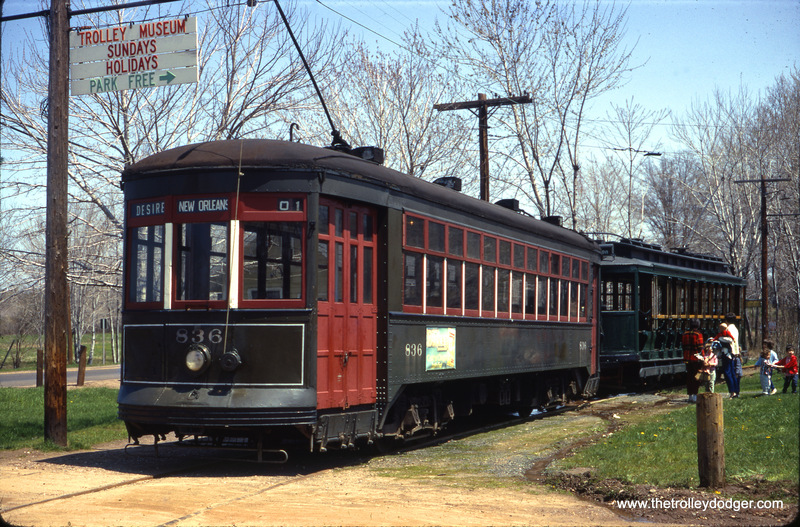 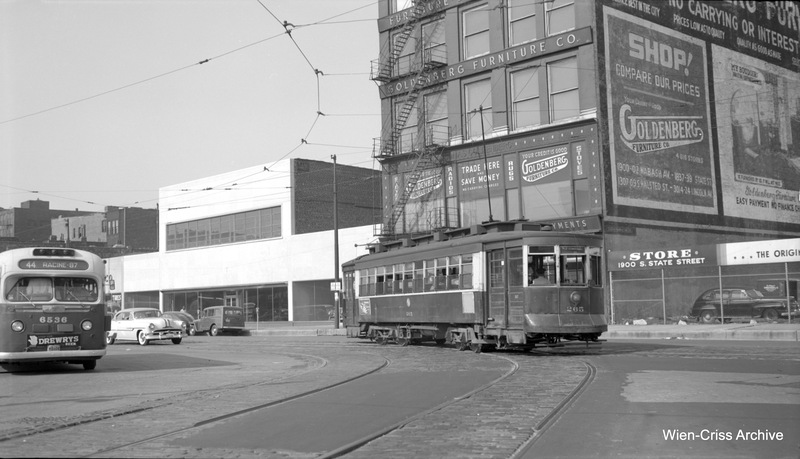 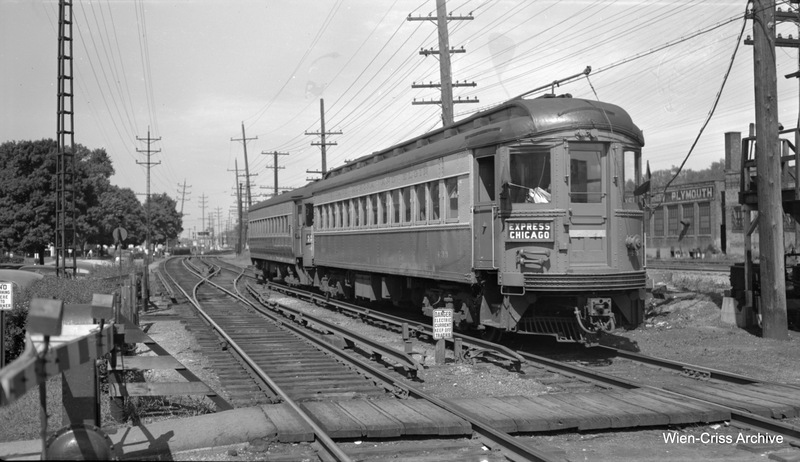 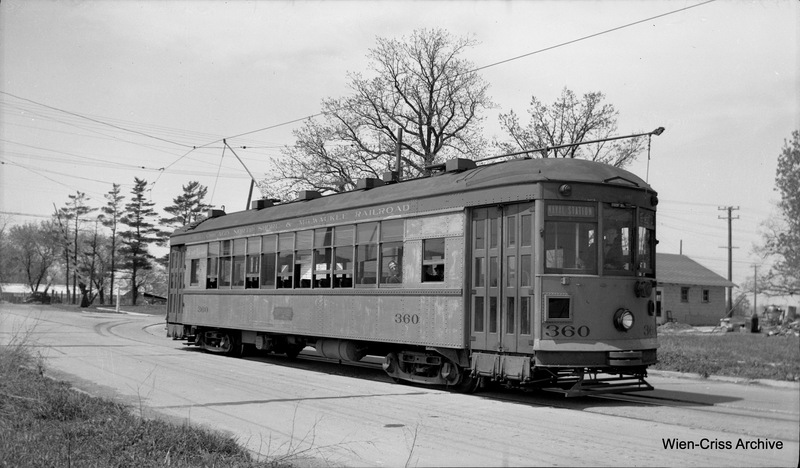 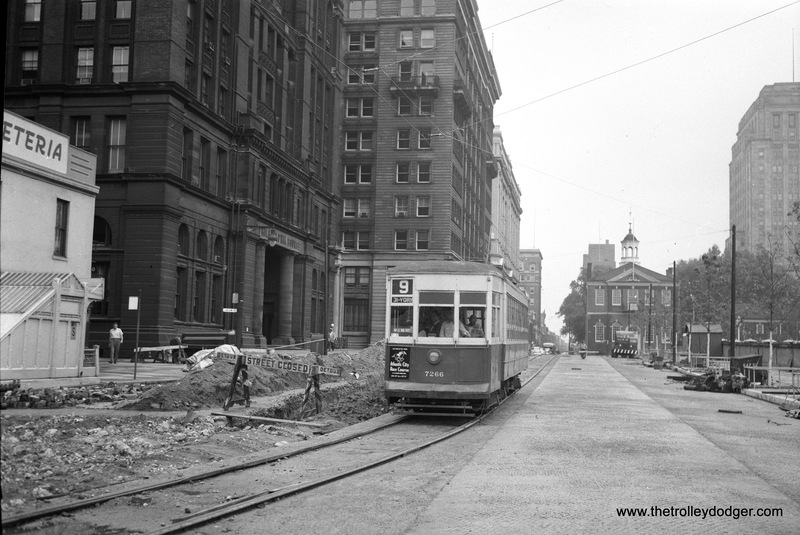 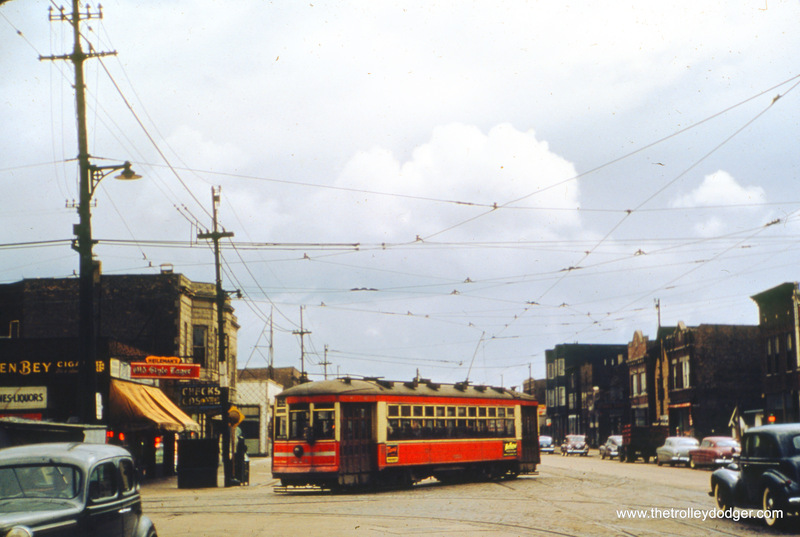 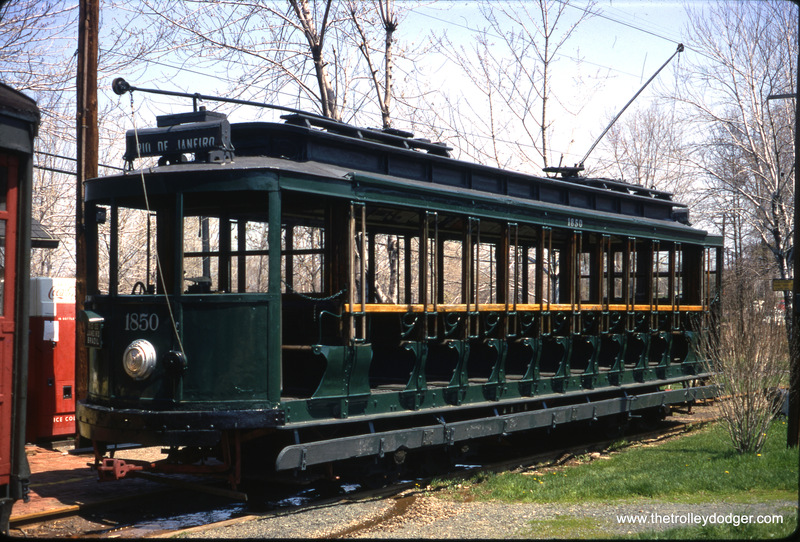 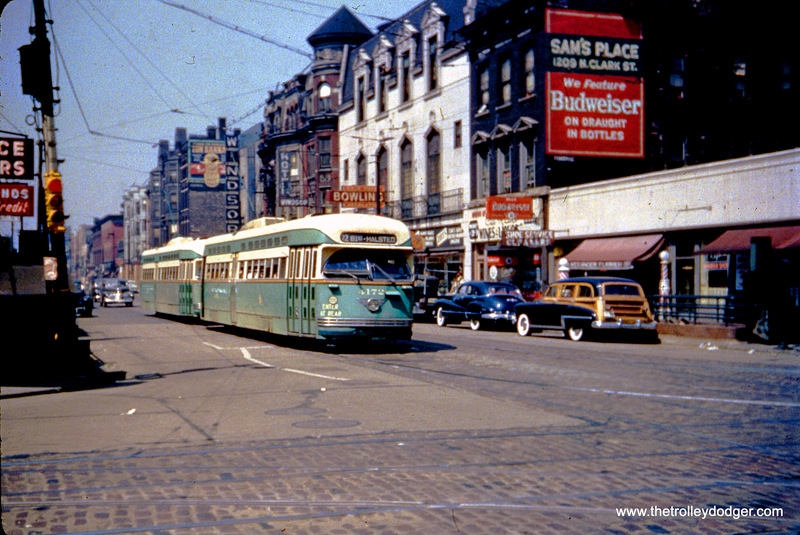 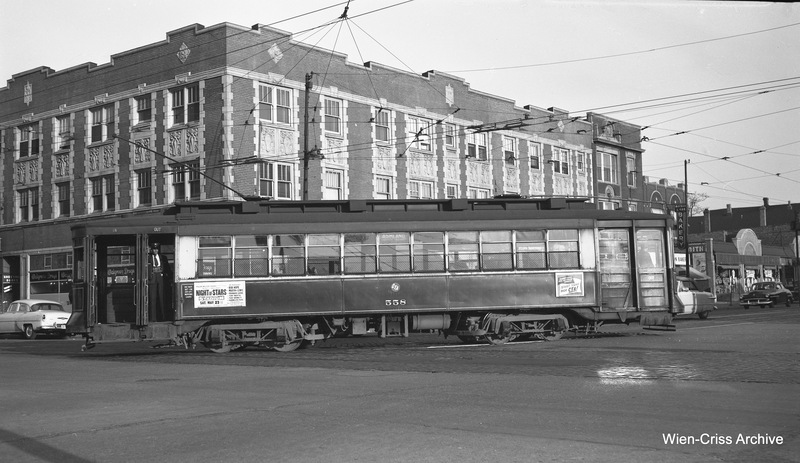 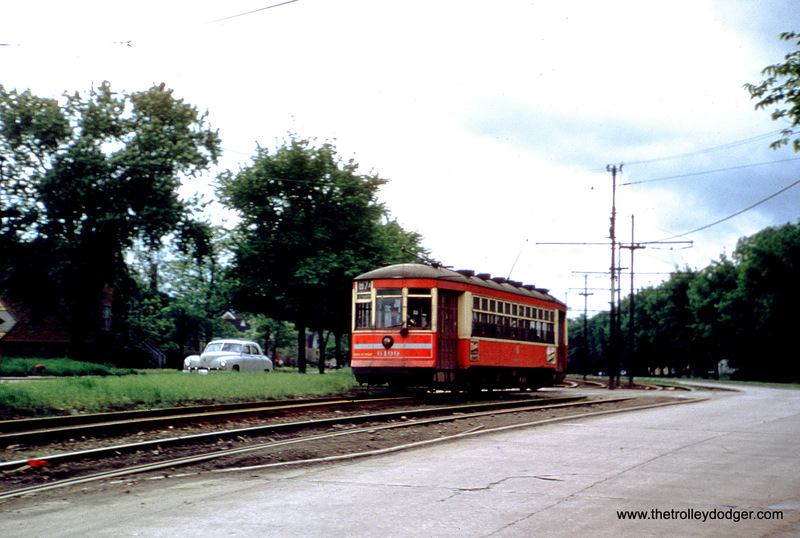 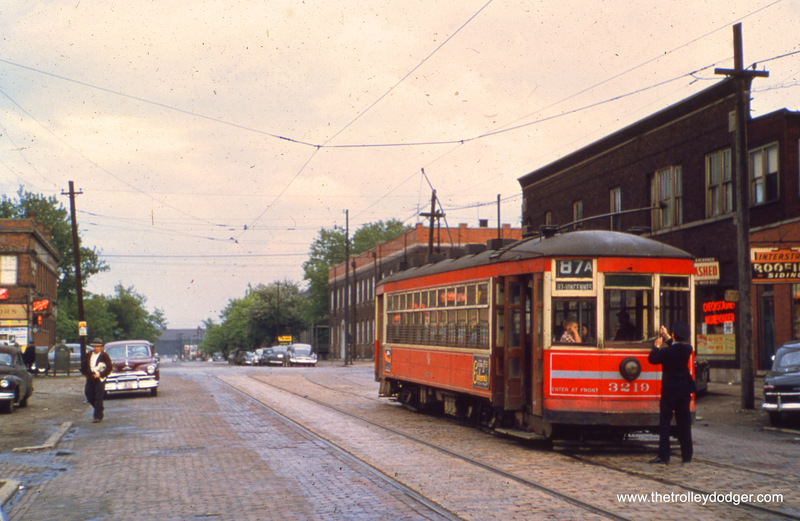 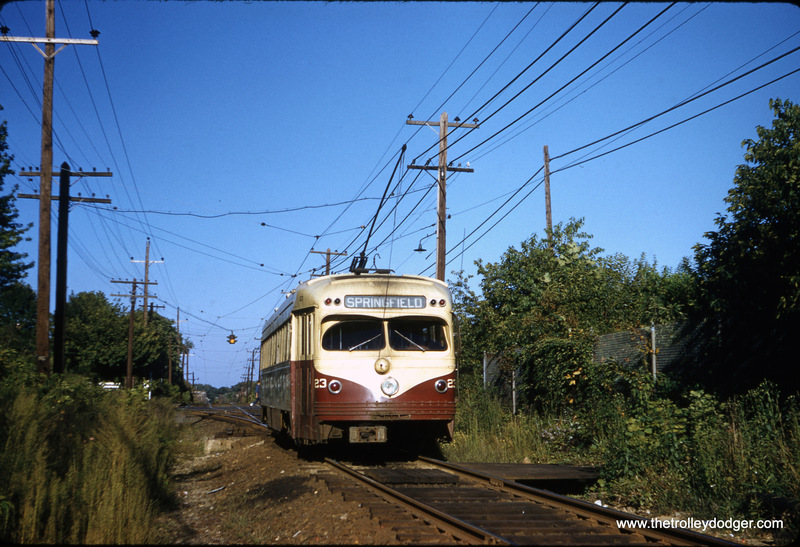 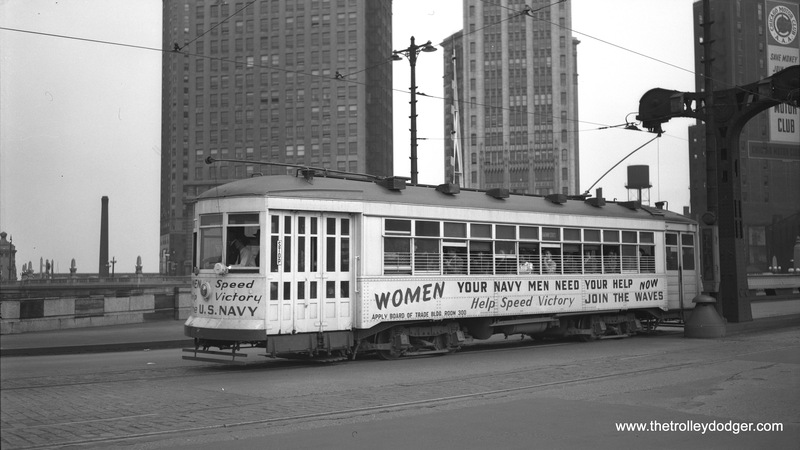 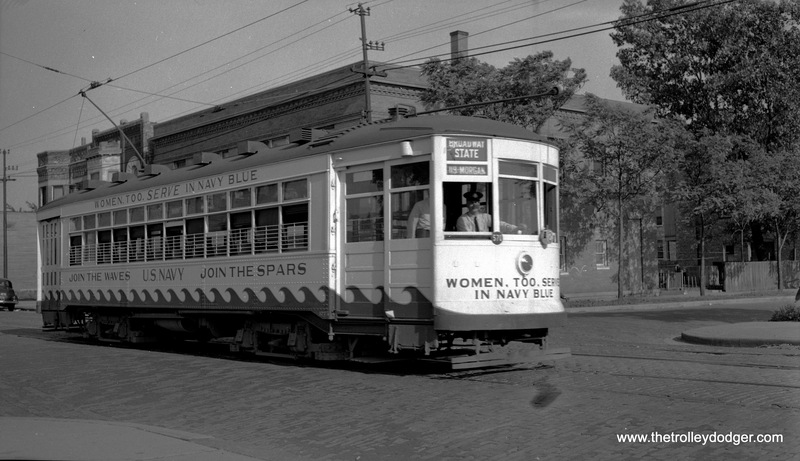 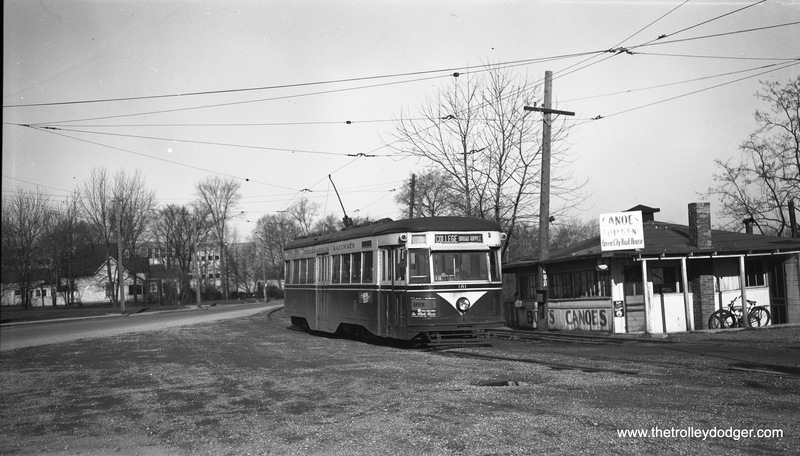 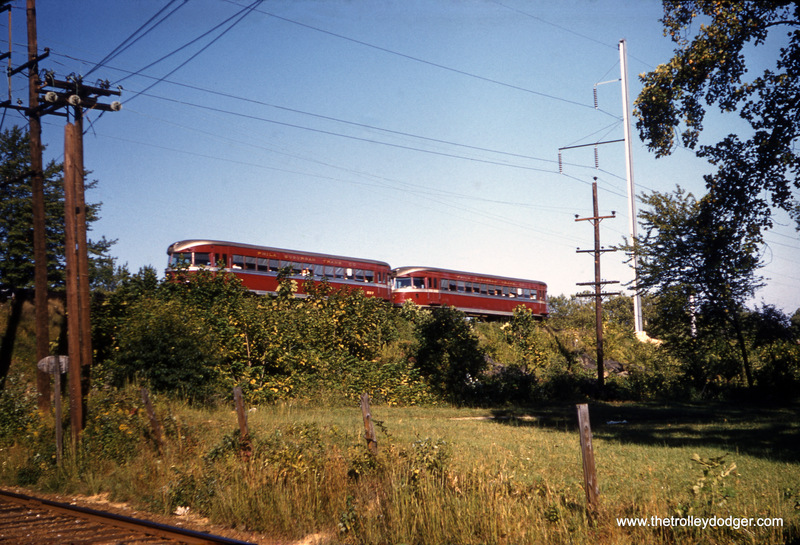 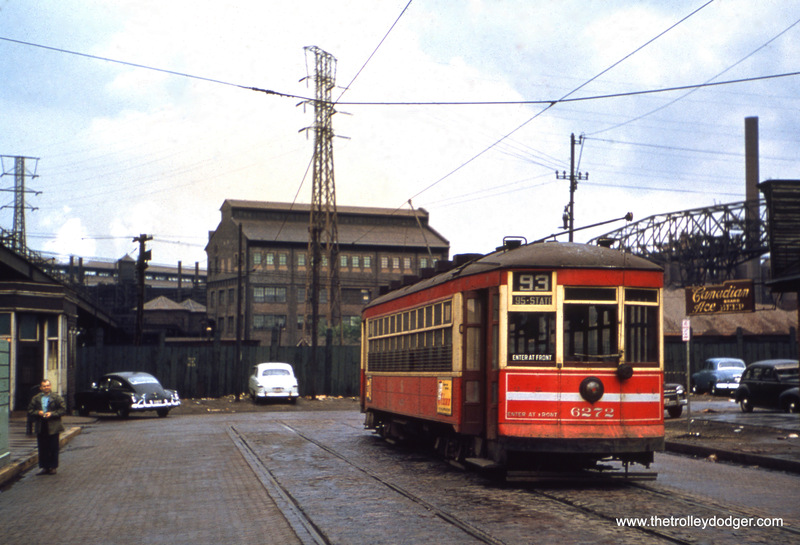 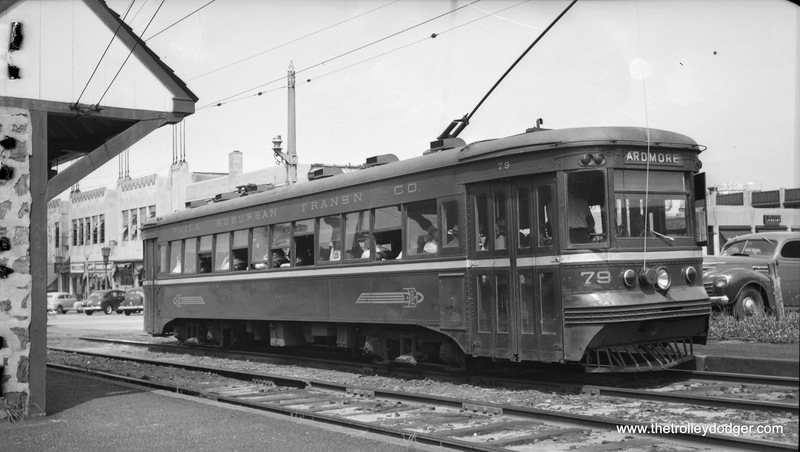 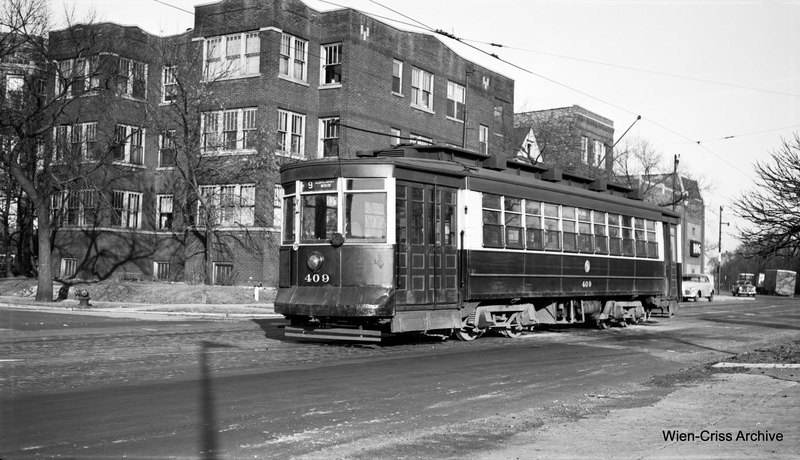 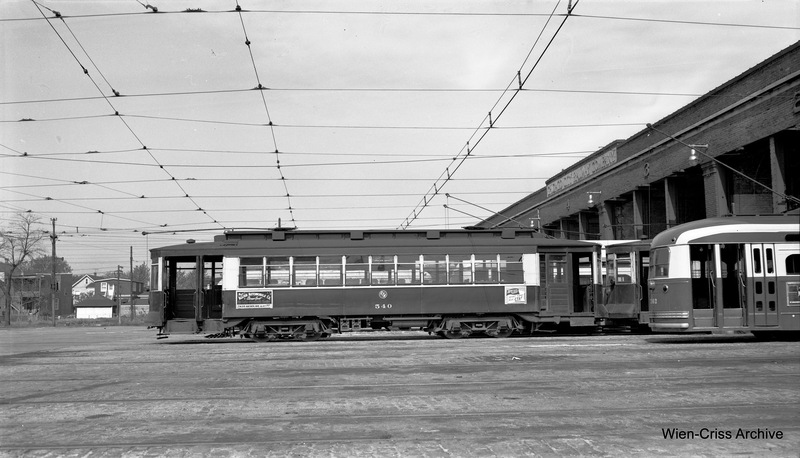 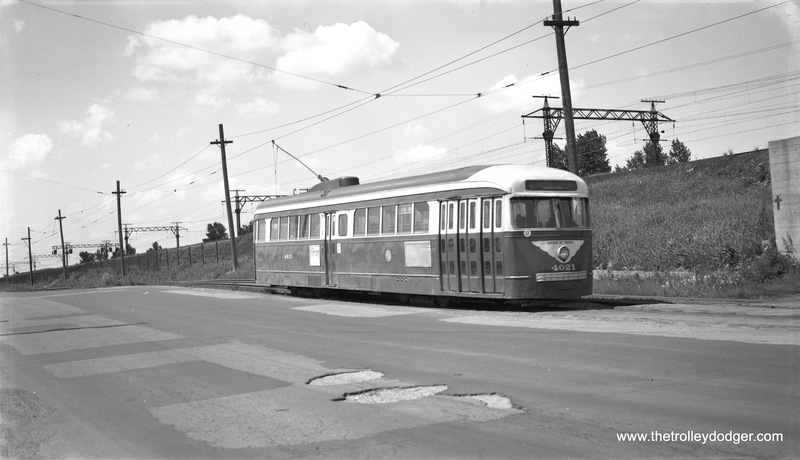 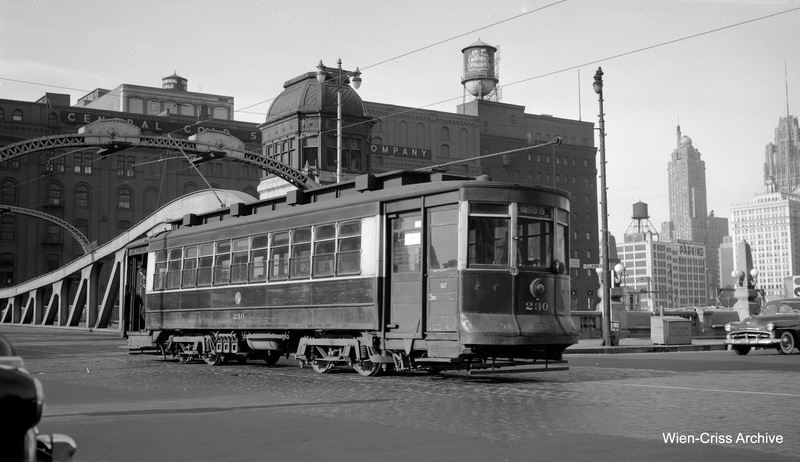 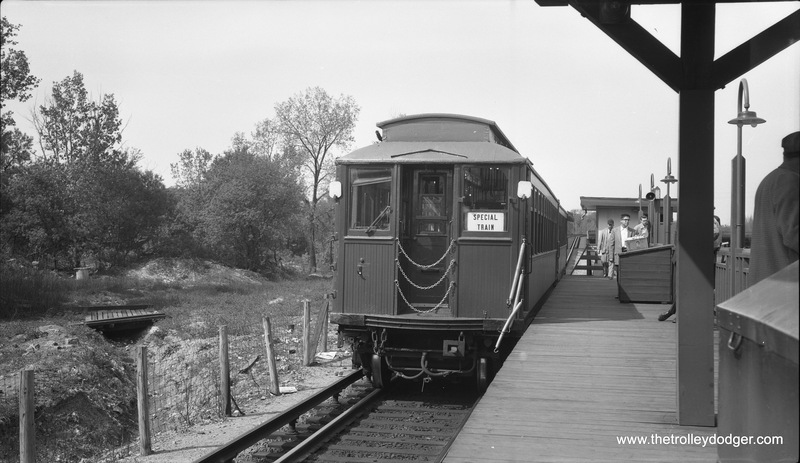 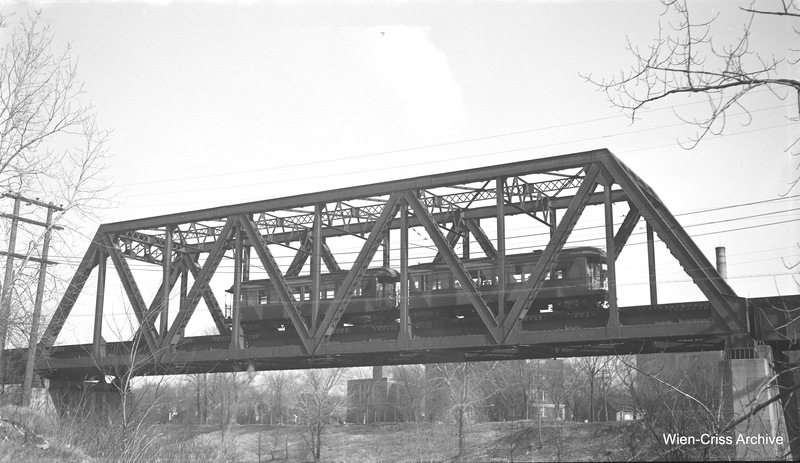 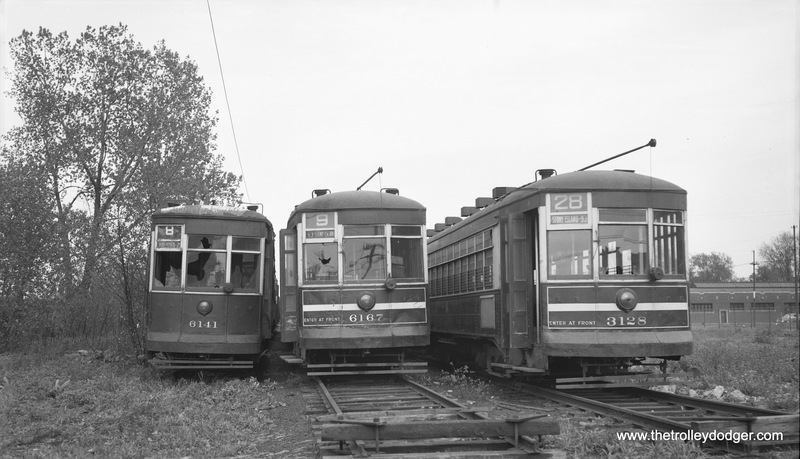 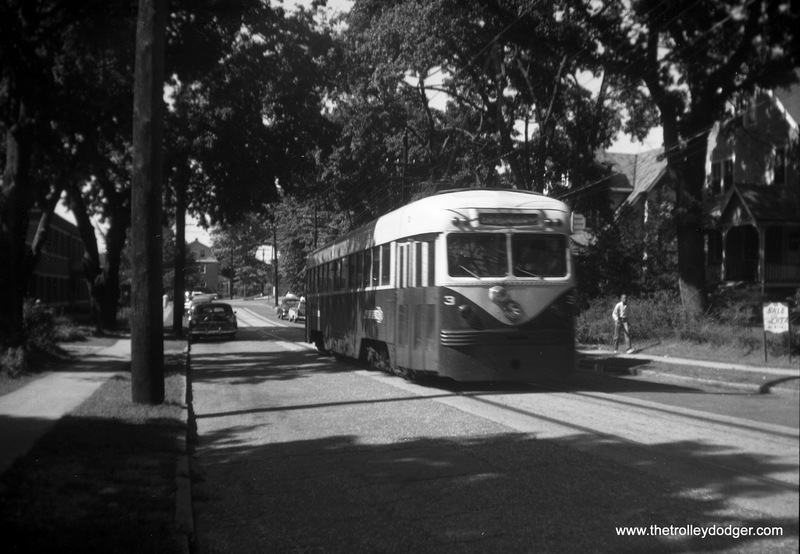 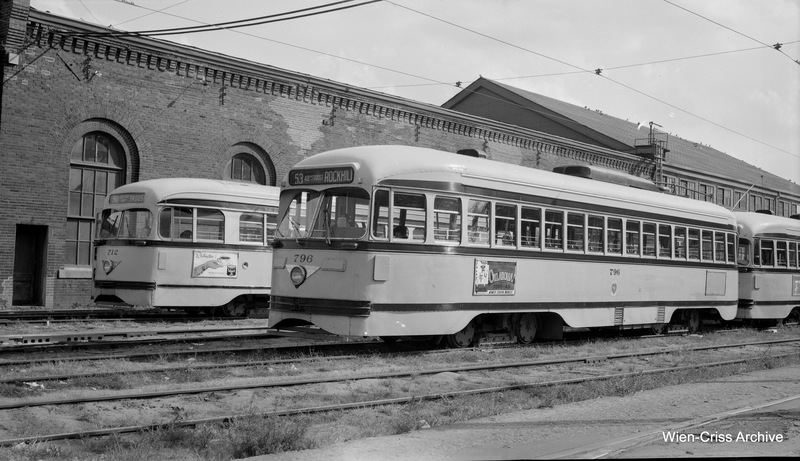 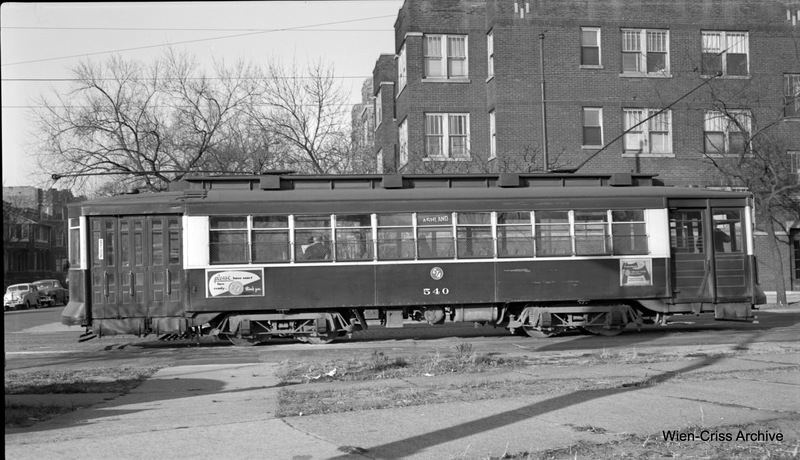 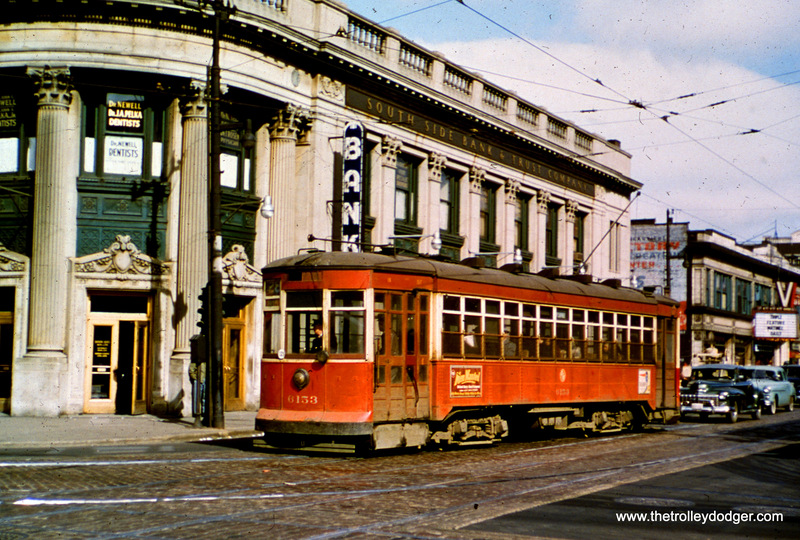 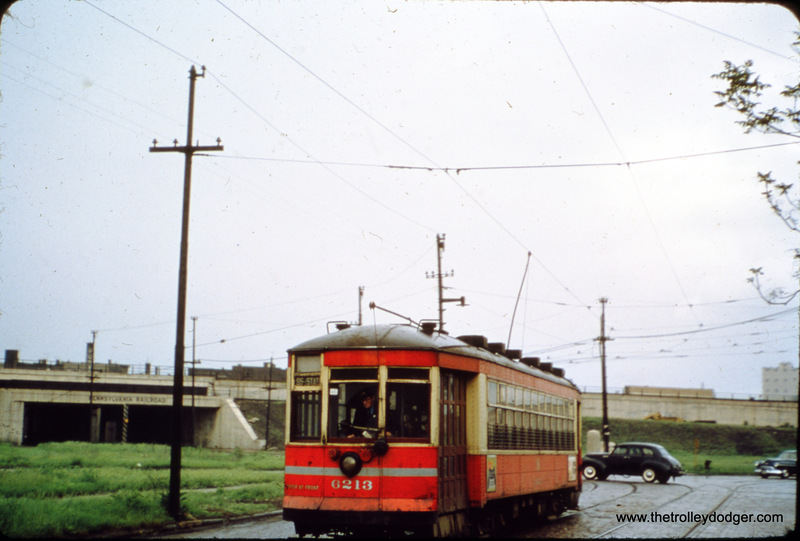 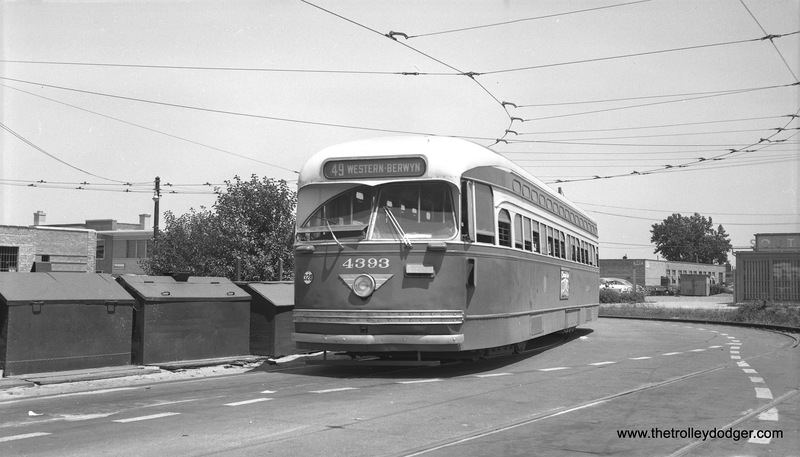 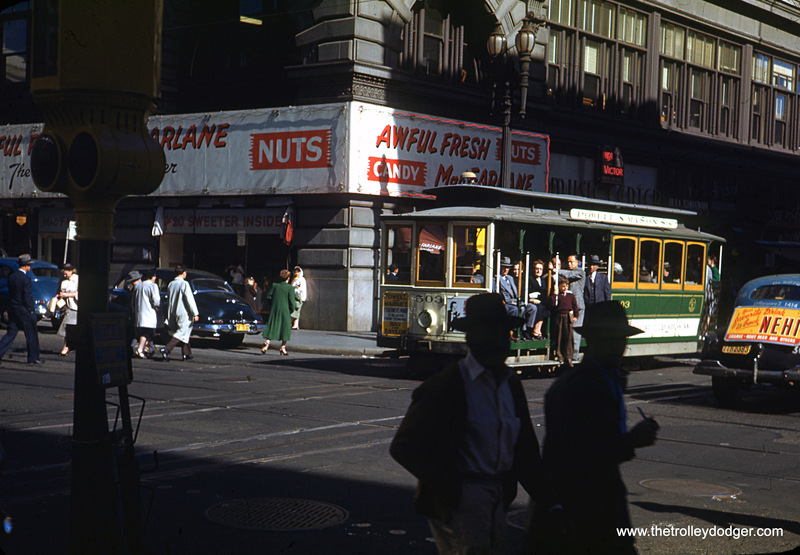 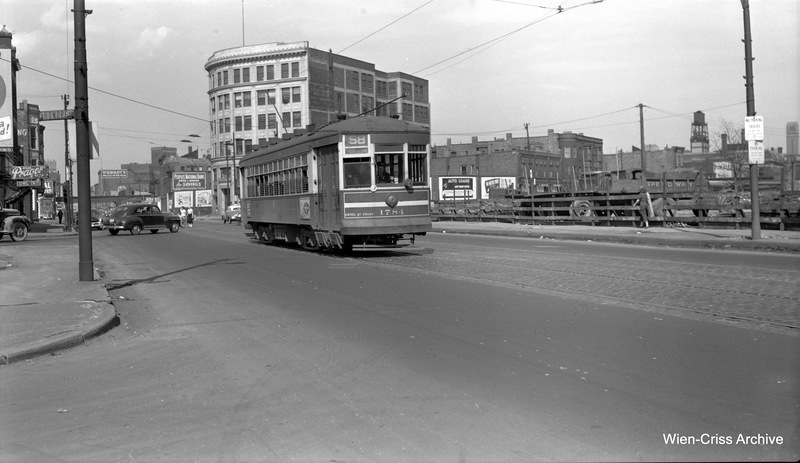 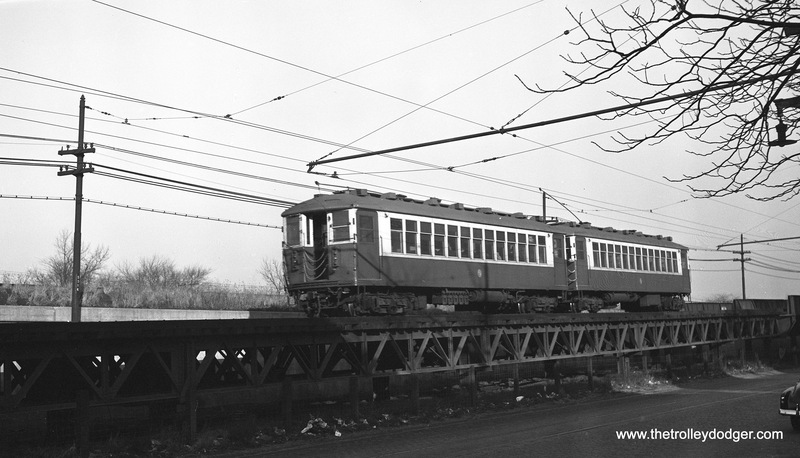 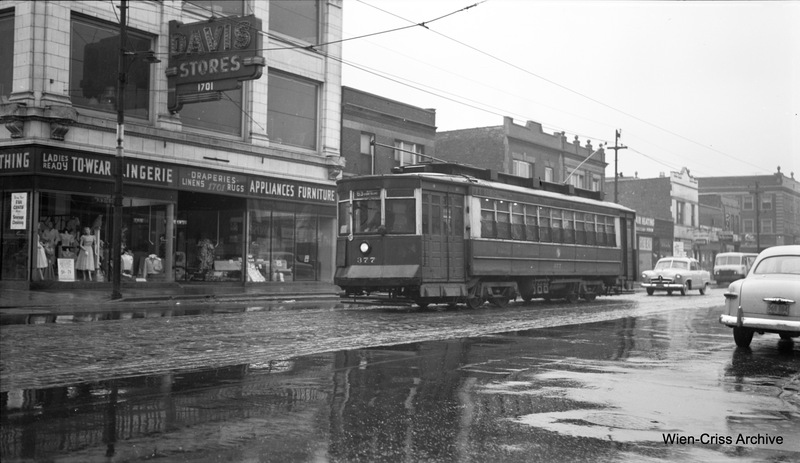 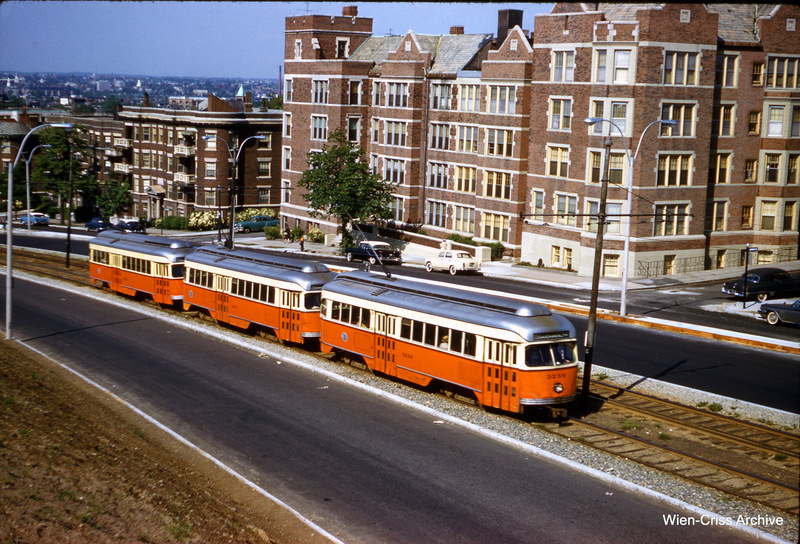 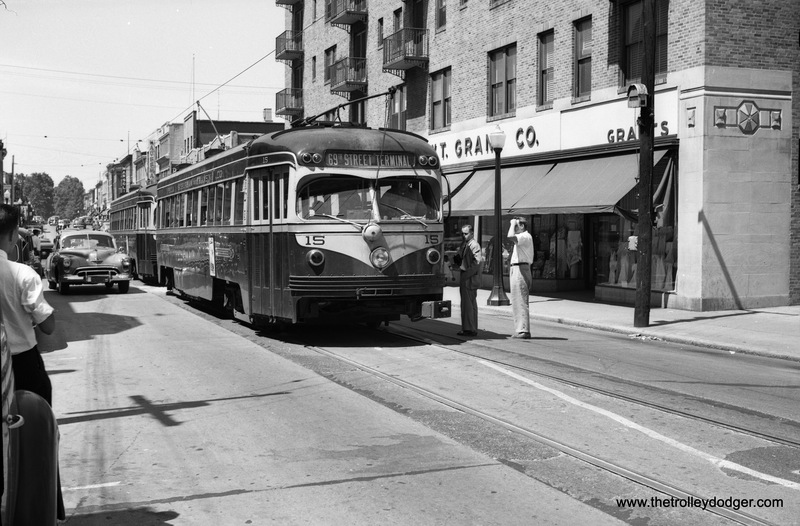 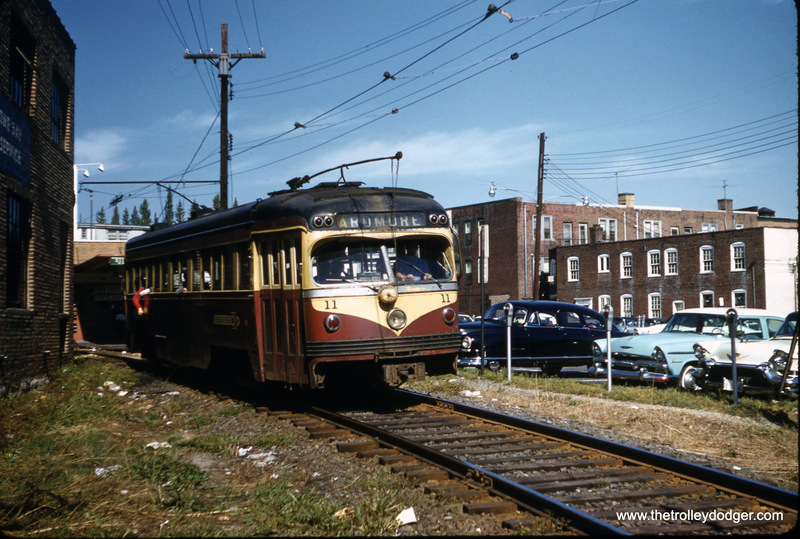 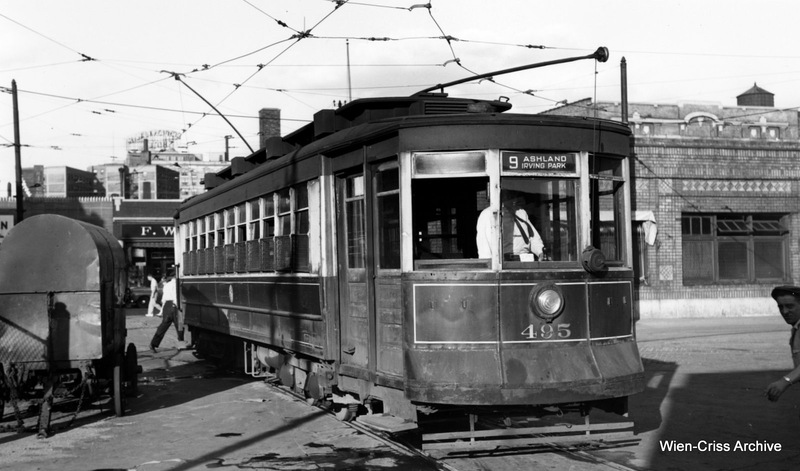 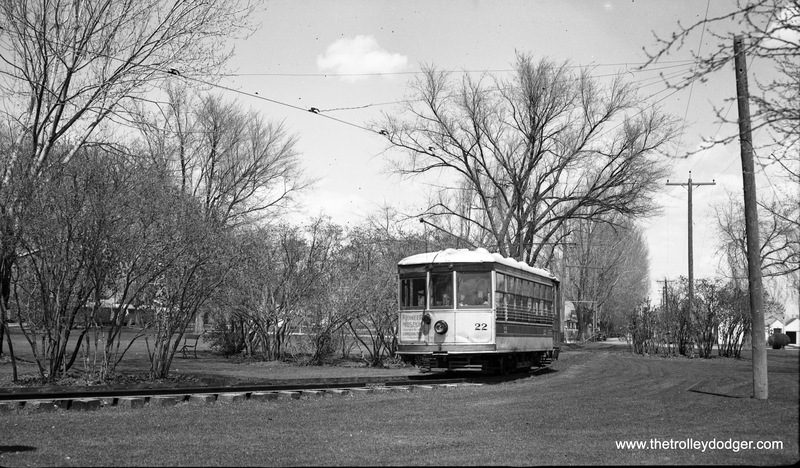 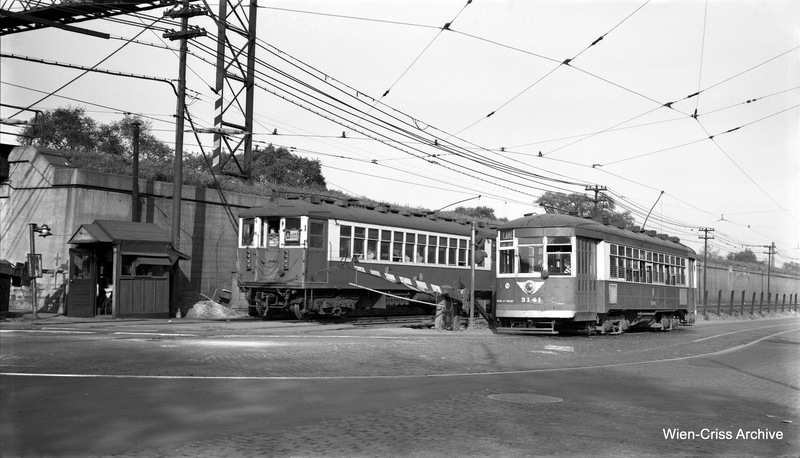 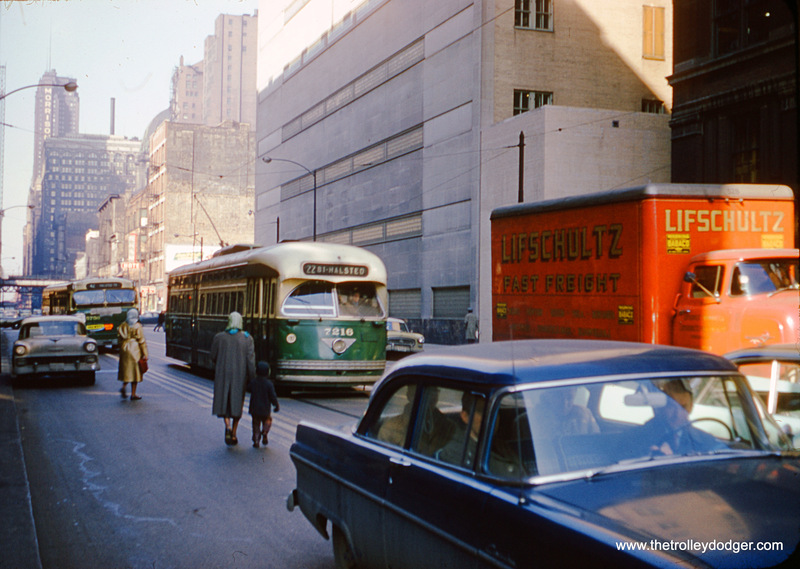 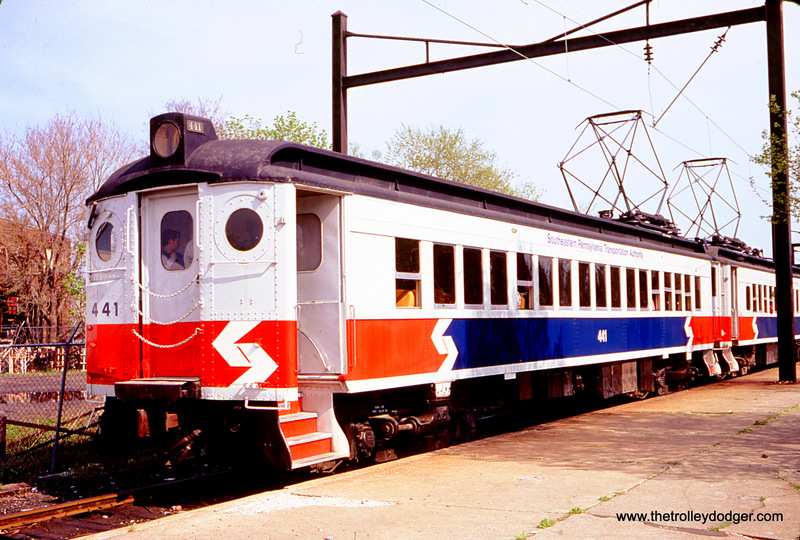 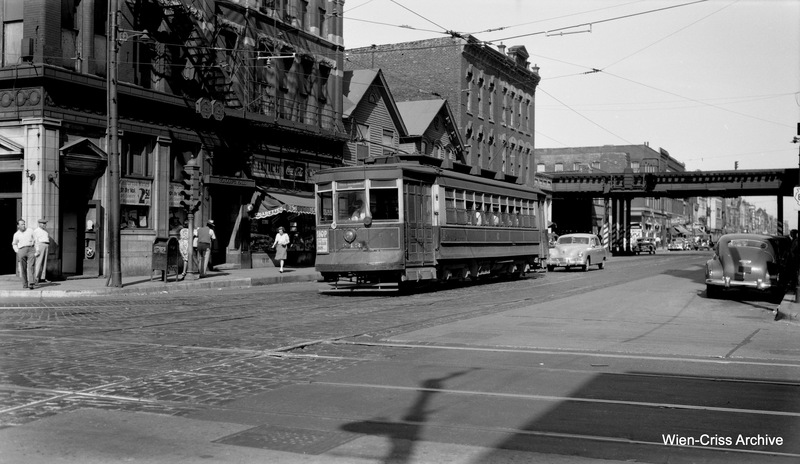 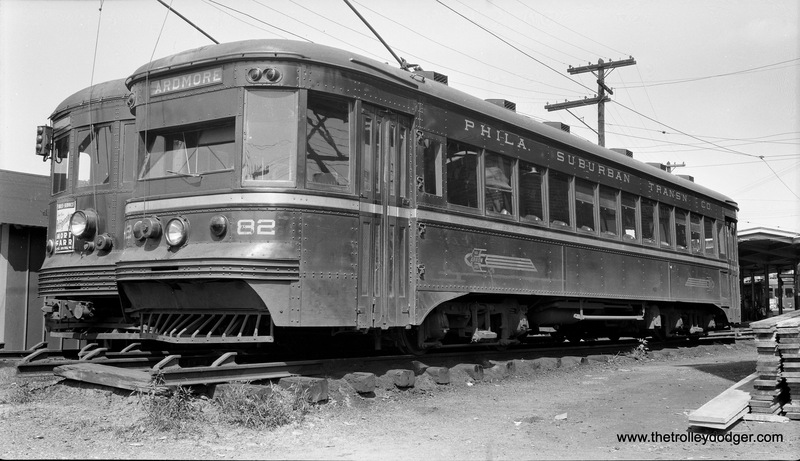 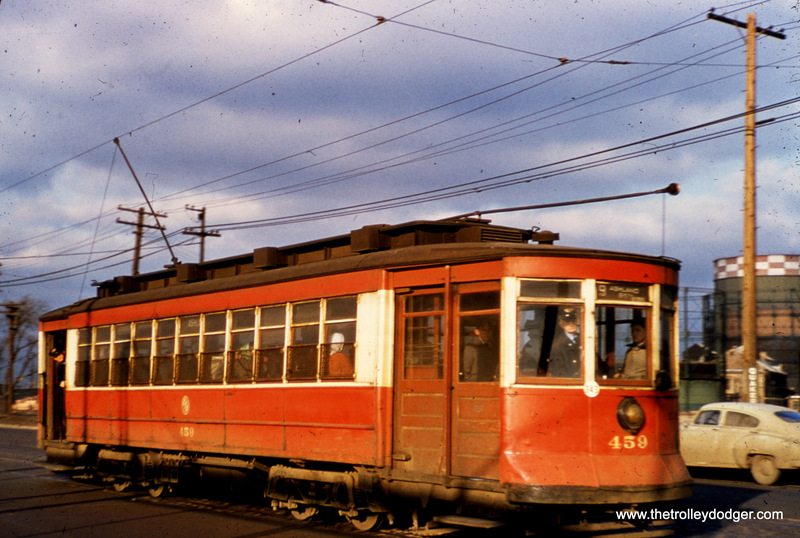 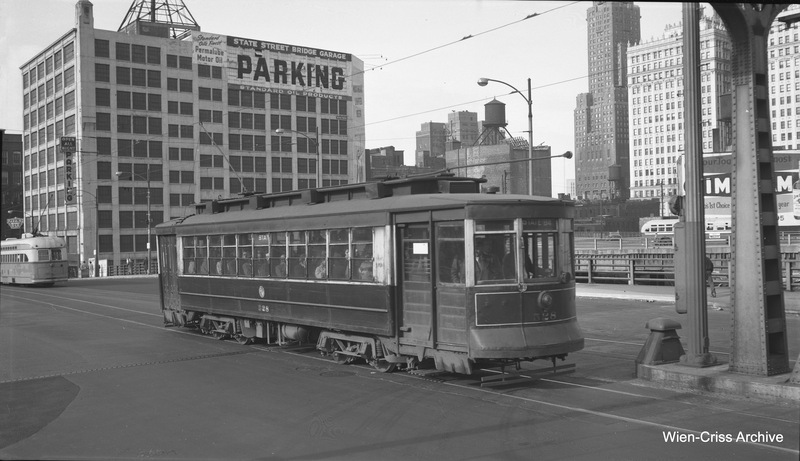 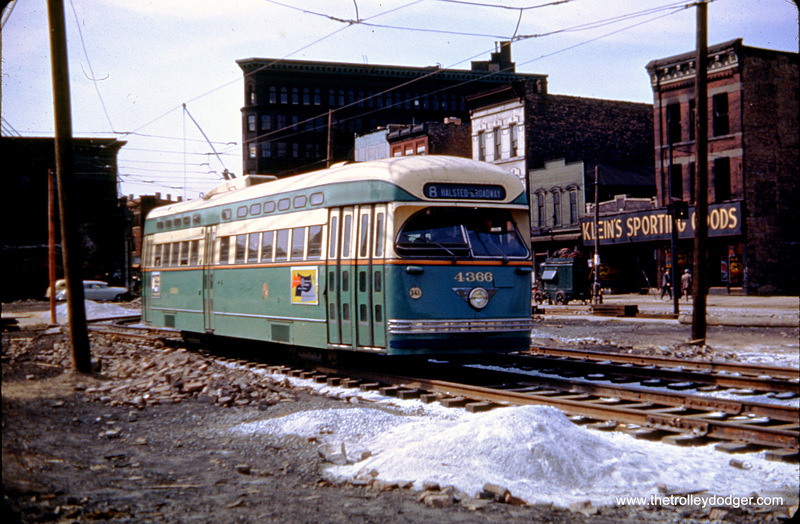 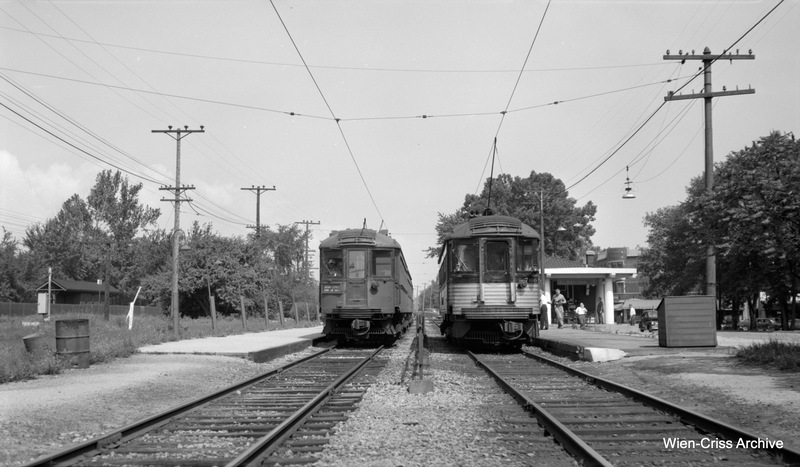 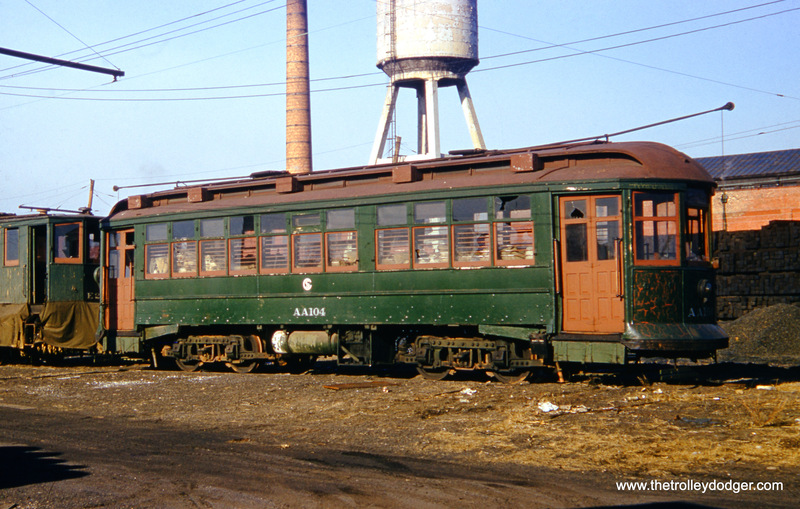 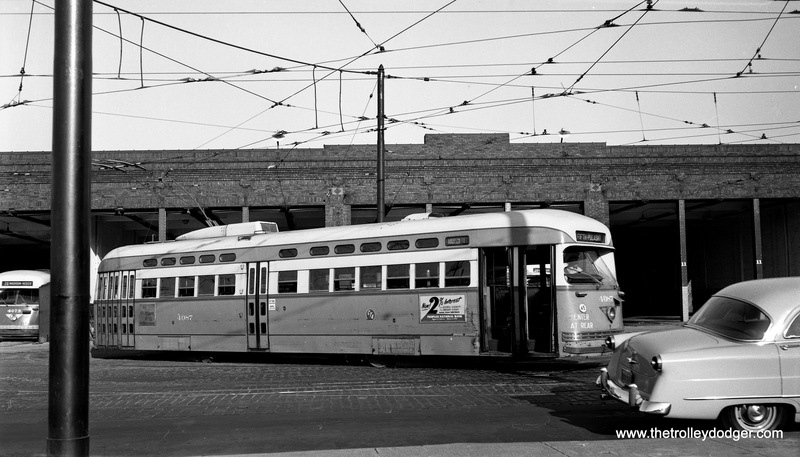 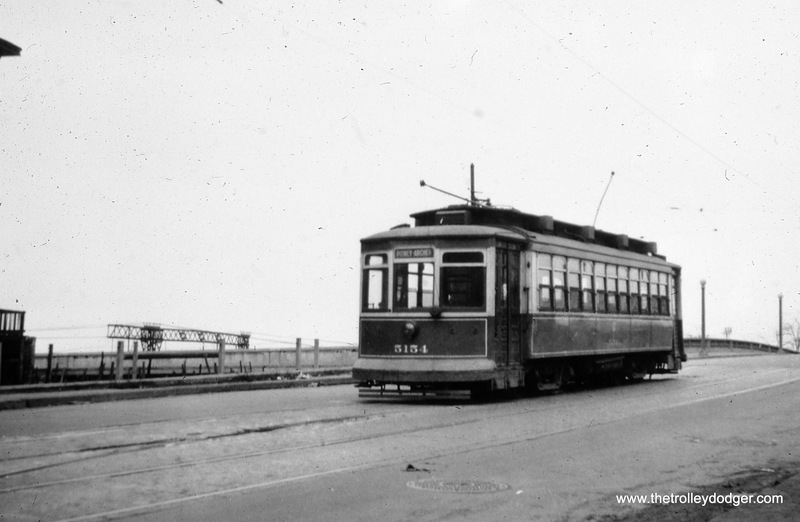 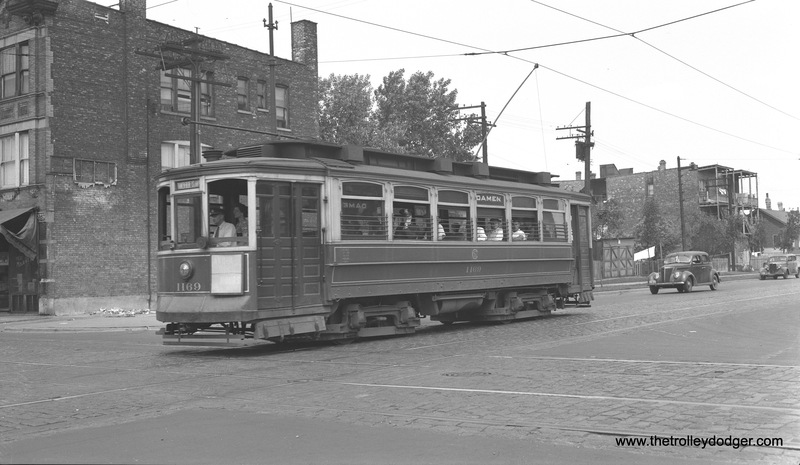 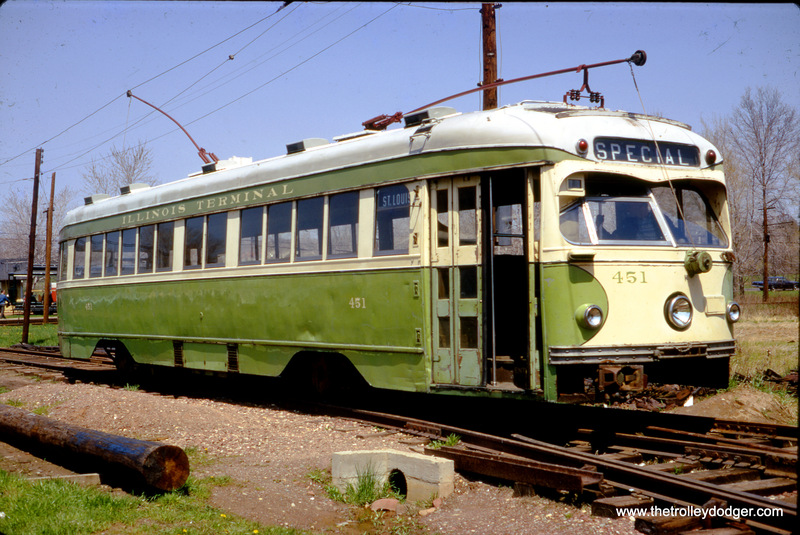 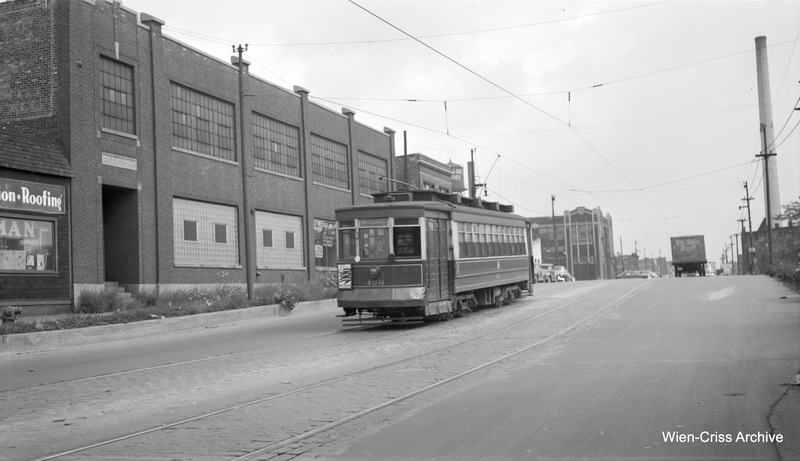 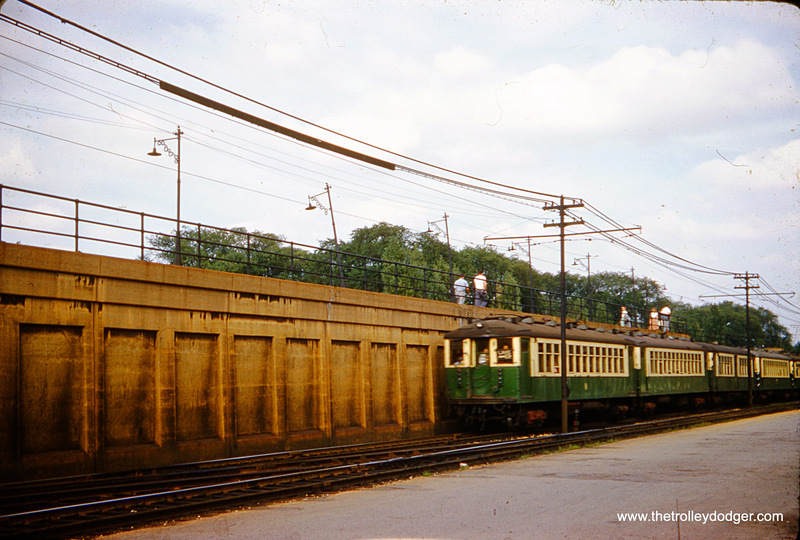 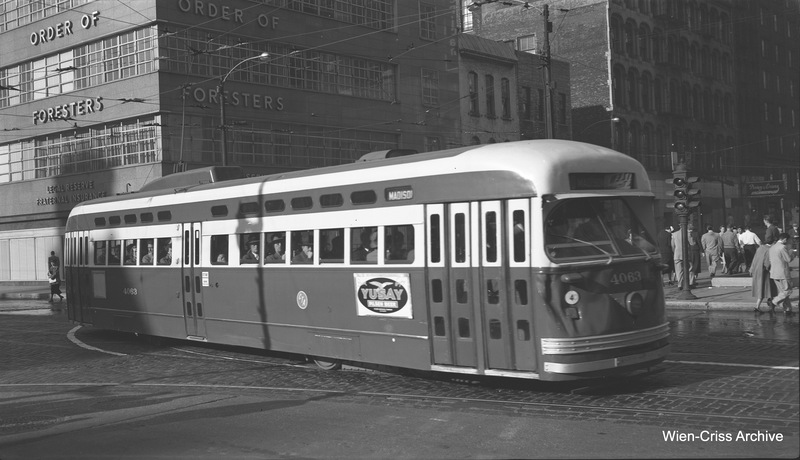 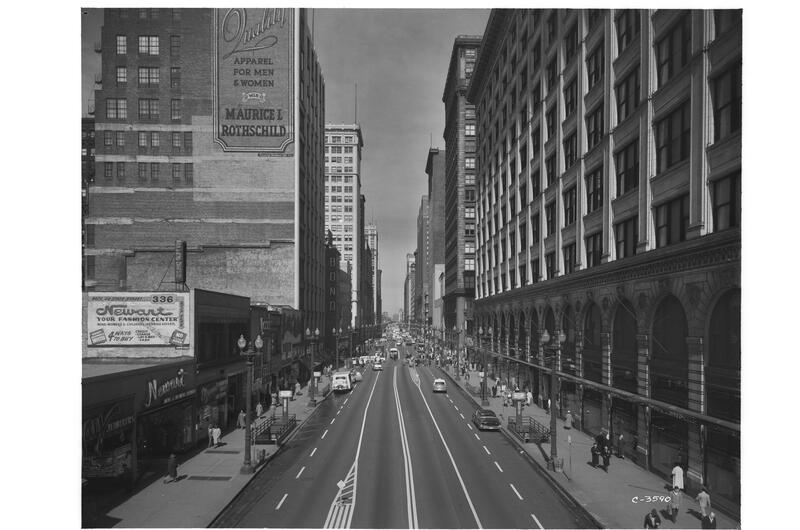 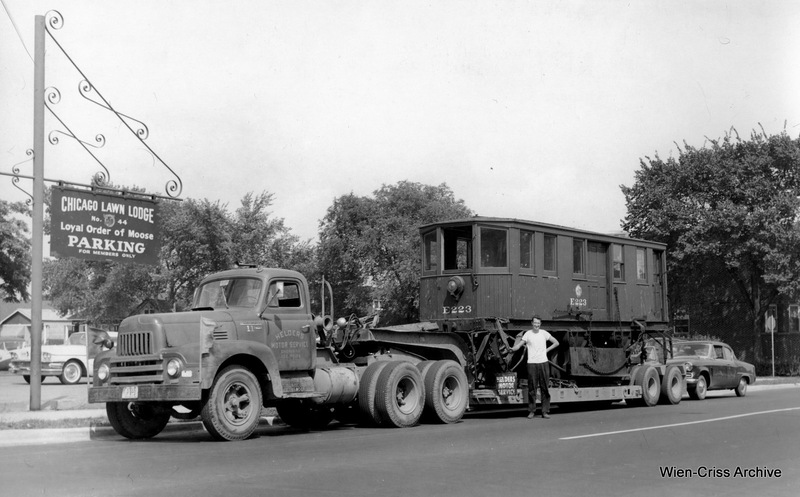 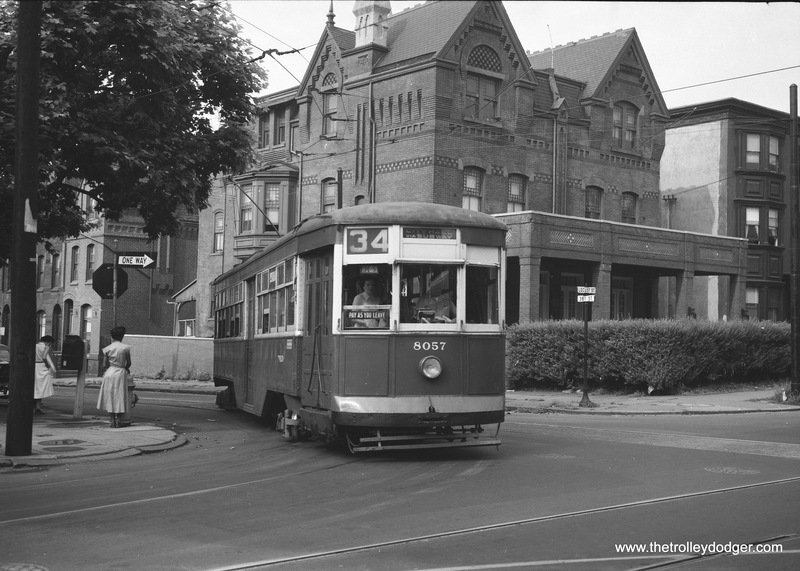 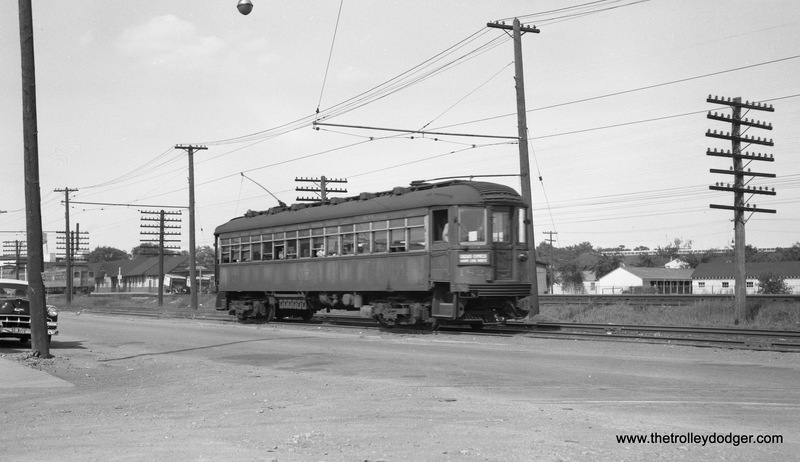 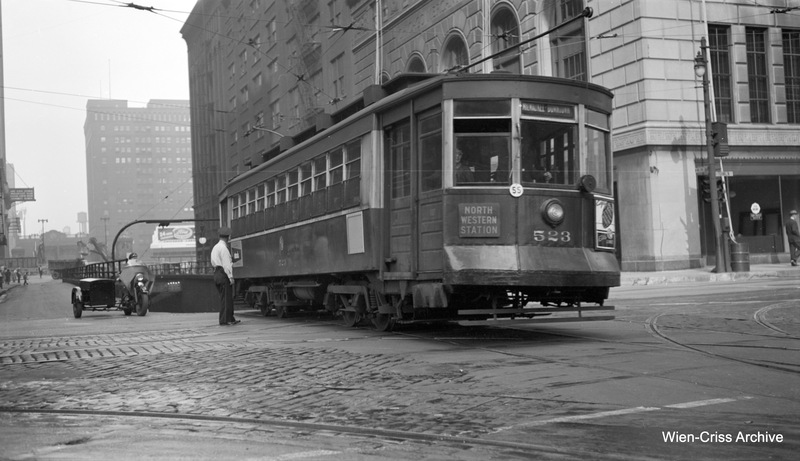 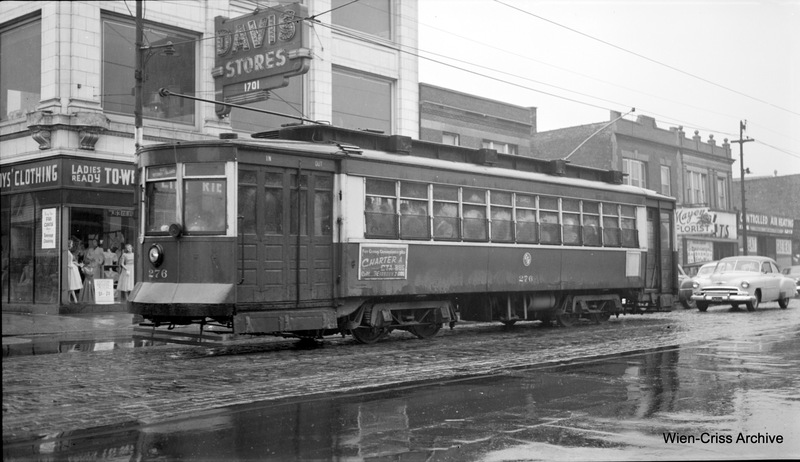 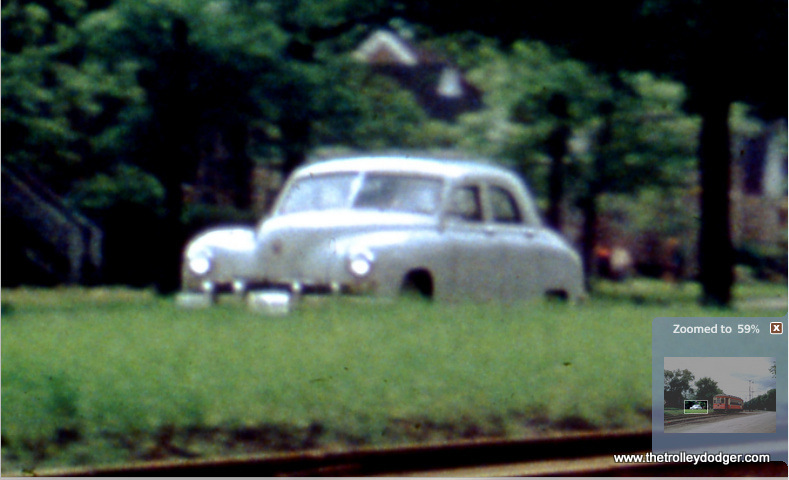 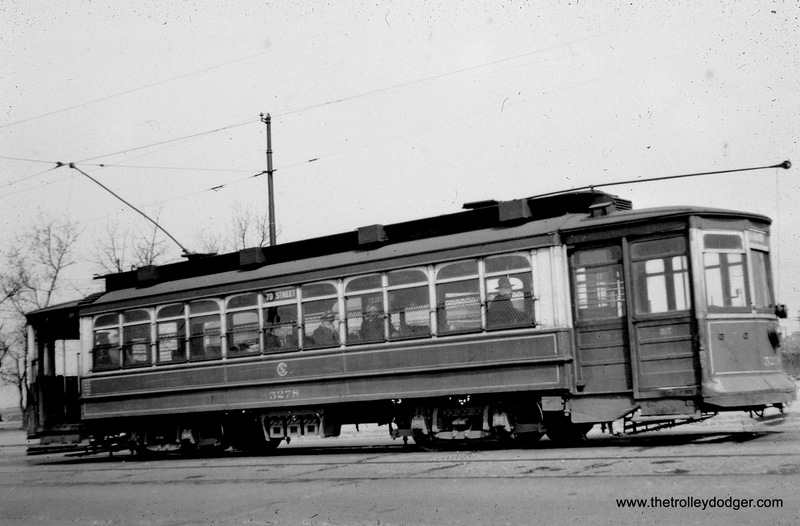 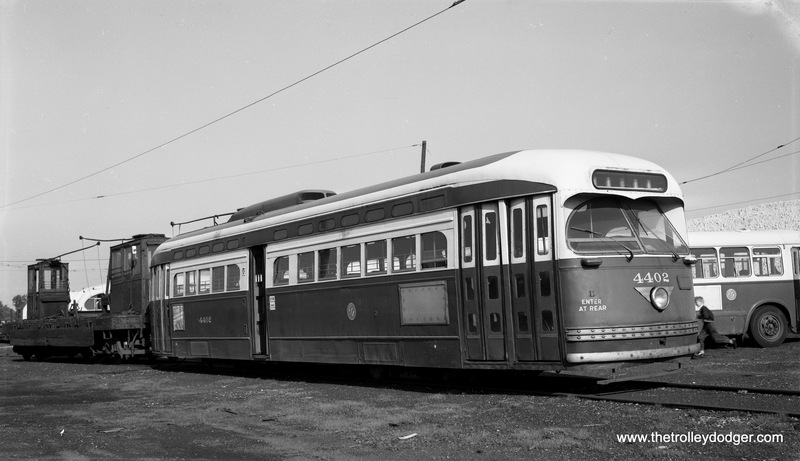 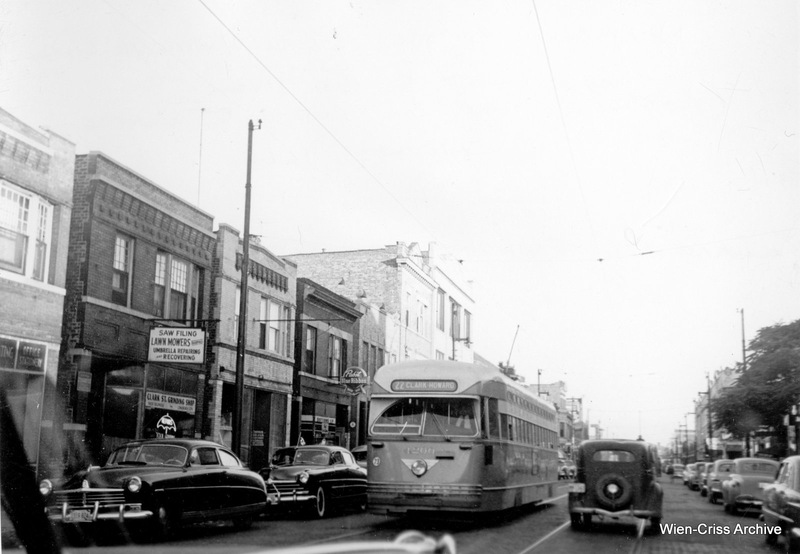 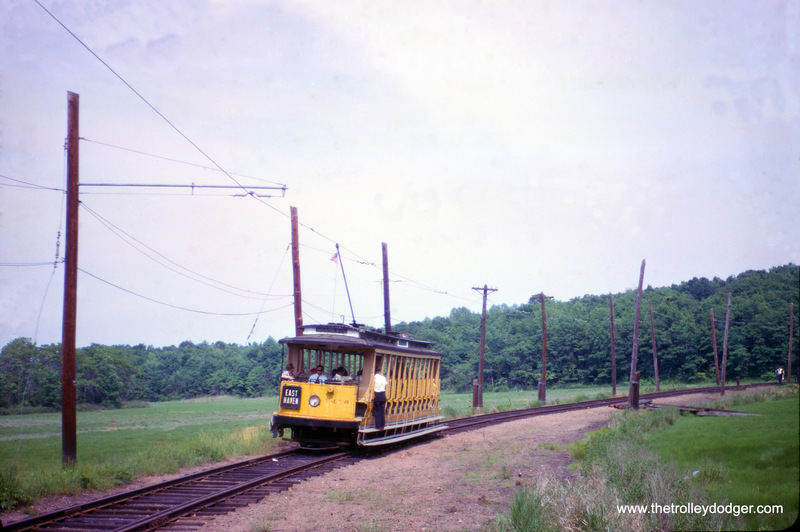 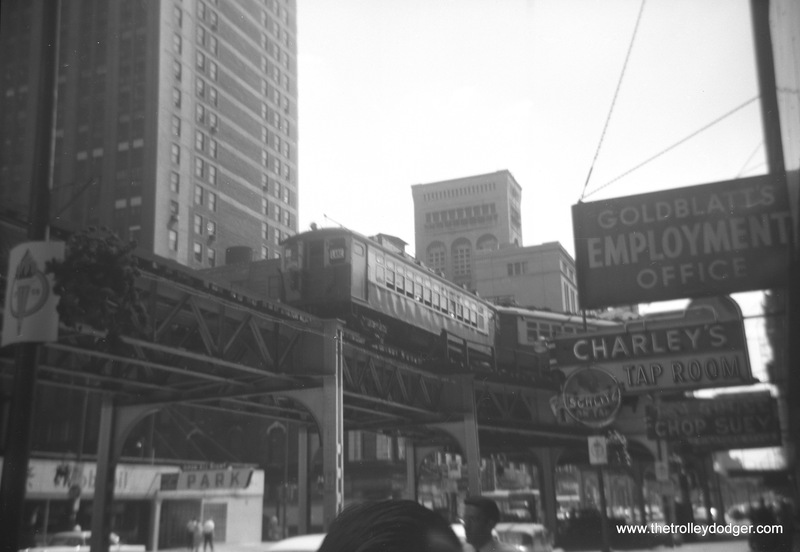 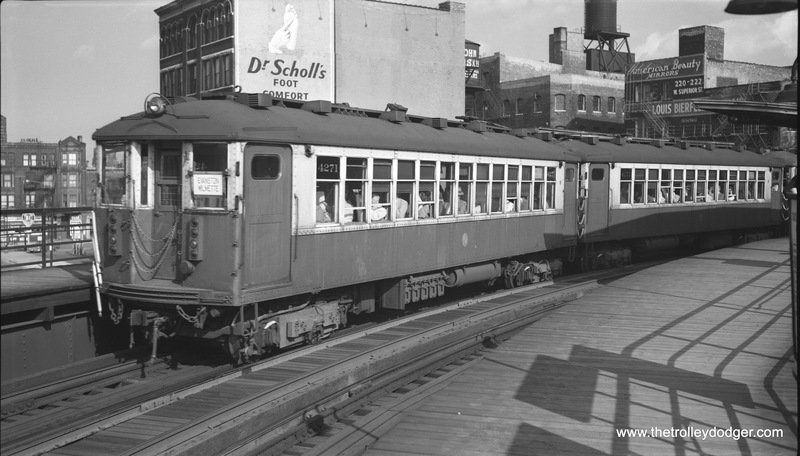 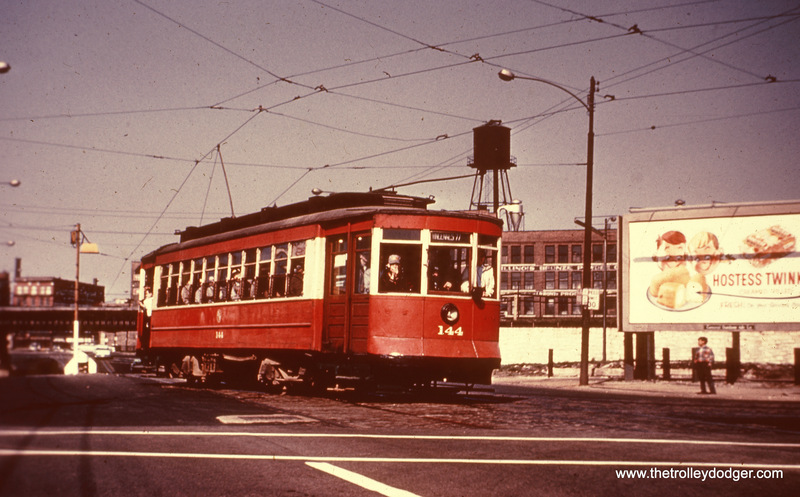 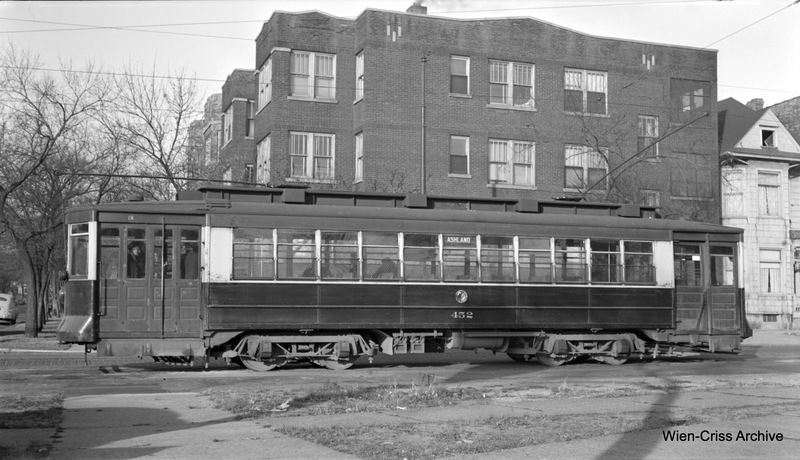 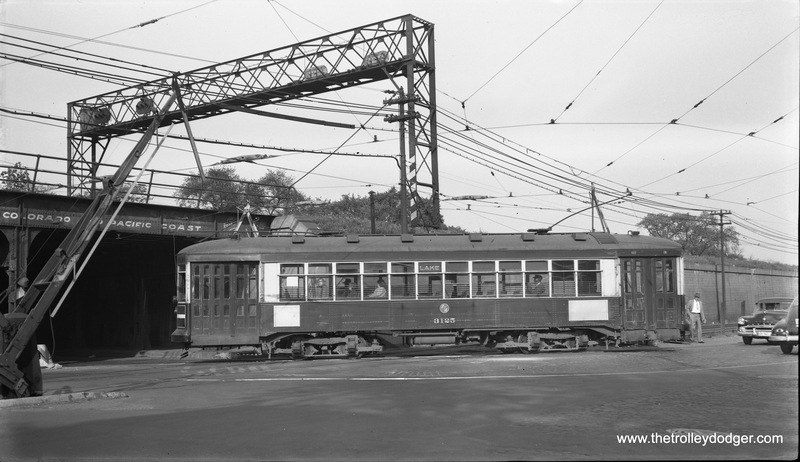 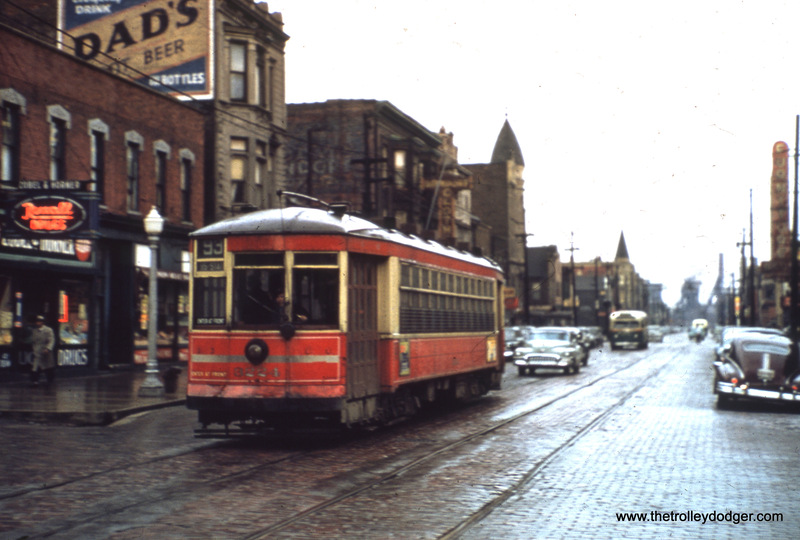 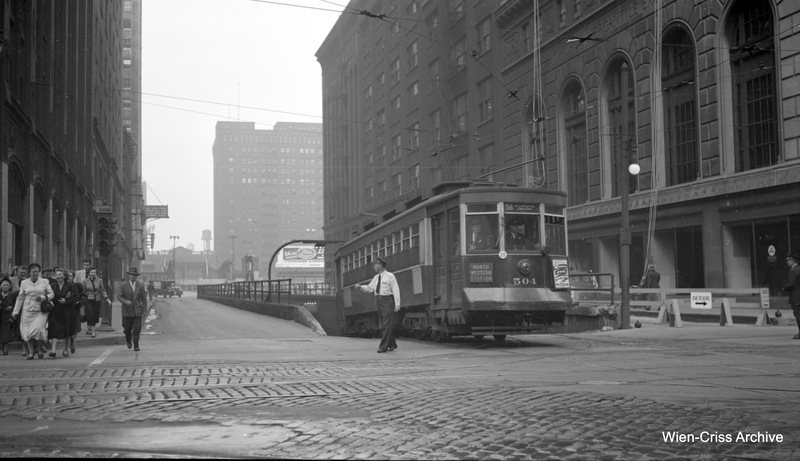 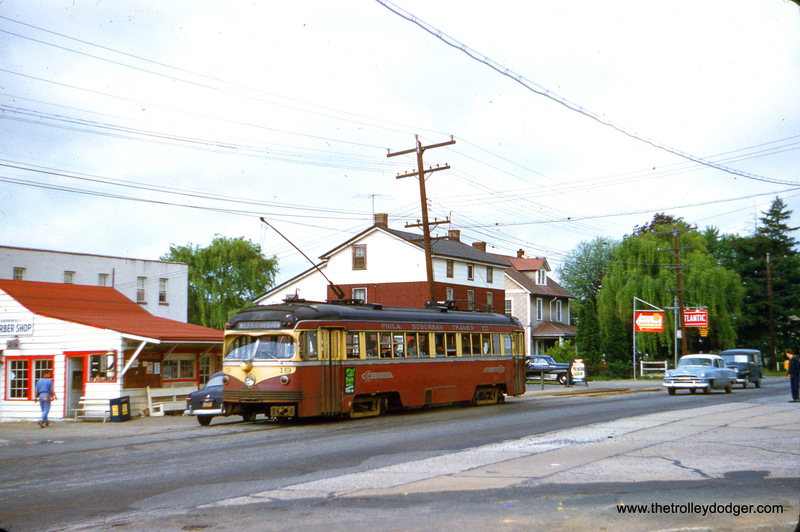 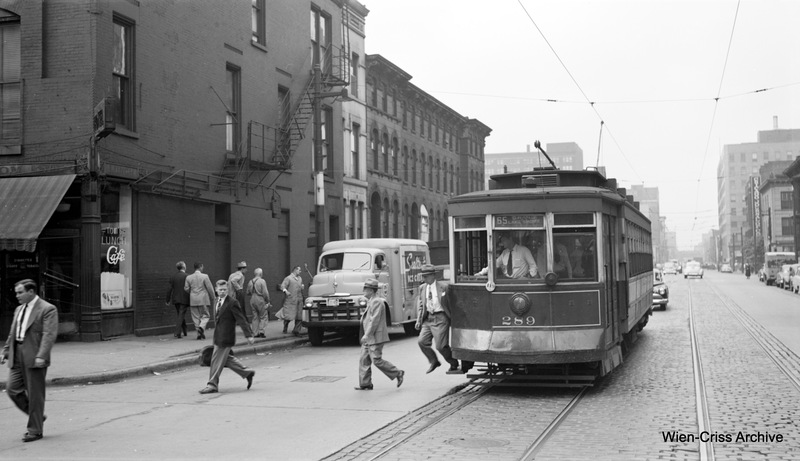 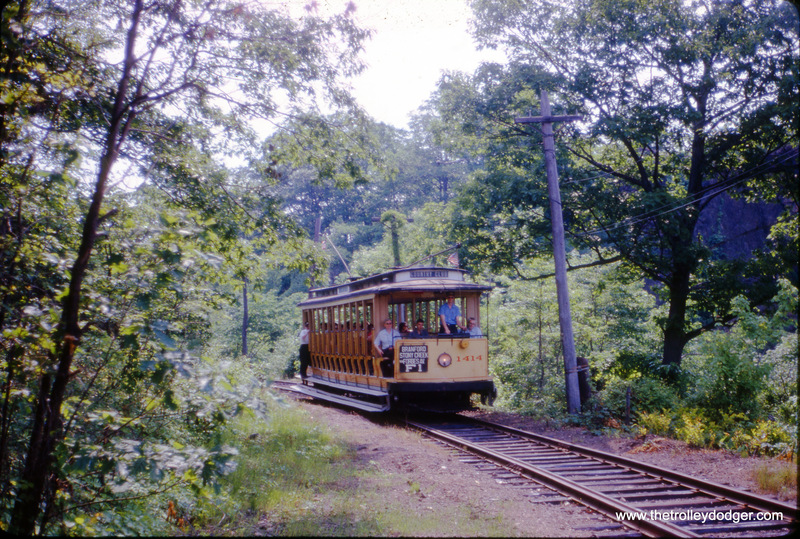 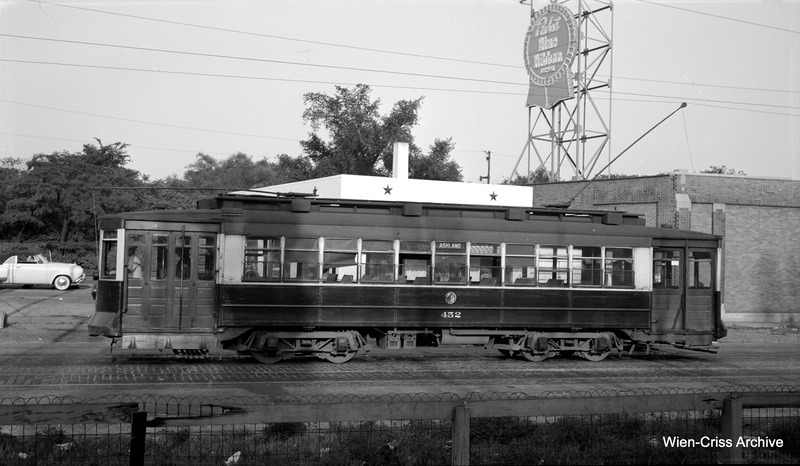 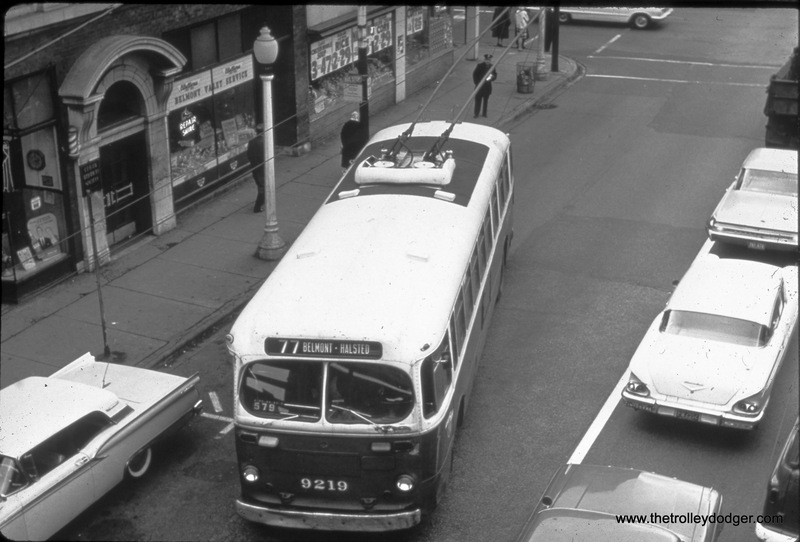 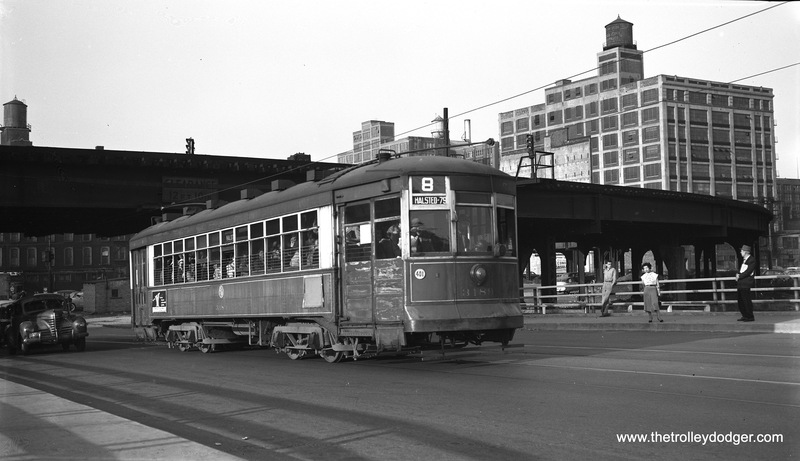 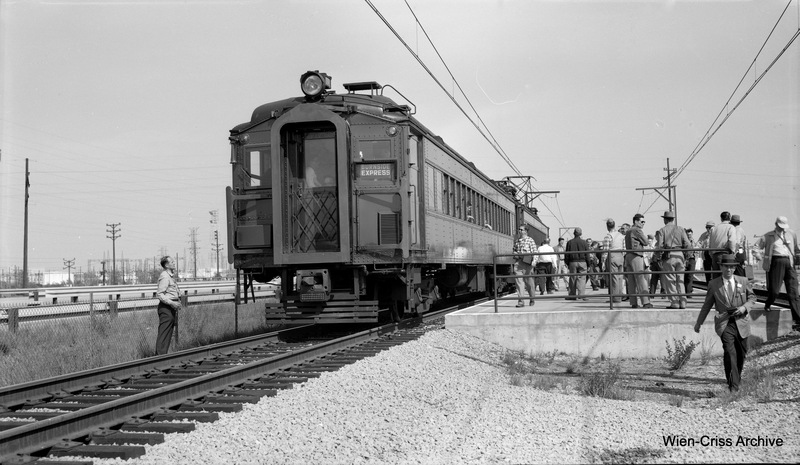 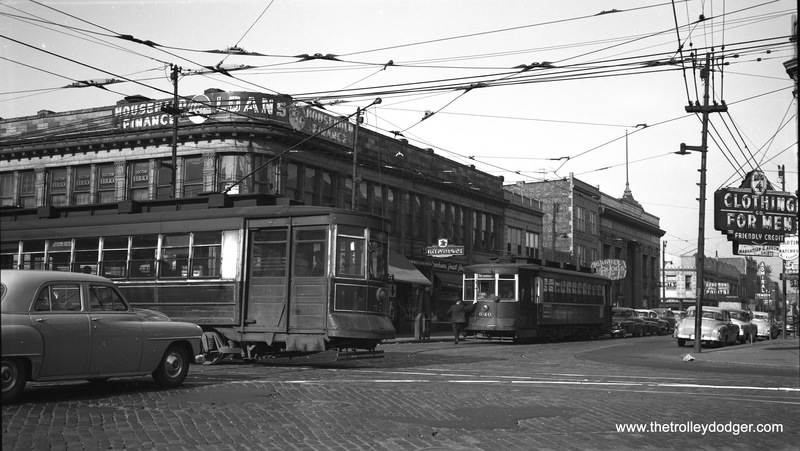 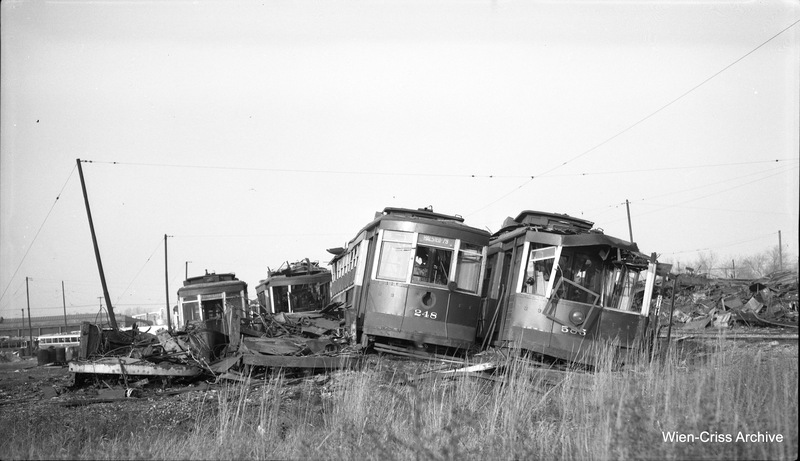 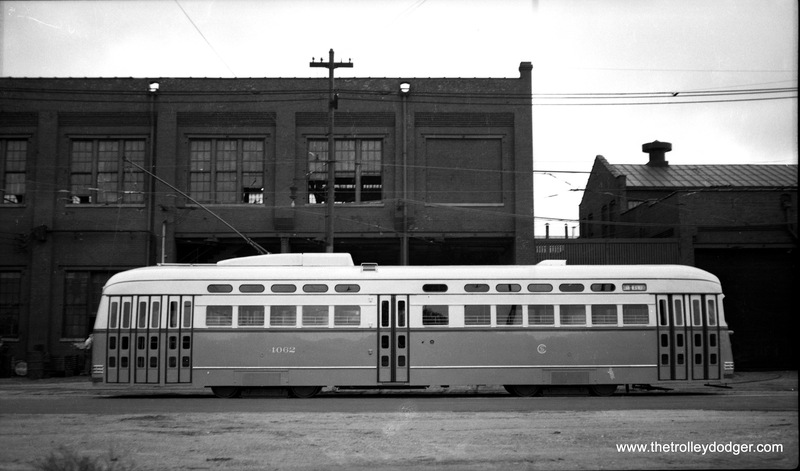 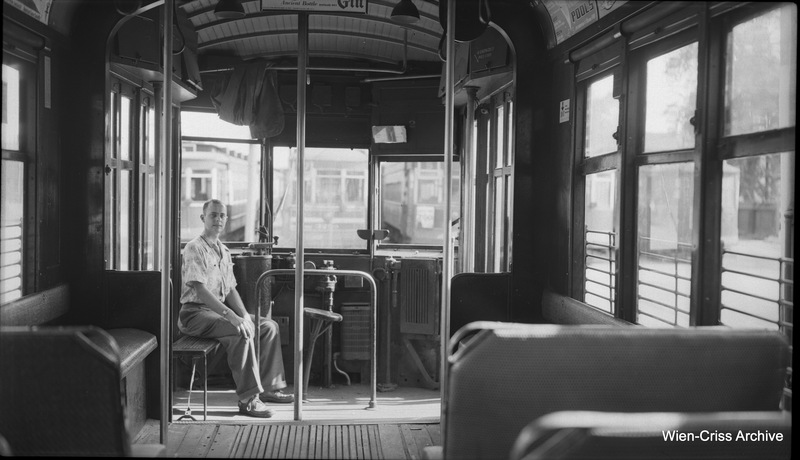 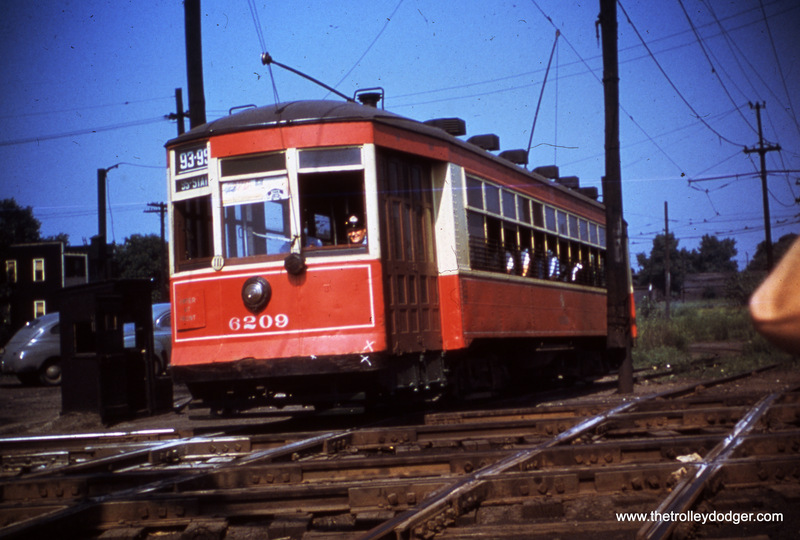 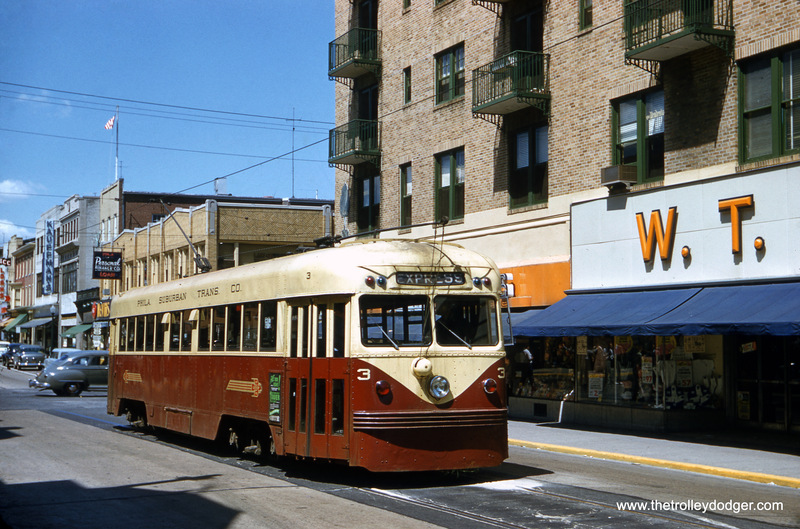 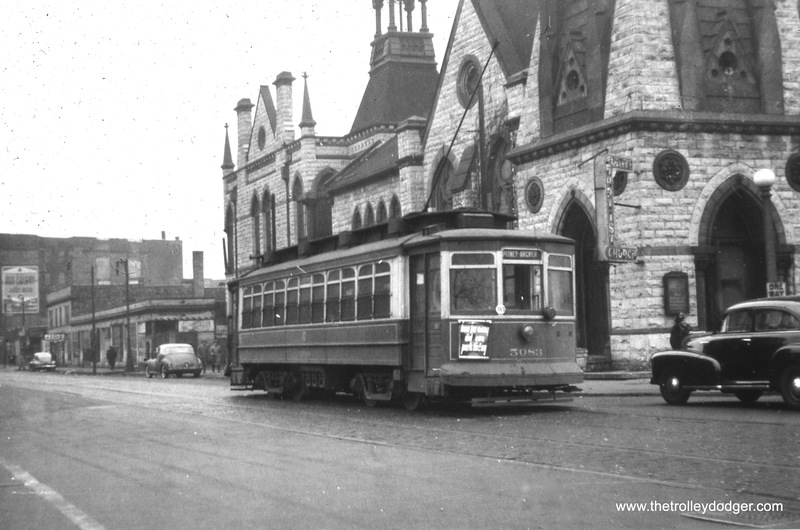 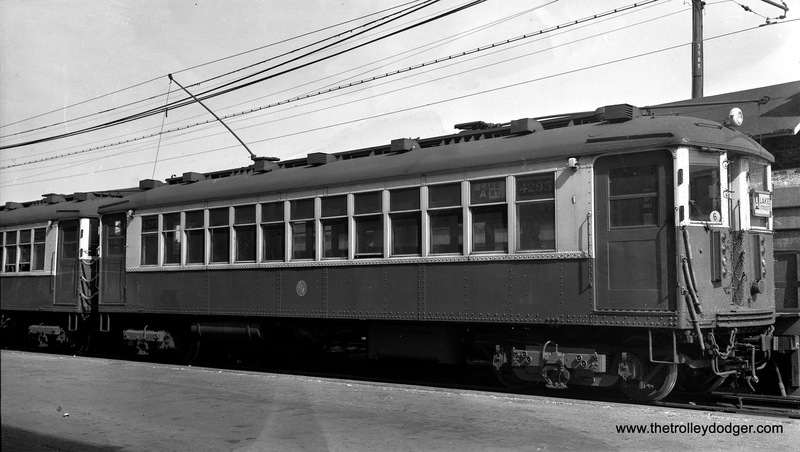 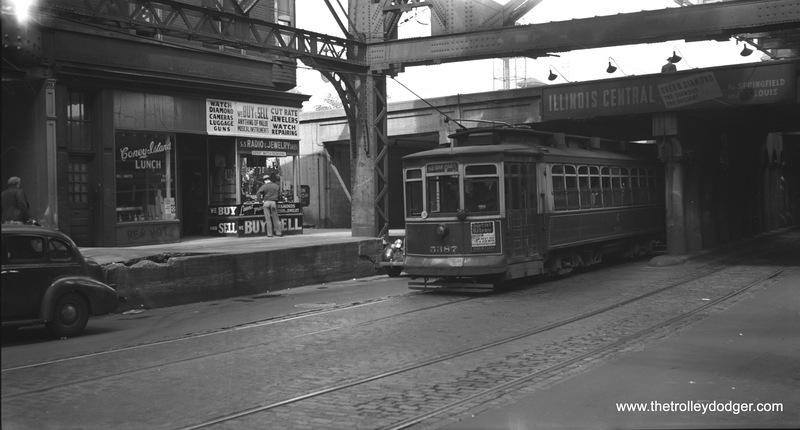 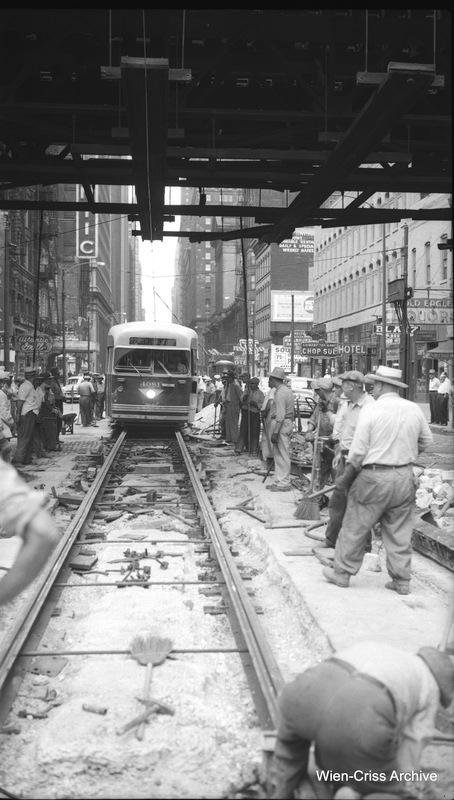 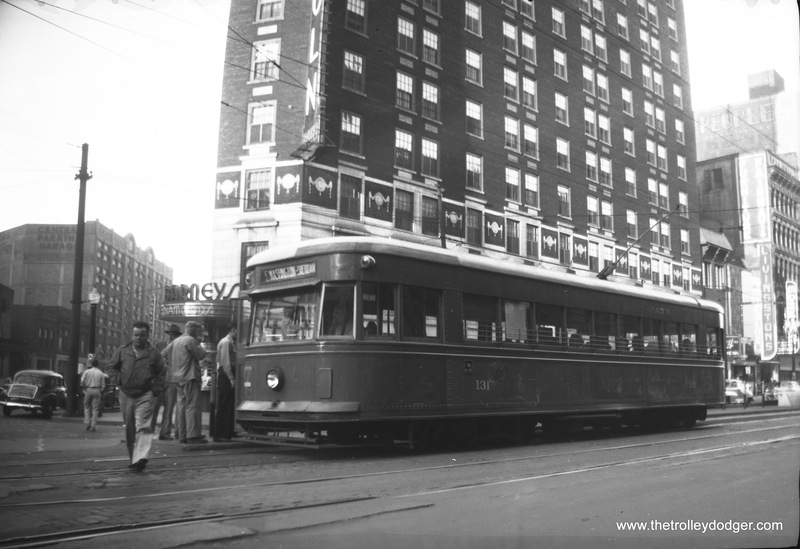 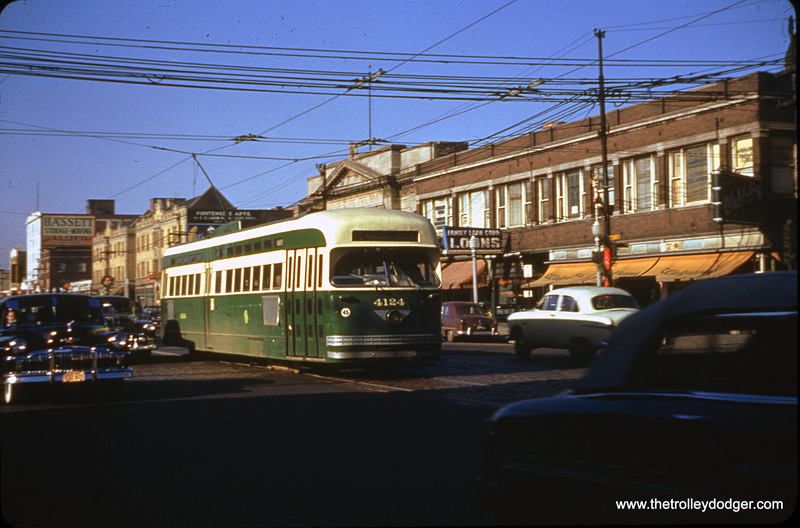 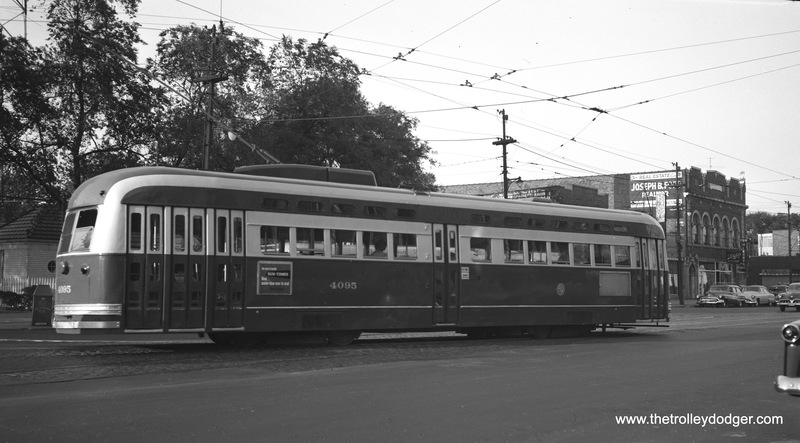 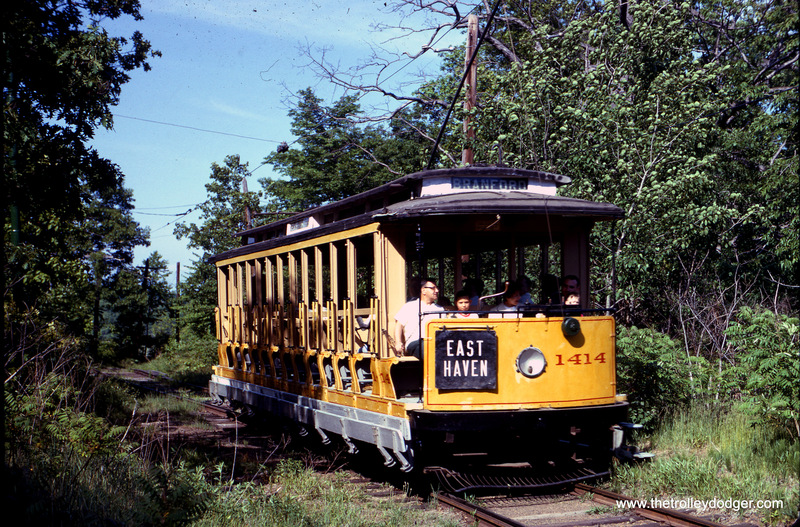 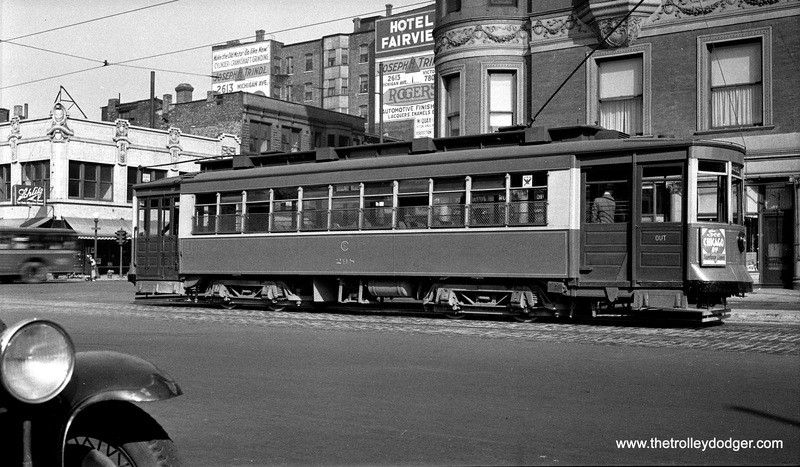 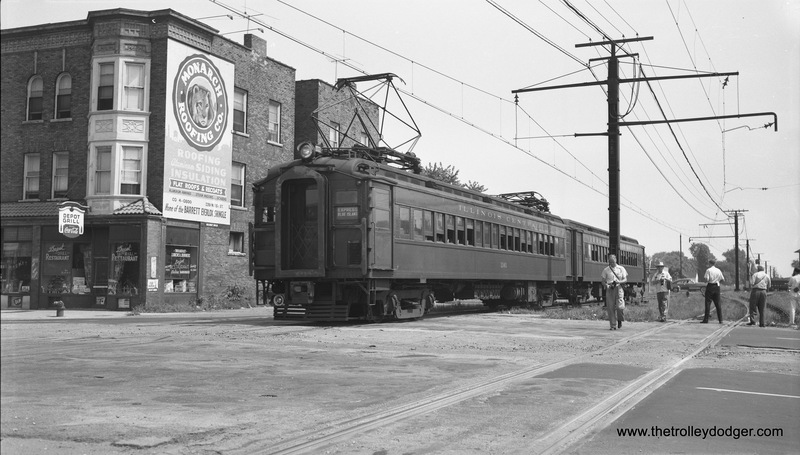 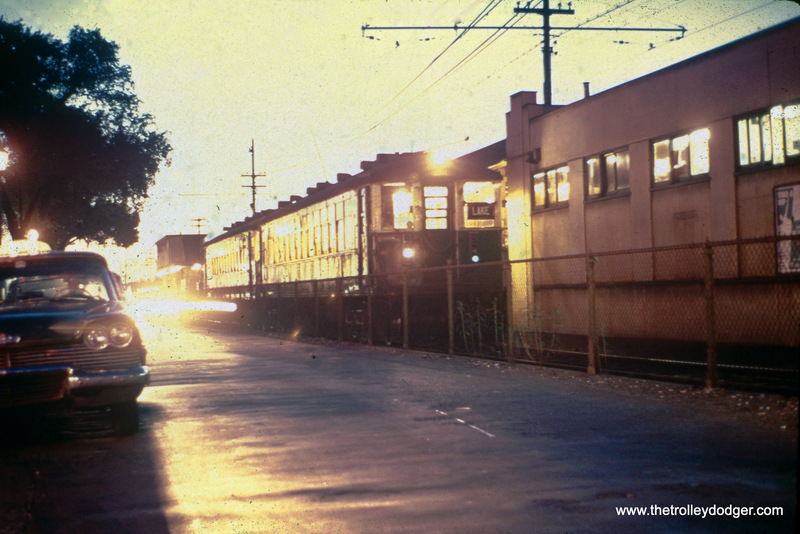 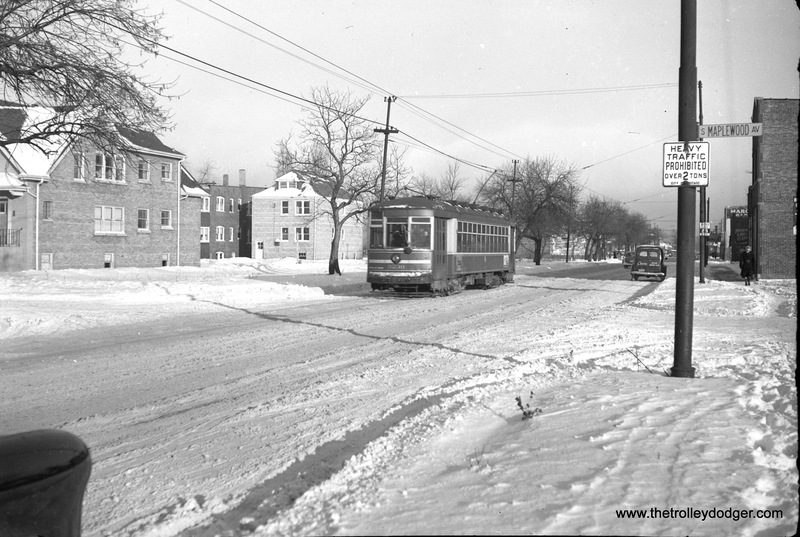 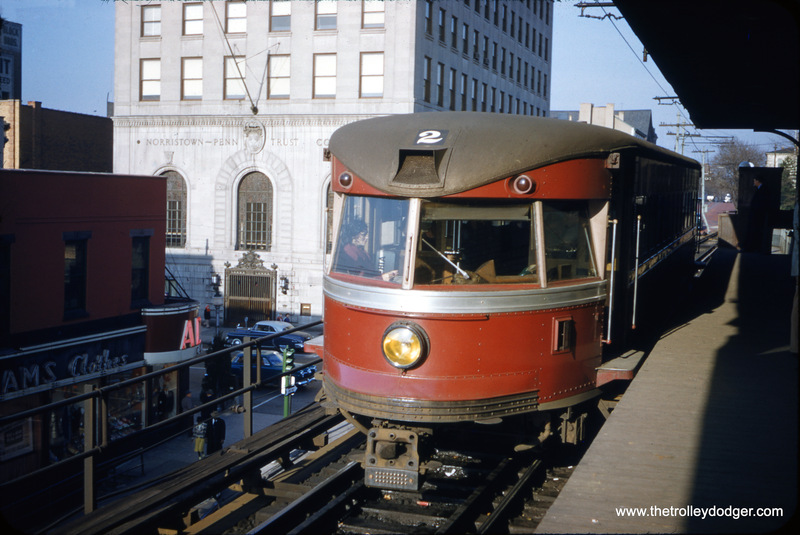 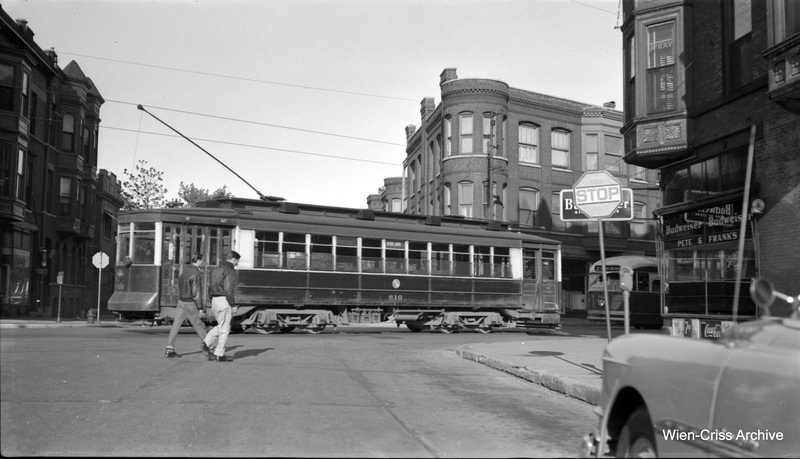 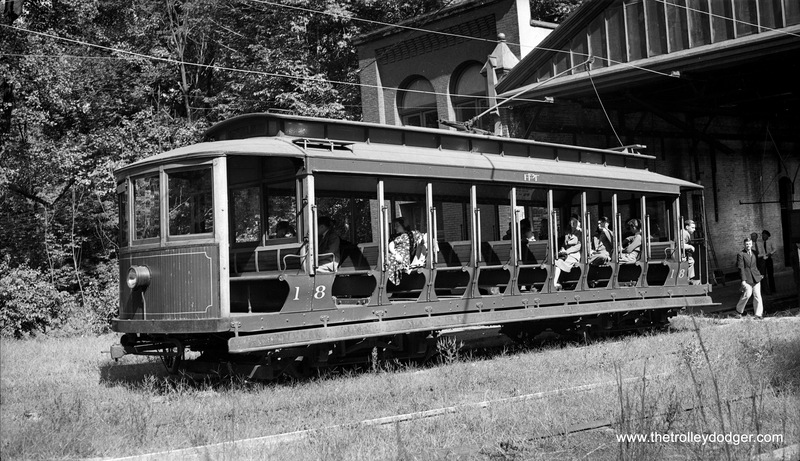 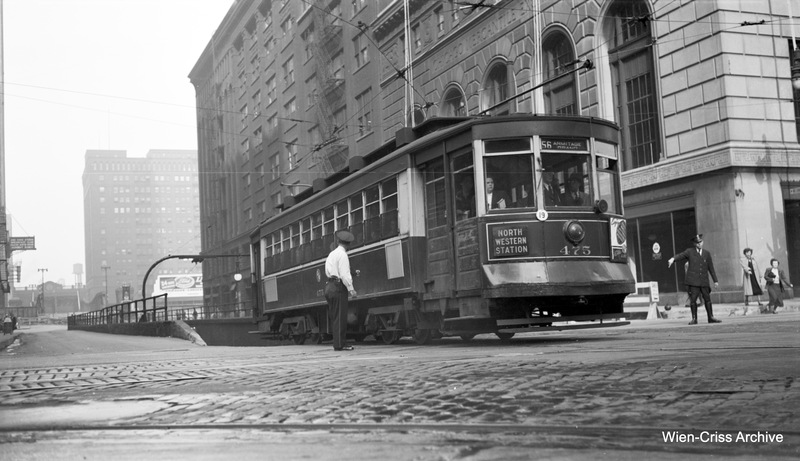 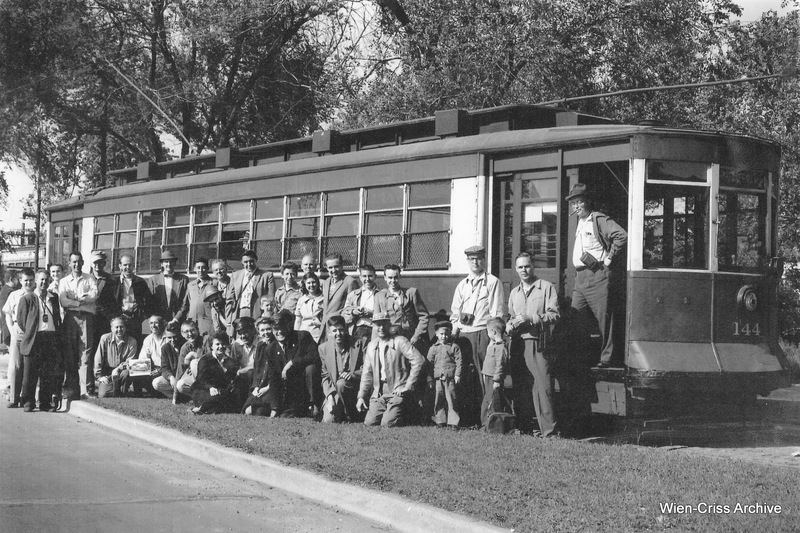 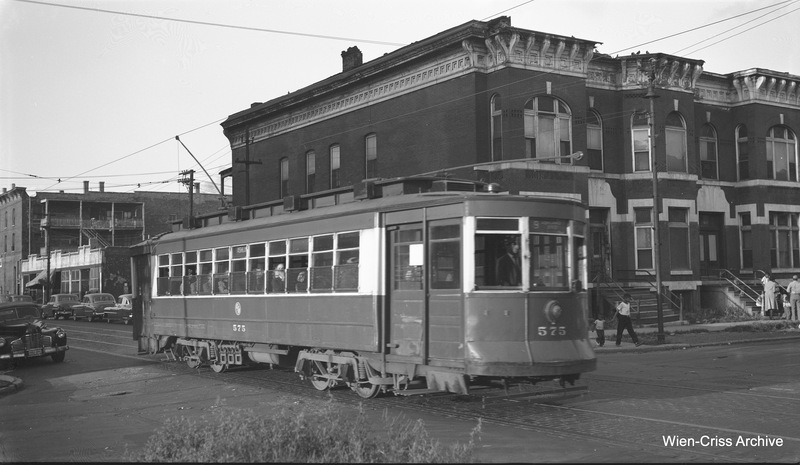 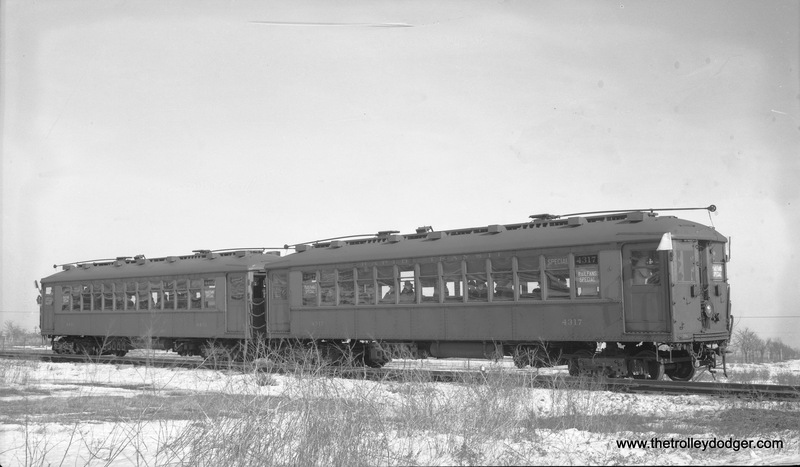 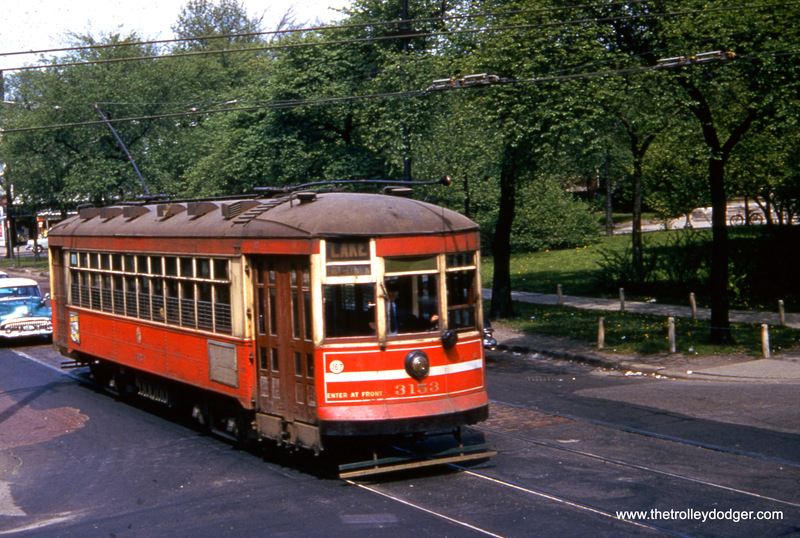 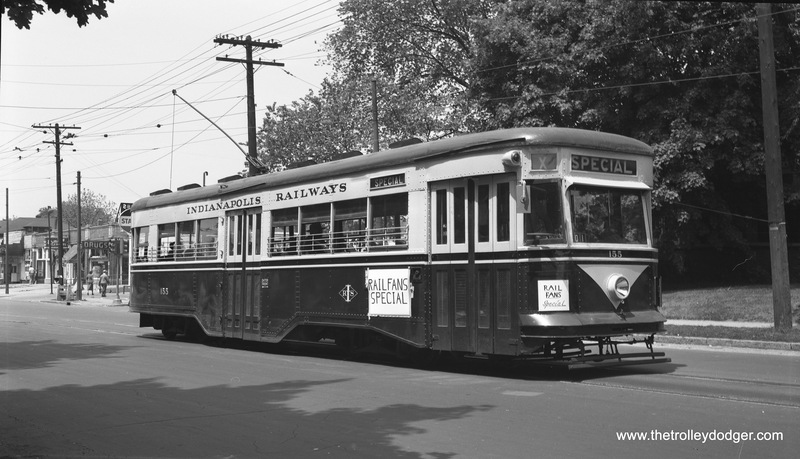 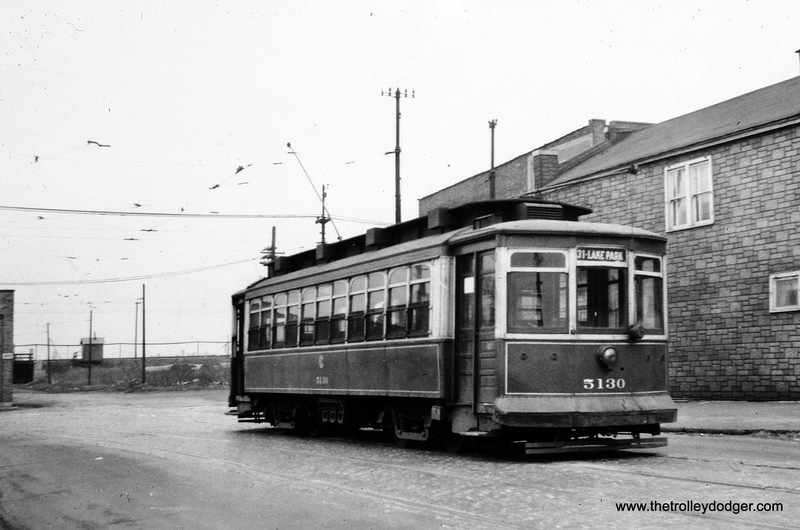 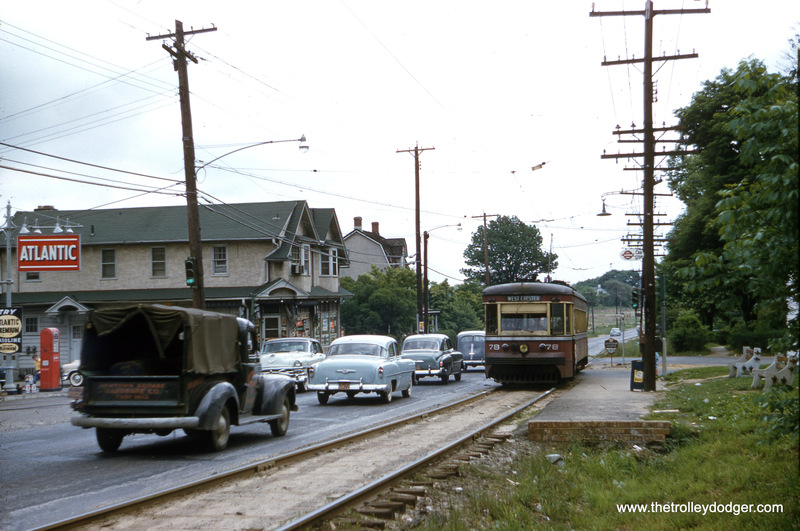 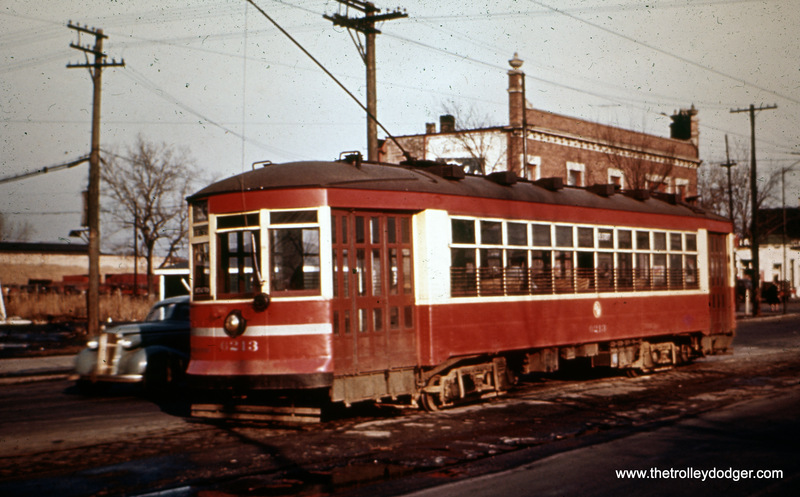 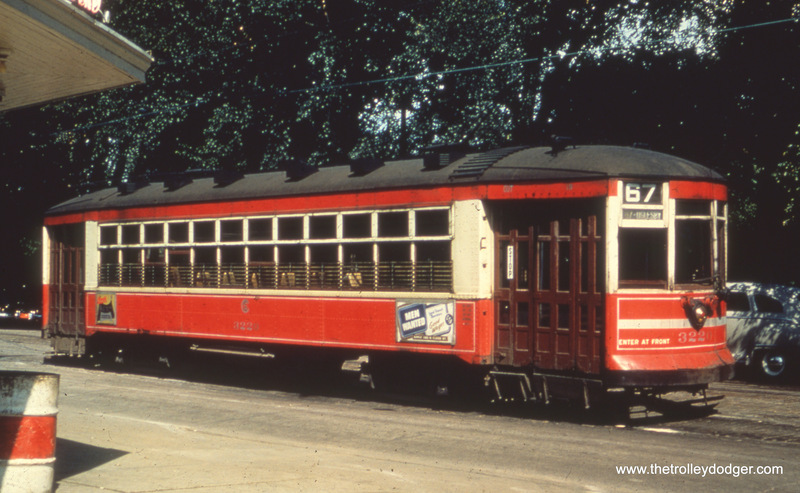 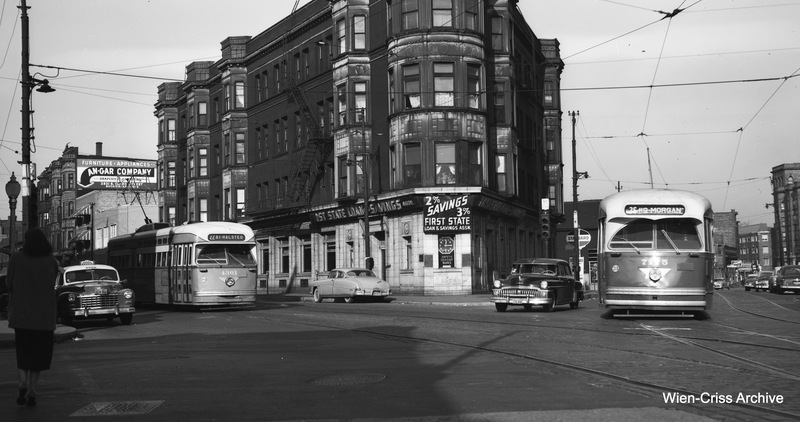 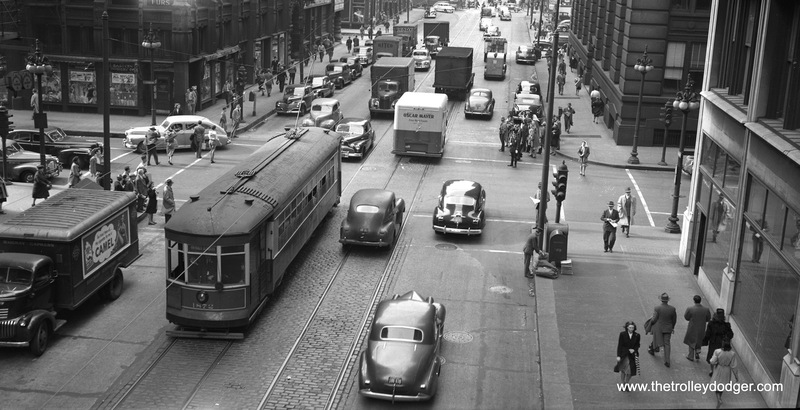 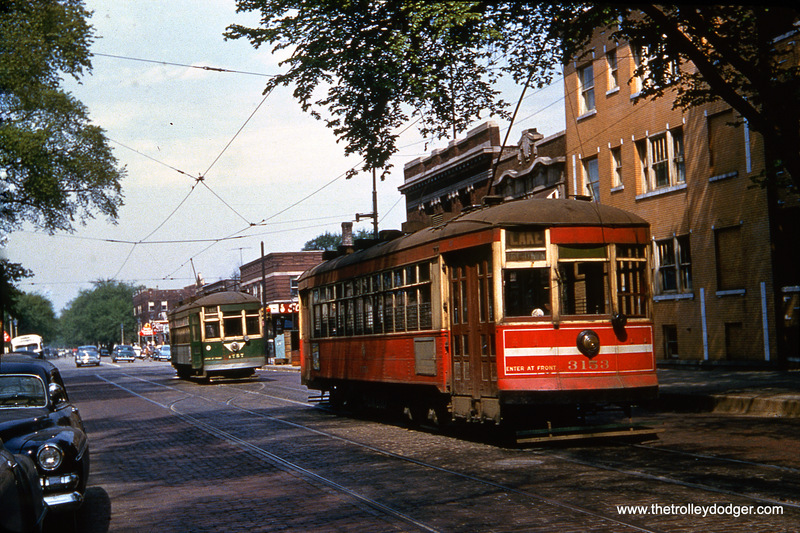 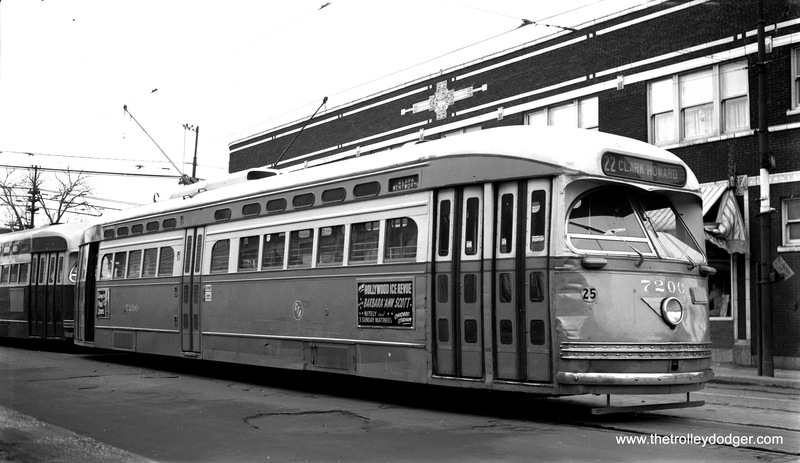 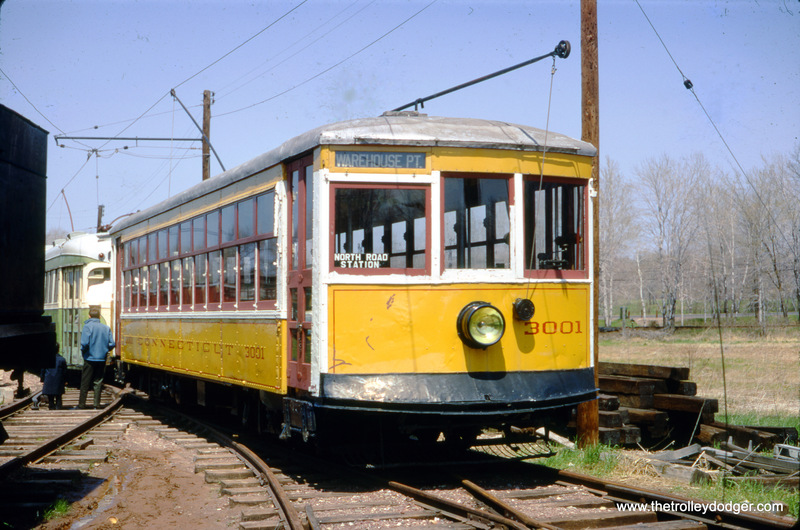 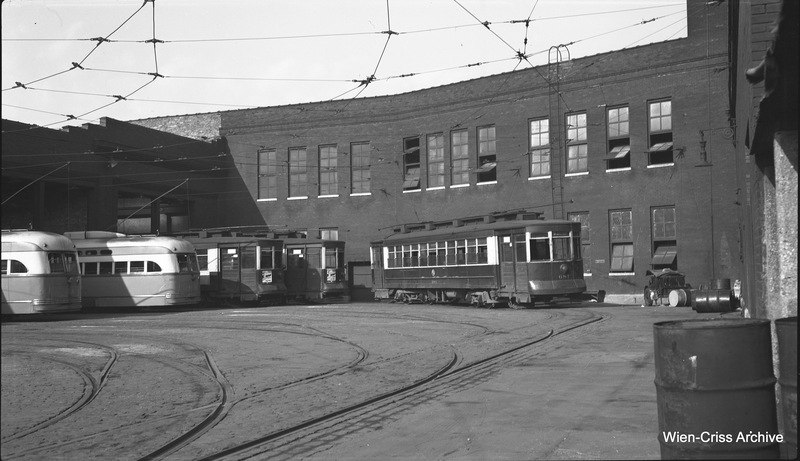 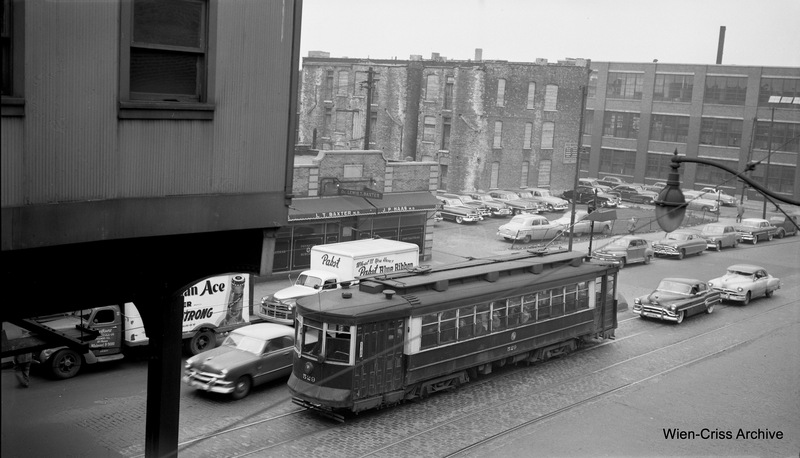 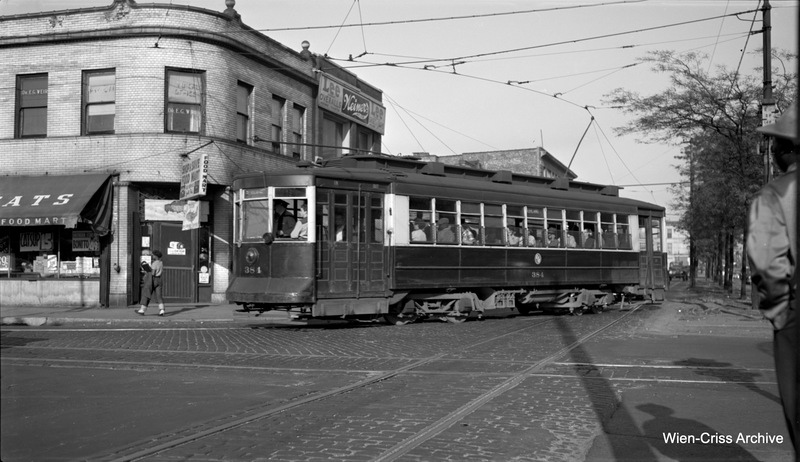 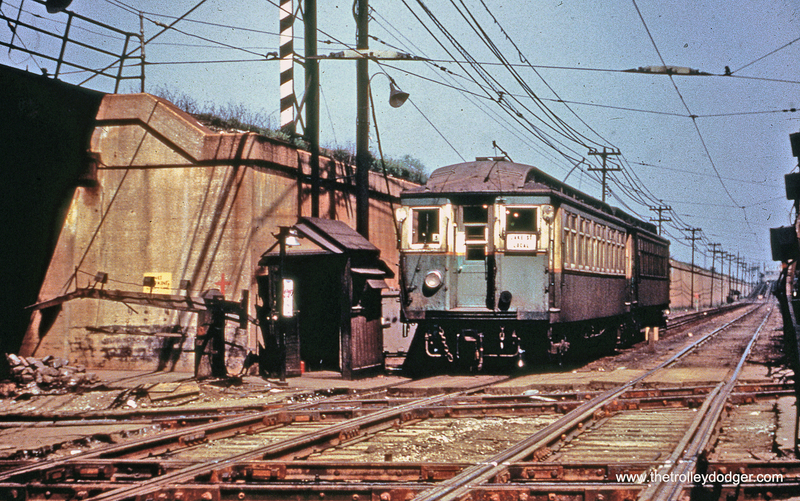 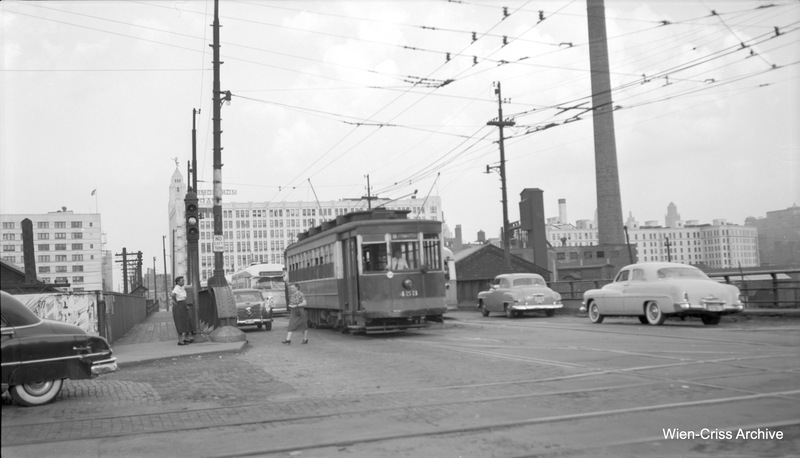 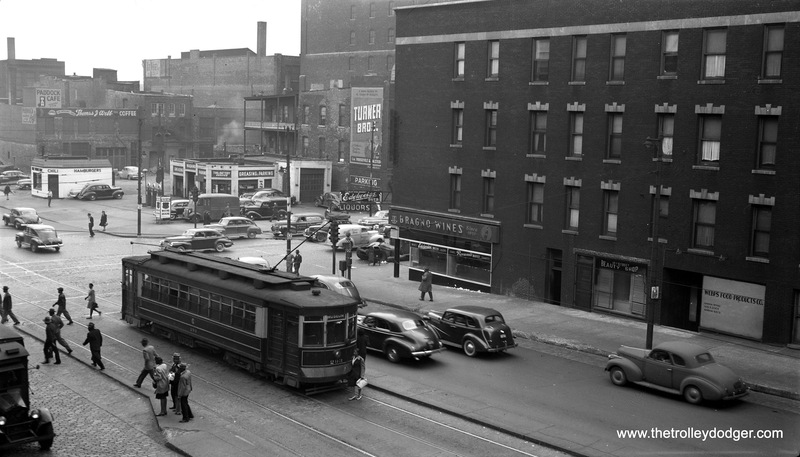 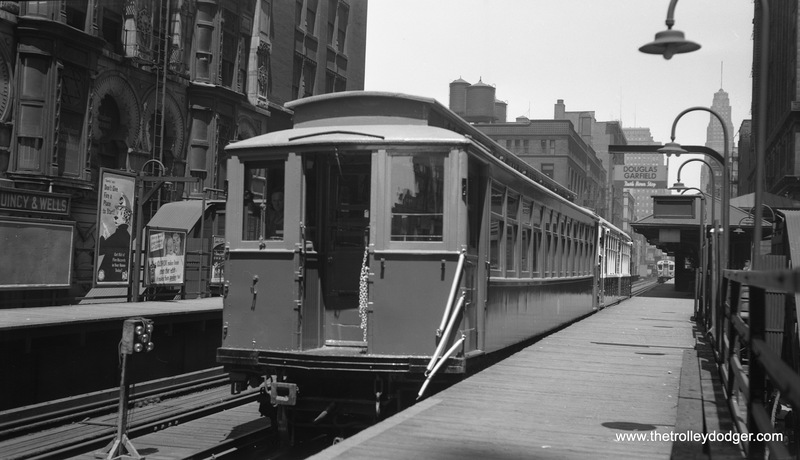 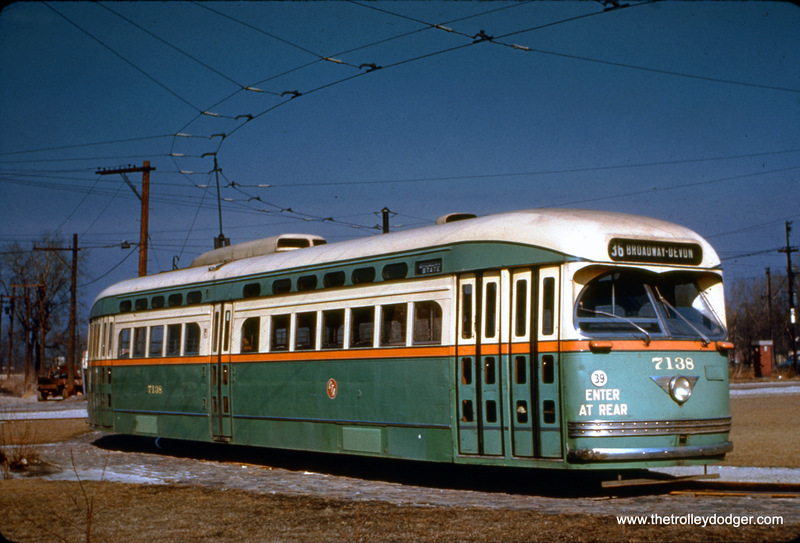 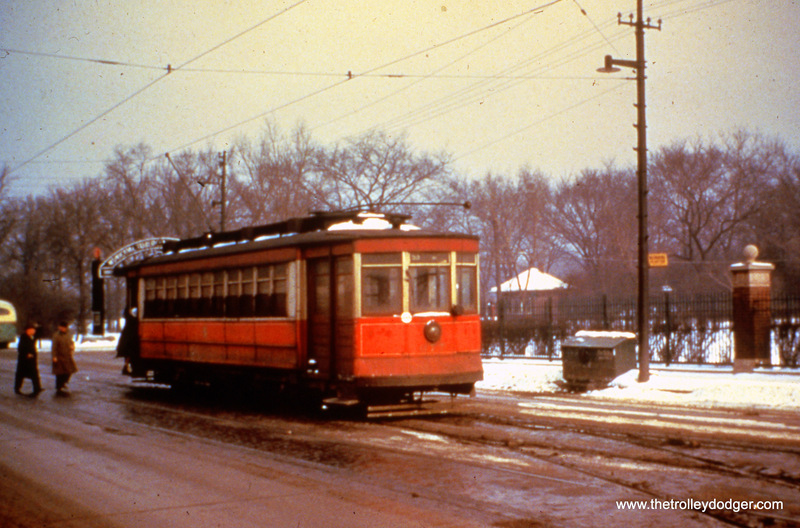 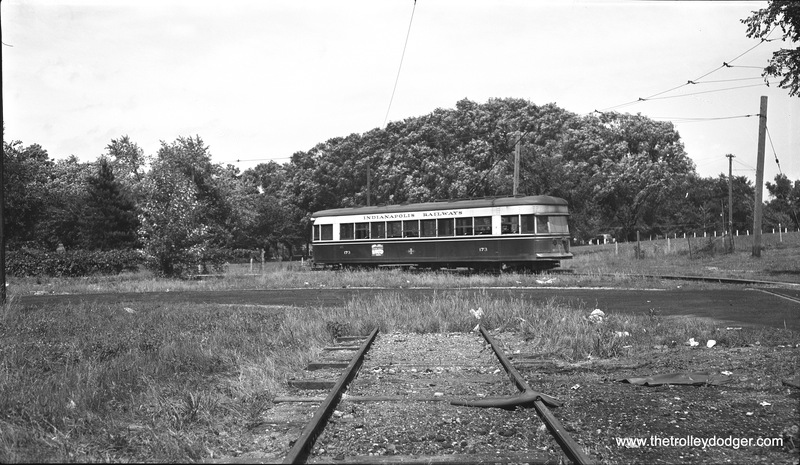 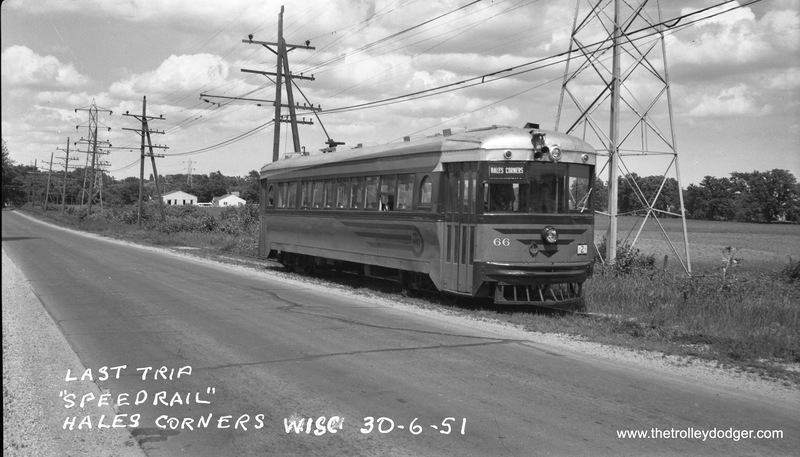 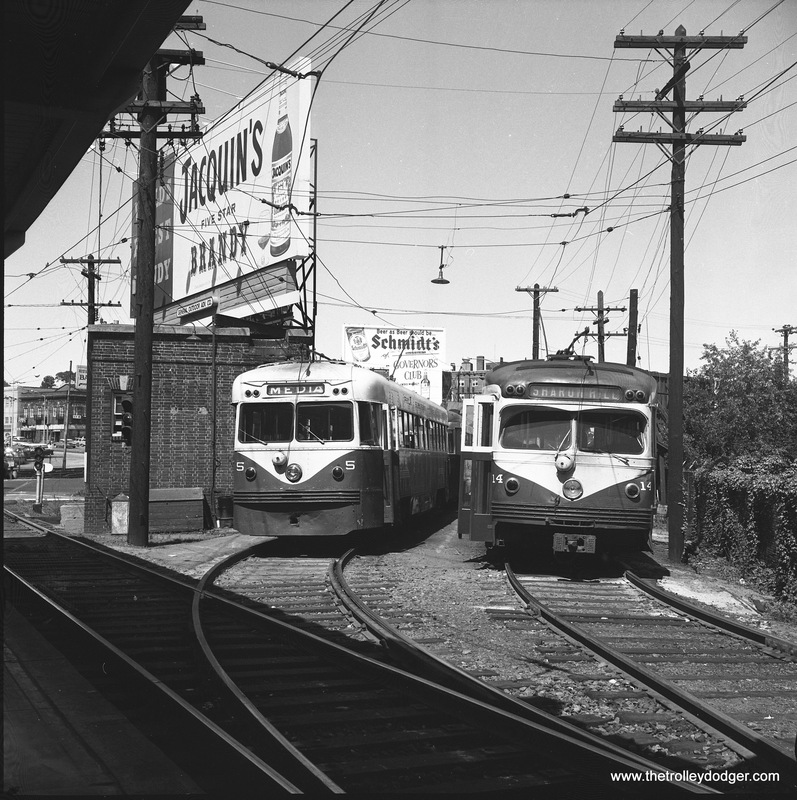 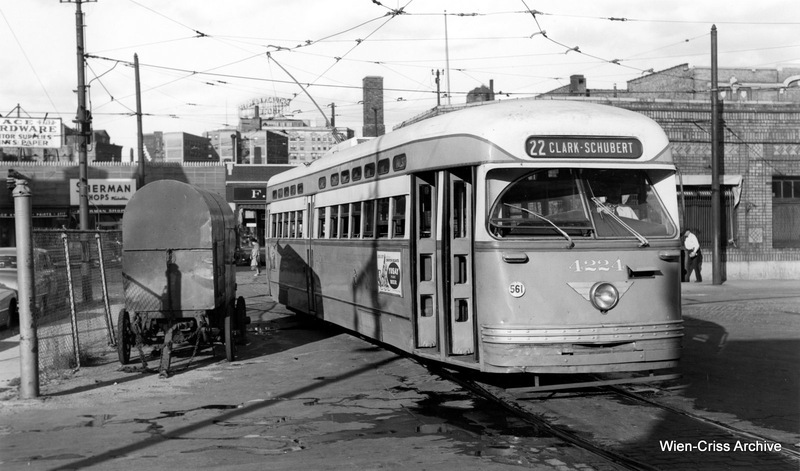 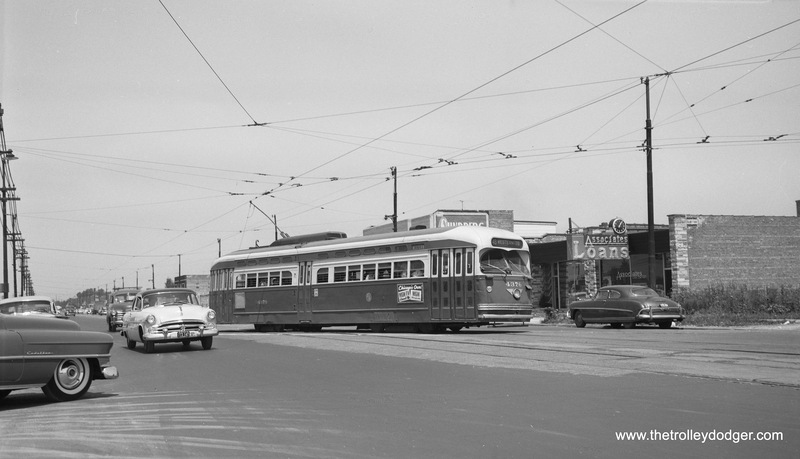 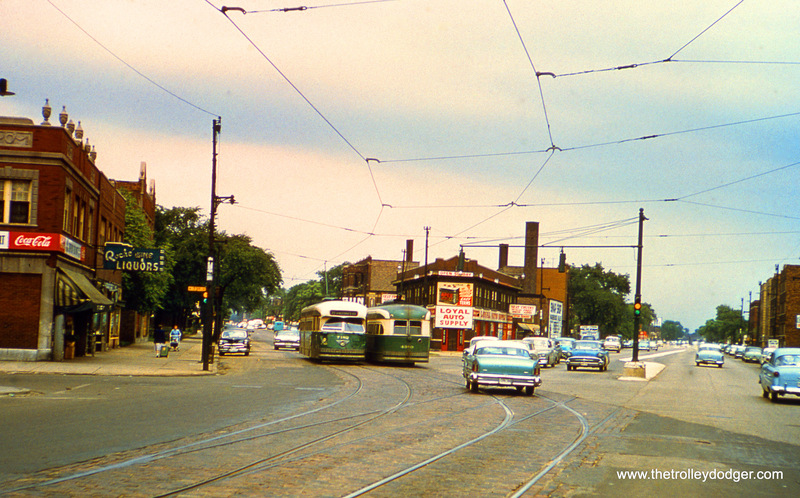 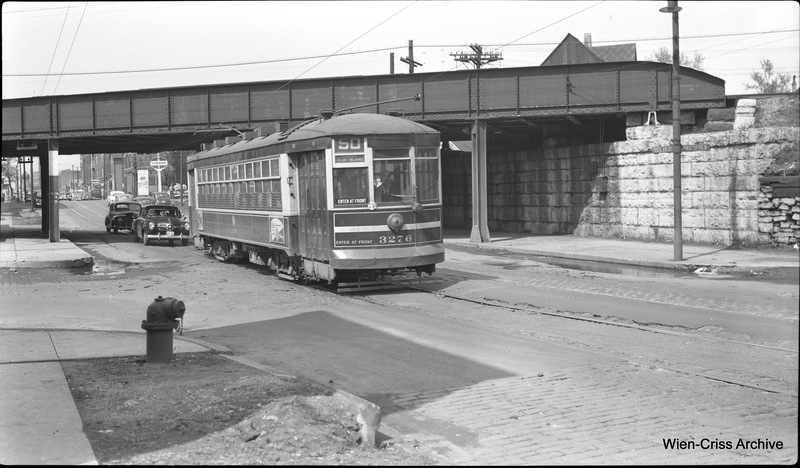 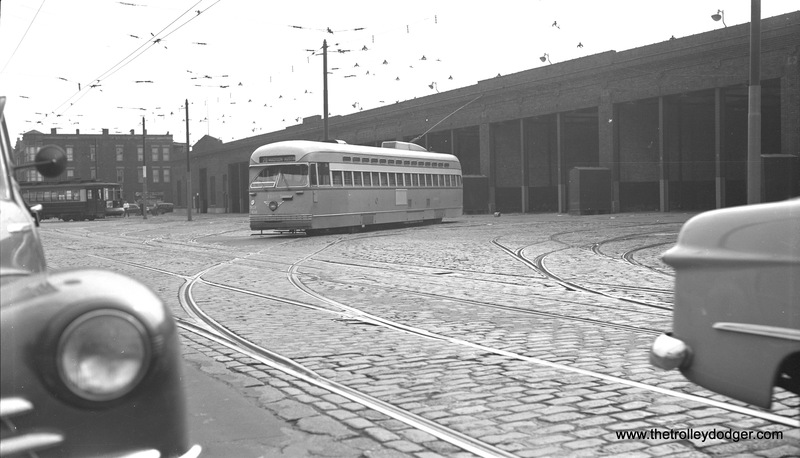 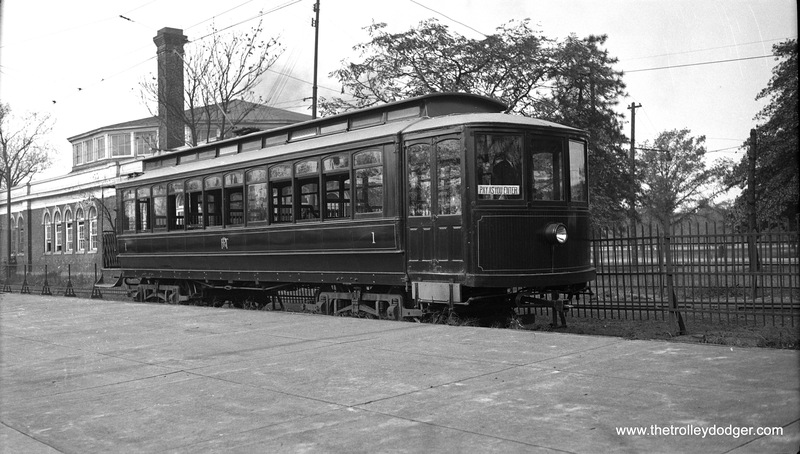 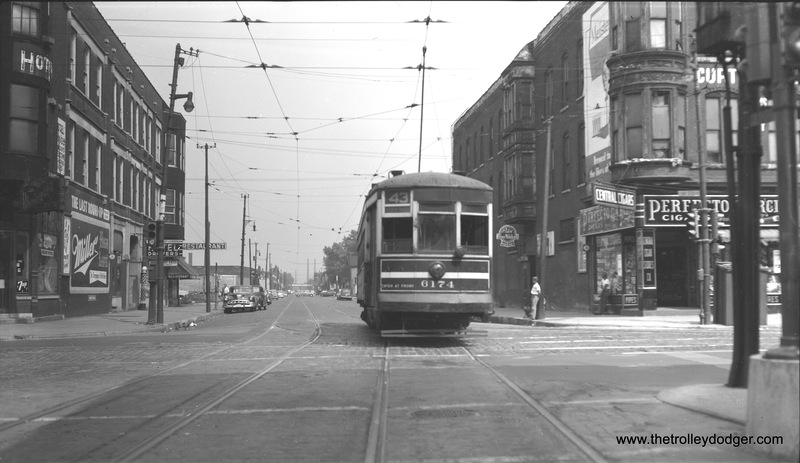 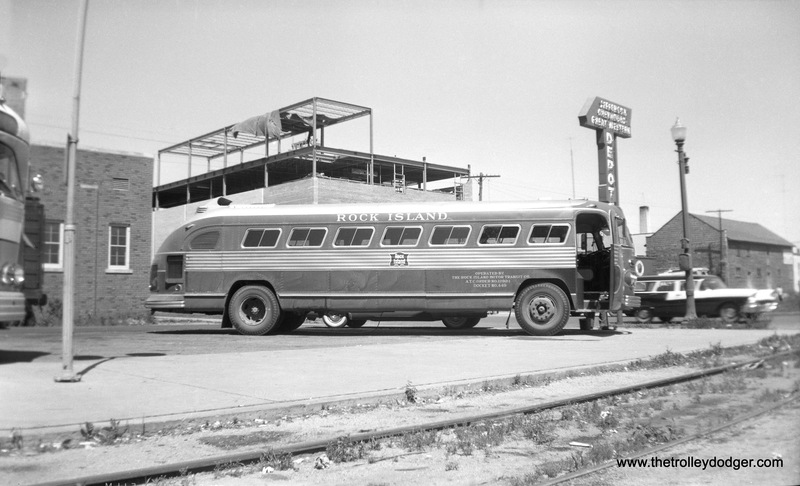 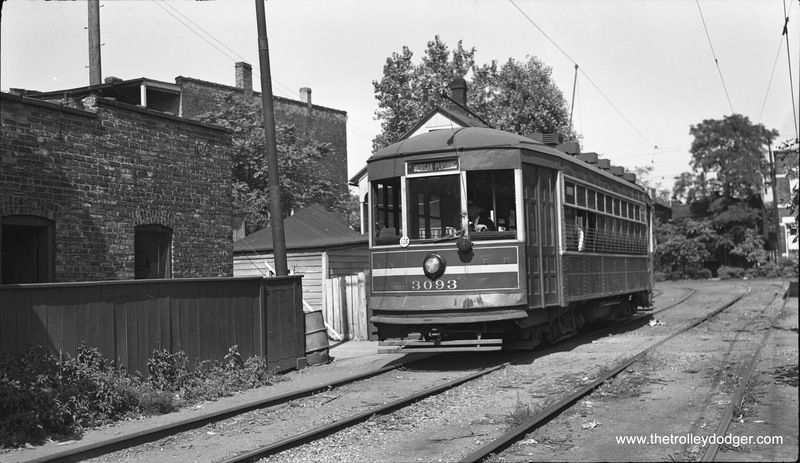 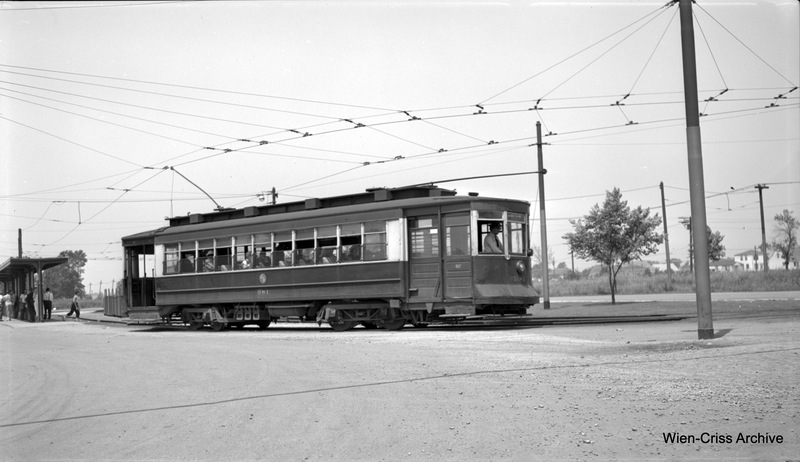 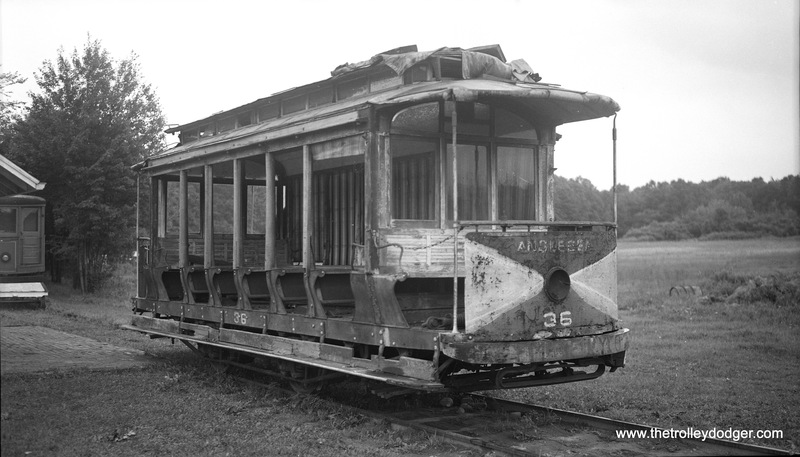 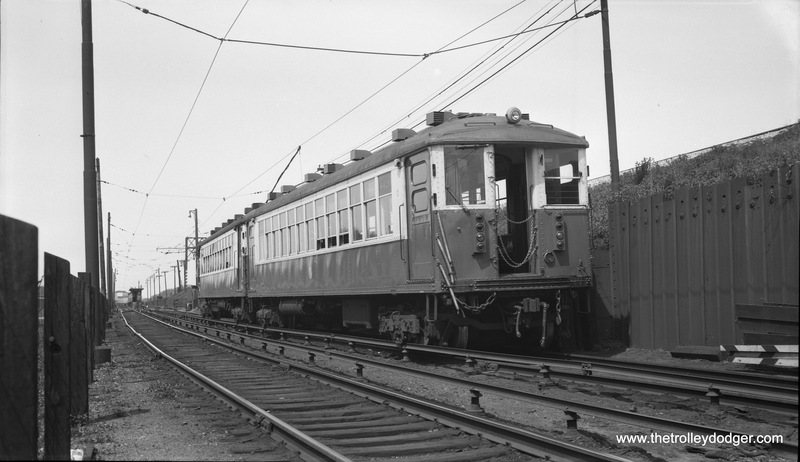 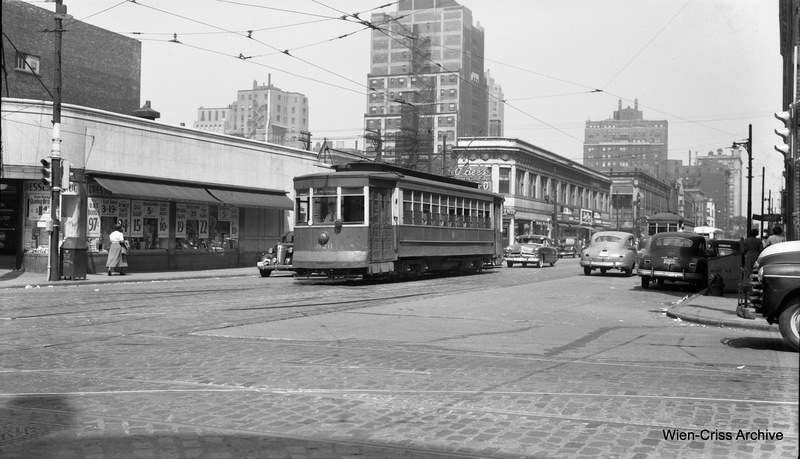 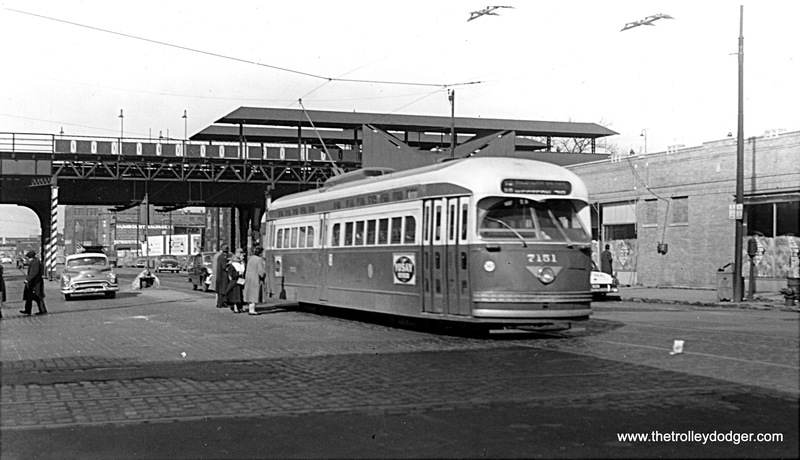 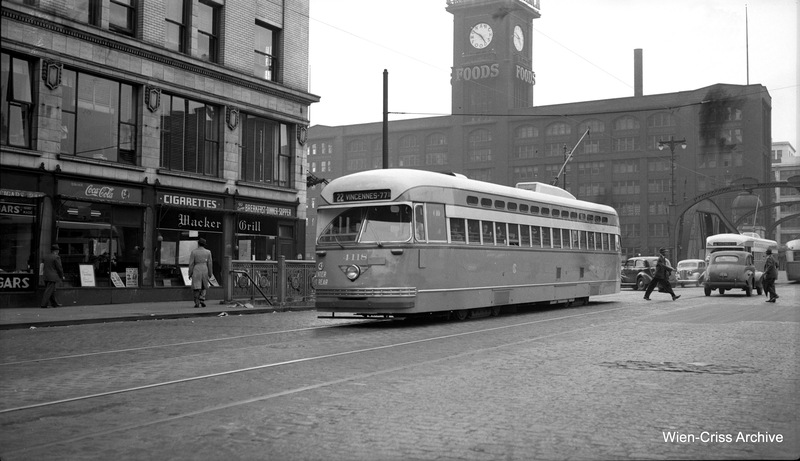 May 15, 1954.” (About two weeks before the end of streetcar service on Route 16). 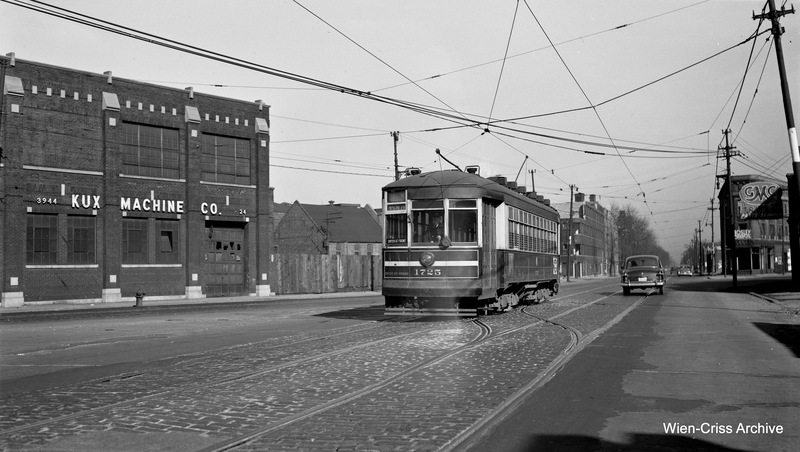 The same location today (Lake and Pine). 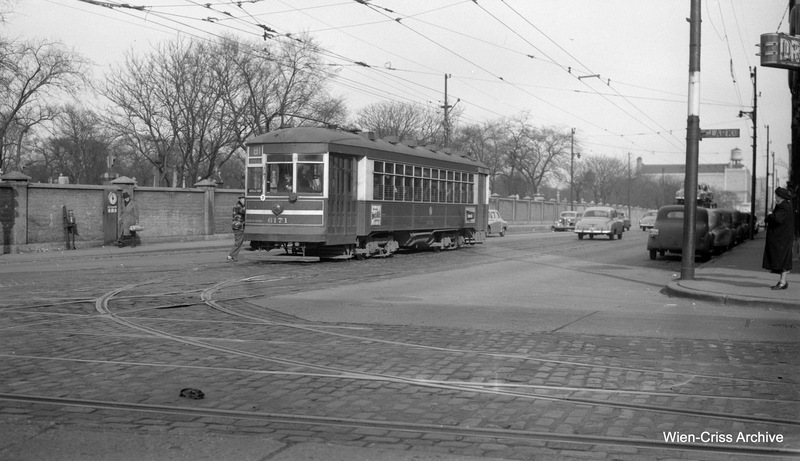 This is where Lake Street takes a jog to the north side of the former Chicago & North Western embankment, and the CSL/CTA Route 16 streetcar went along with it. 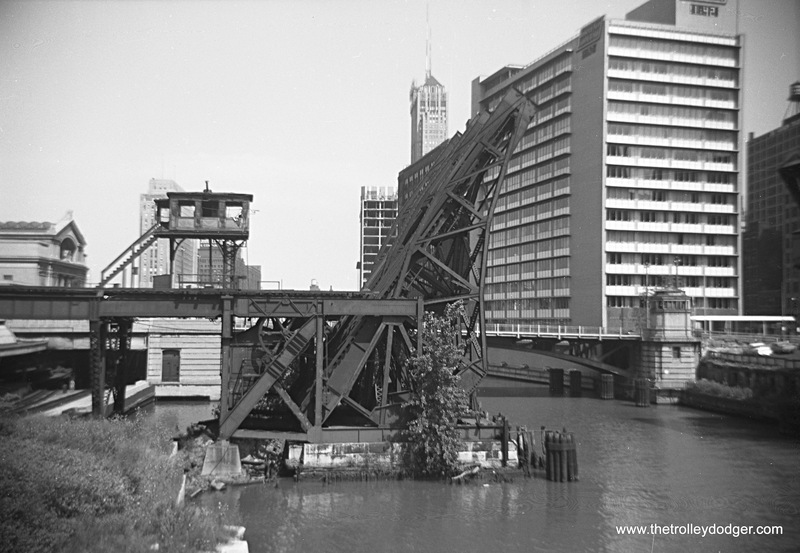 Since Lake Street pretty much split in two at this point, the section west of here (behind the photographer) was referred to as either North Lake or South Lake, depending on which side of the embankment you were on. 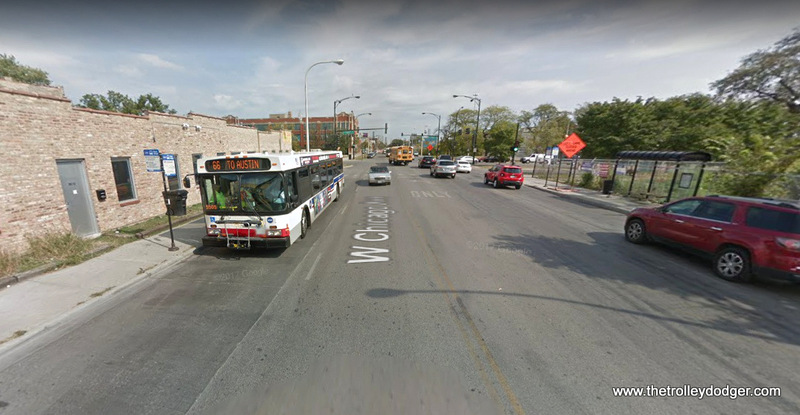 This was a reasonable system, since there were no duplicate street numbers. 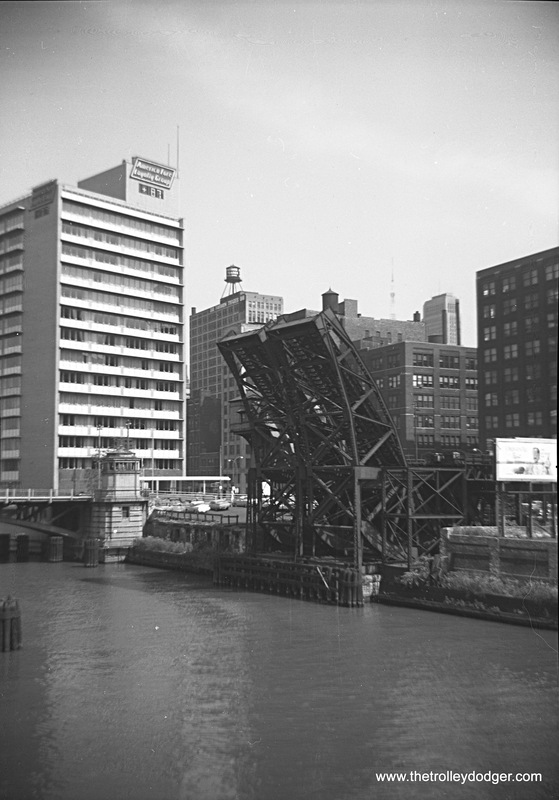 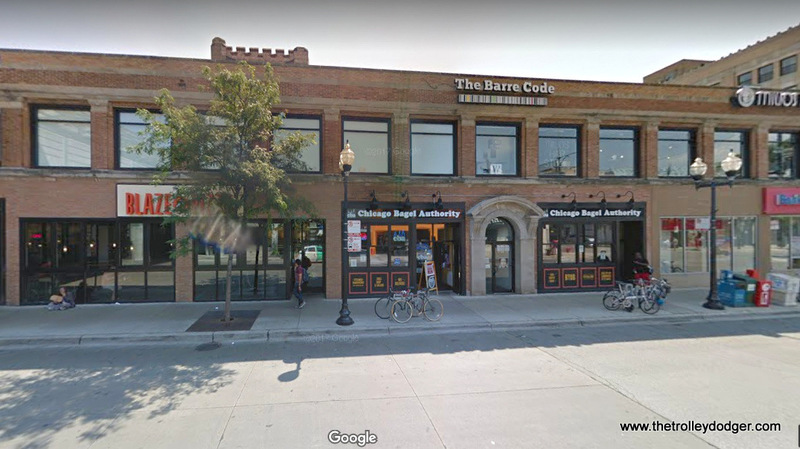 But in 1964, the south portion between Pine and Austin (a distance of just over half a mile) was renamed Corcoran Place, after the local alderman, an ally of then-Mayor Richard J. Daley’s, who died suddenly from a heart attack. 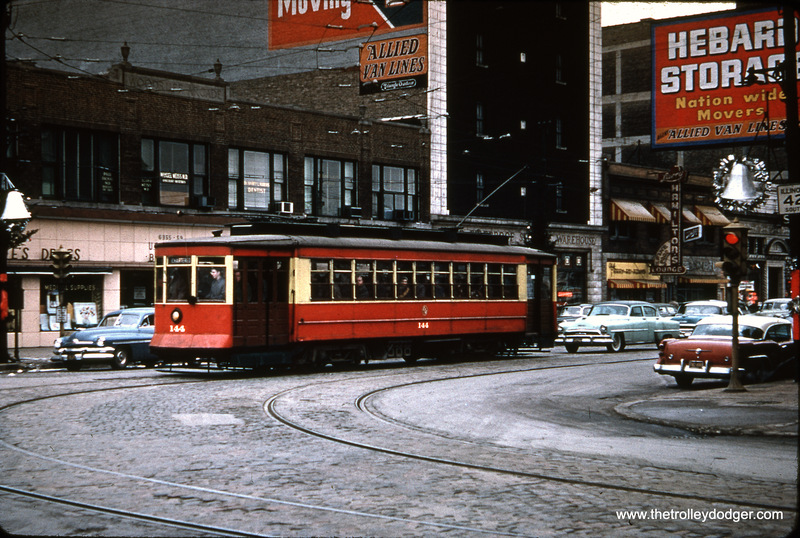 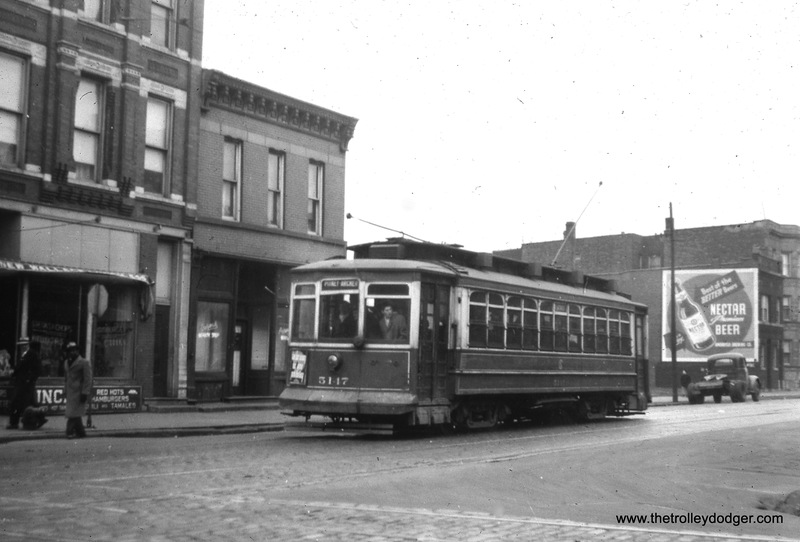 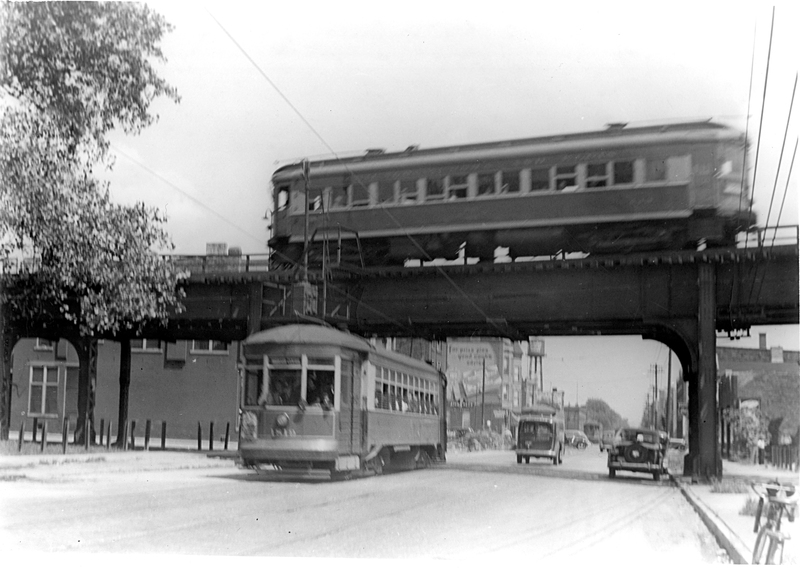 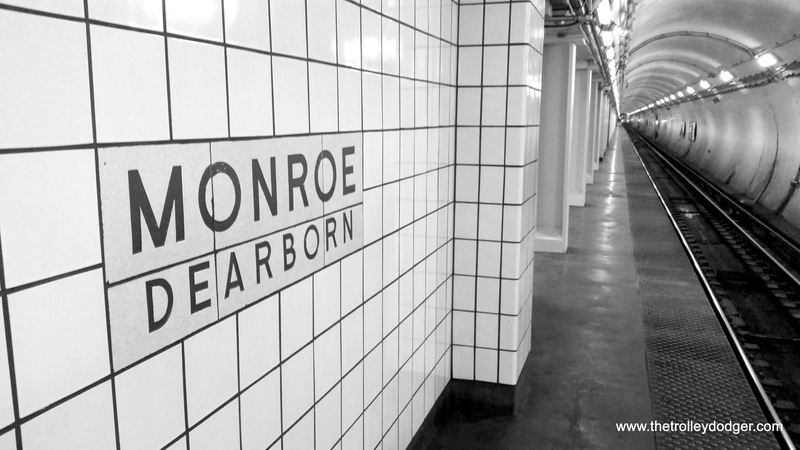 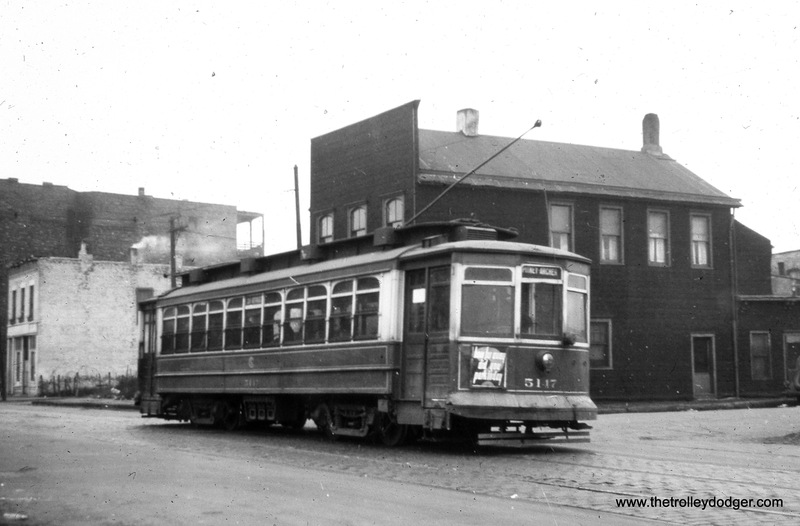 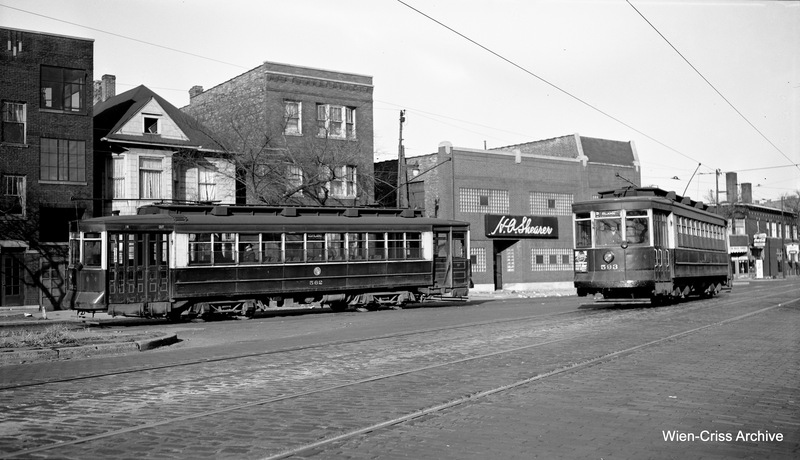 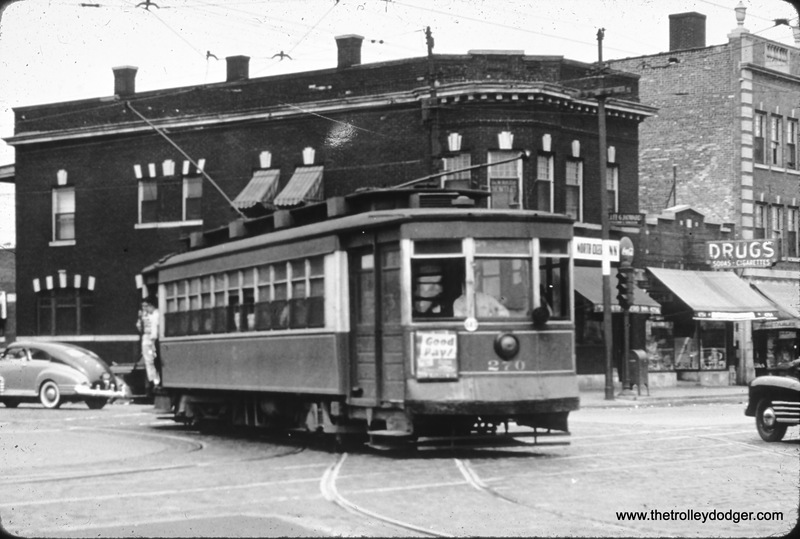 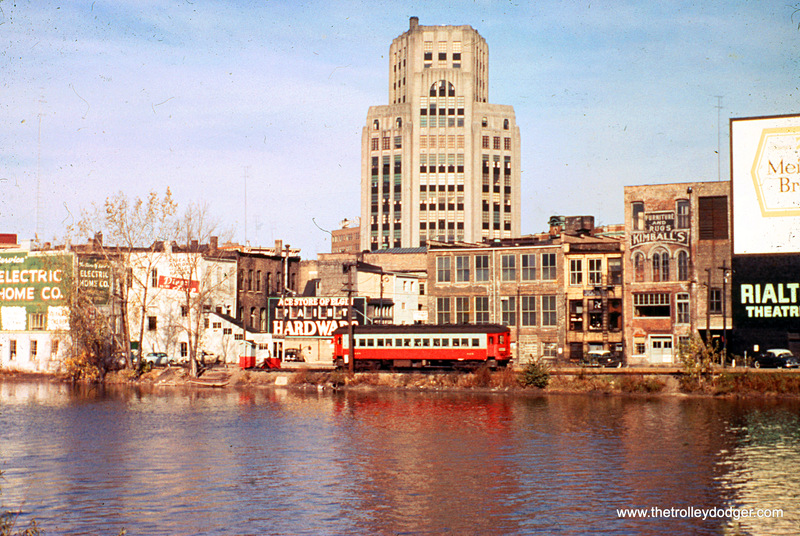 The “L” was relocated onto the embankment in 1962 and the street it was in (either Lake Street, South Lake Street aka Corcoan Place, or South Boulevard in Oak Park) made wider, or made into parking lots. 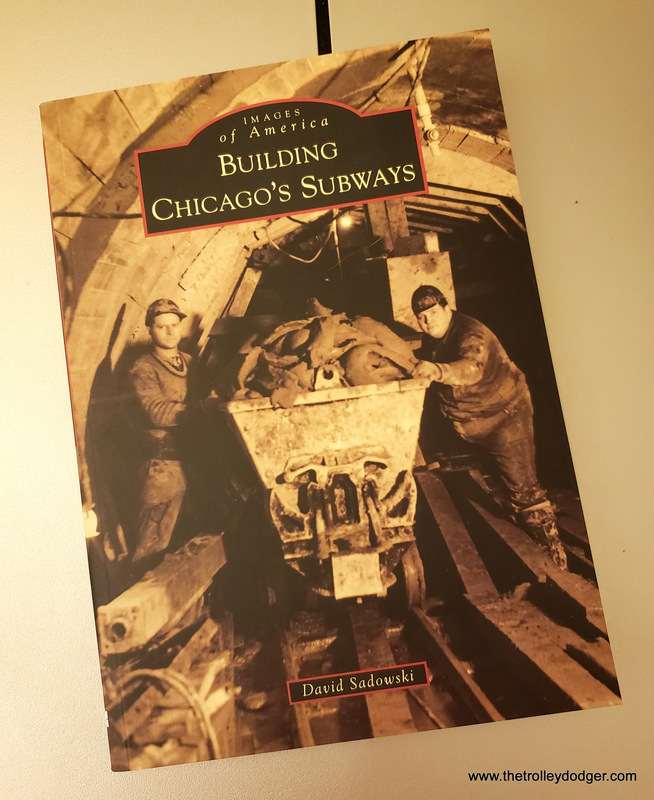 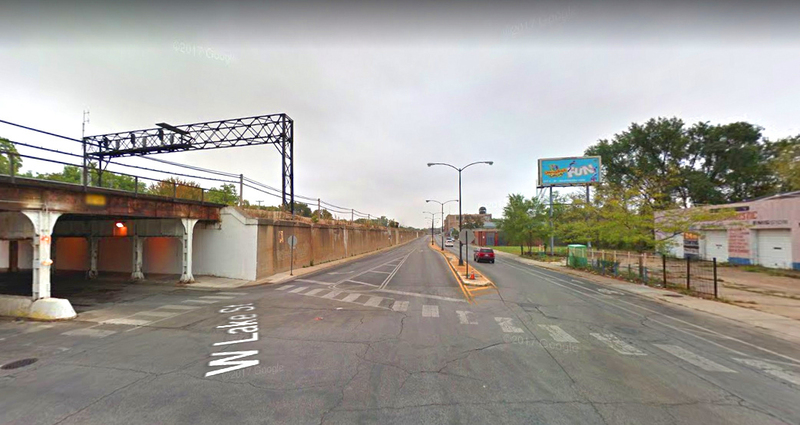 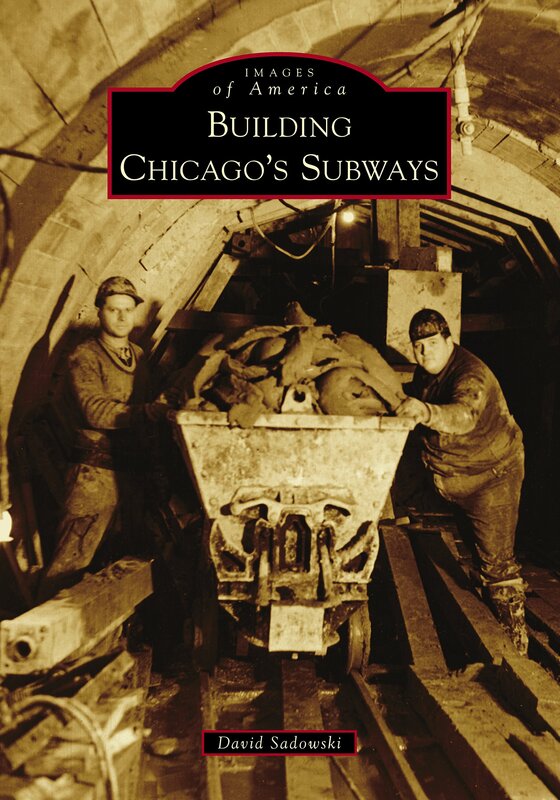 In the center, we see the portal at the north end of the State Street subway, just south of Armitage. 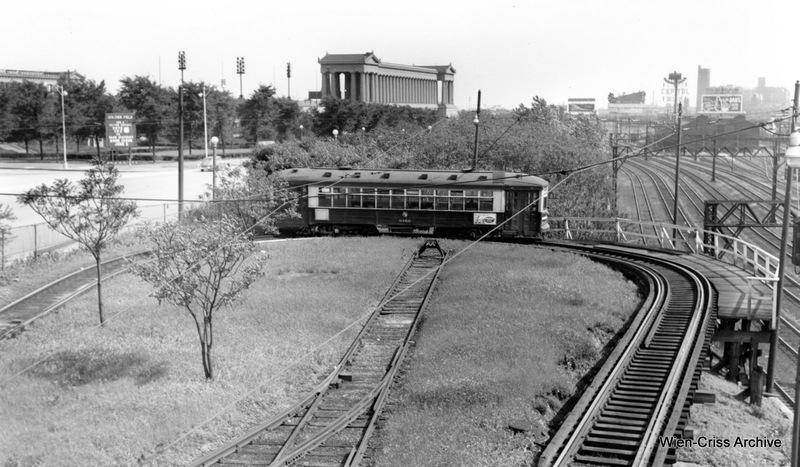 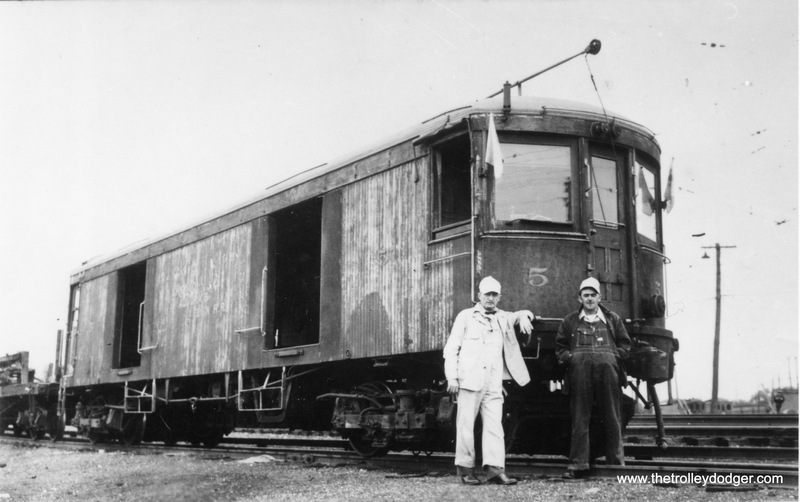 The two middle “L” tracks were moved to the outer edge of the structure when the subway was built. 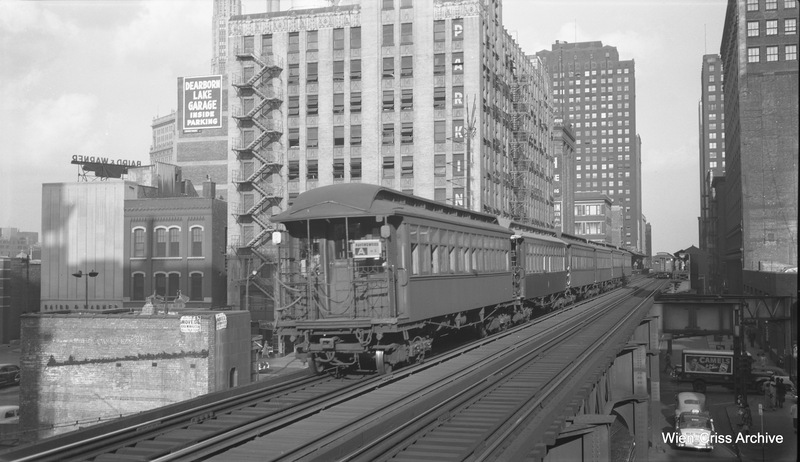 The “L” continued south from this point with four tracks to Chicago Avenue. 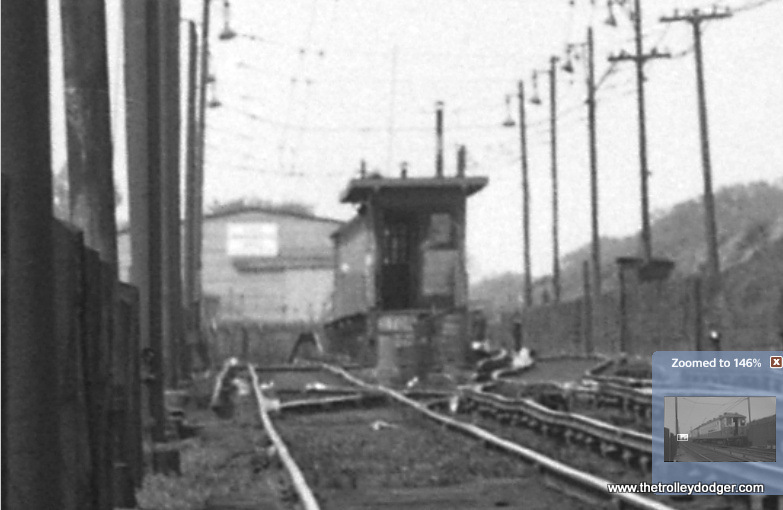 In recent years, the two outer tracks have been removed, and just a siding remains at this point. 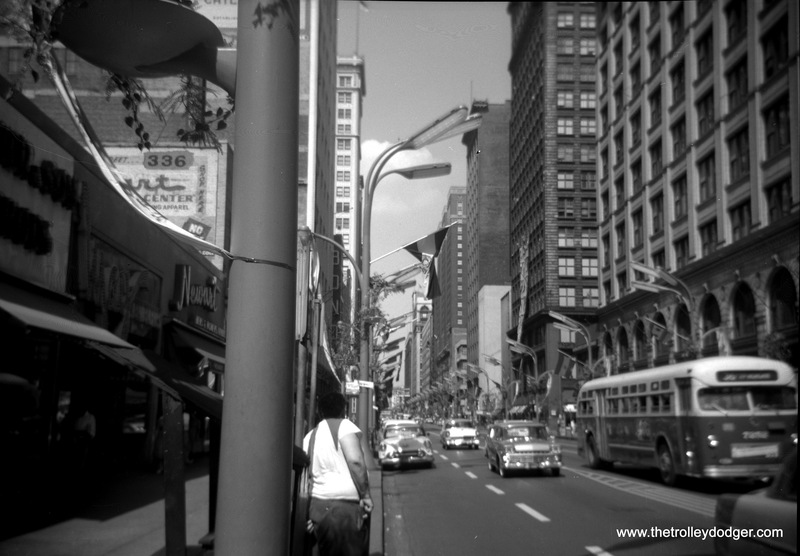 If you are a regular reader of this blog, you probably already know that the late Robert Selle (1929-2013) was an excellent photographer who specialized in black-and-white. 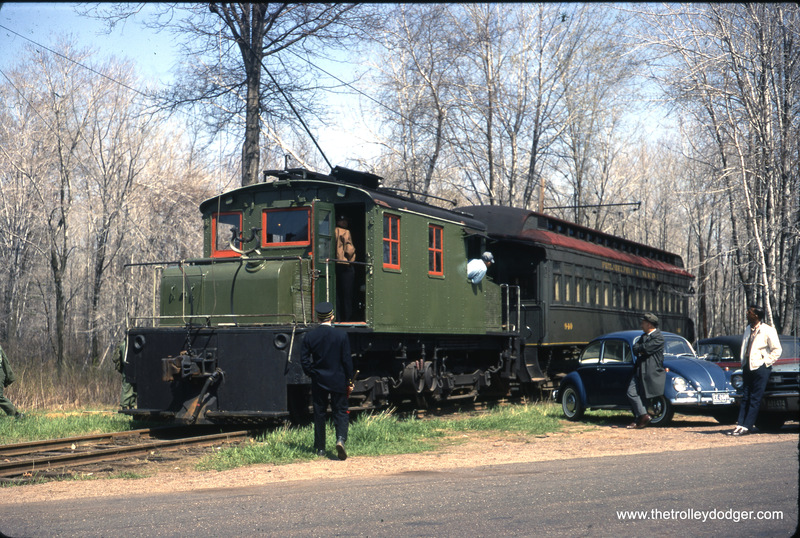 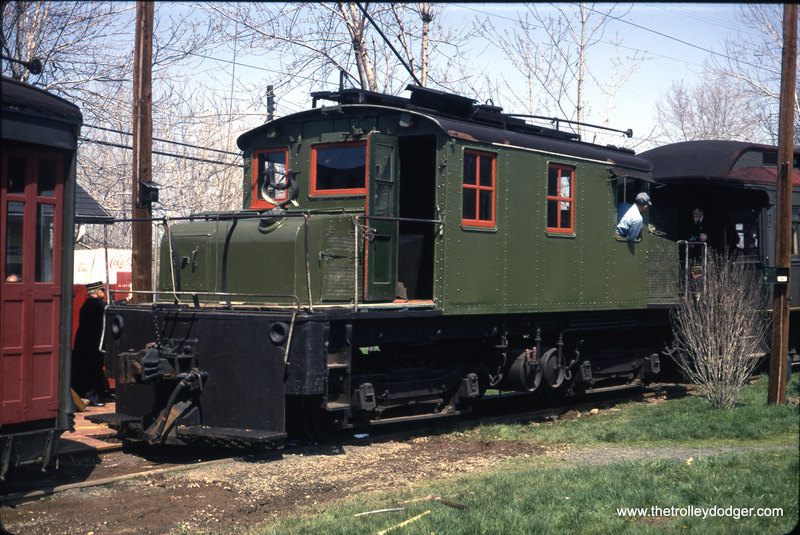 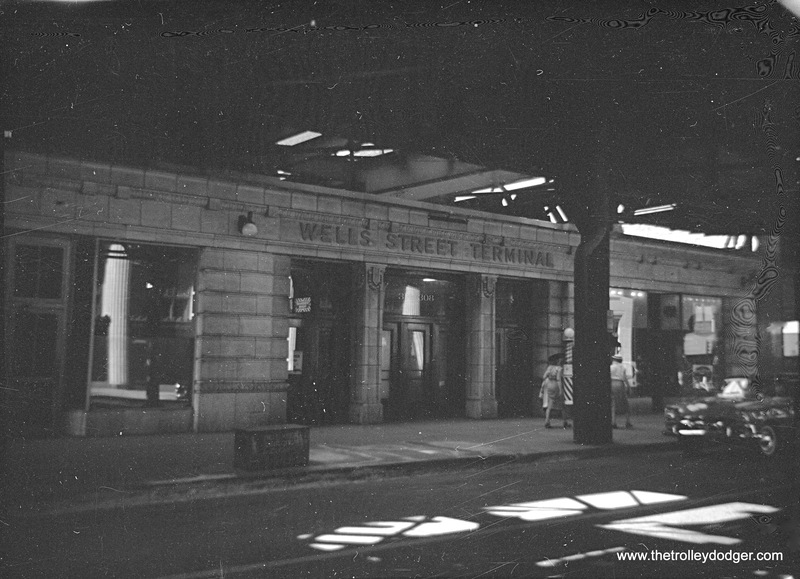 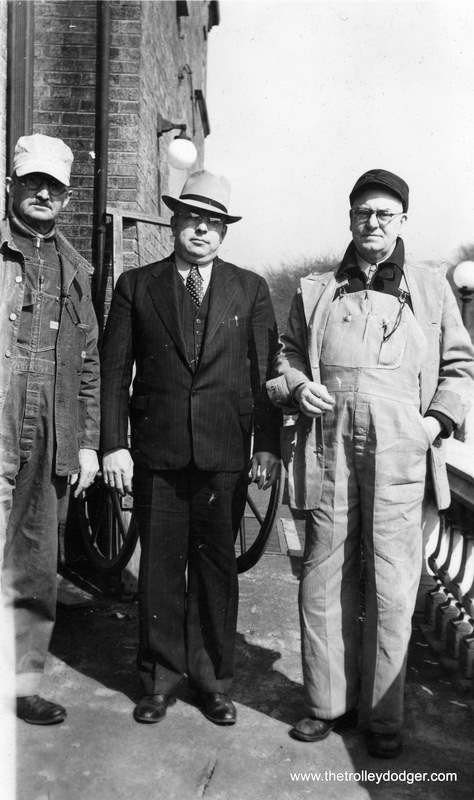 As with many other railfan photographers, his extensive collection of images got scattered after his death. 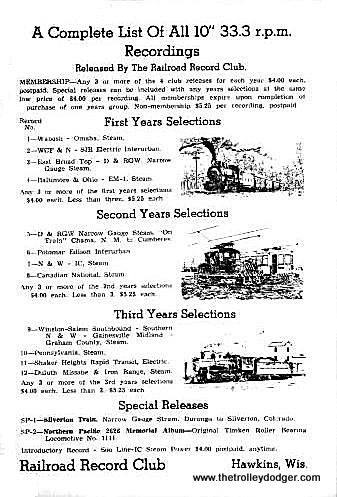 Now and again, some of them pop up on eBay, but not always identified as his work in the auction listings. 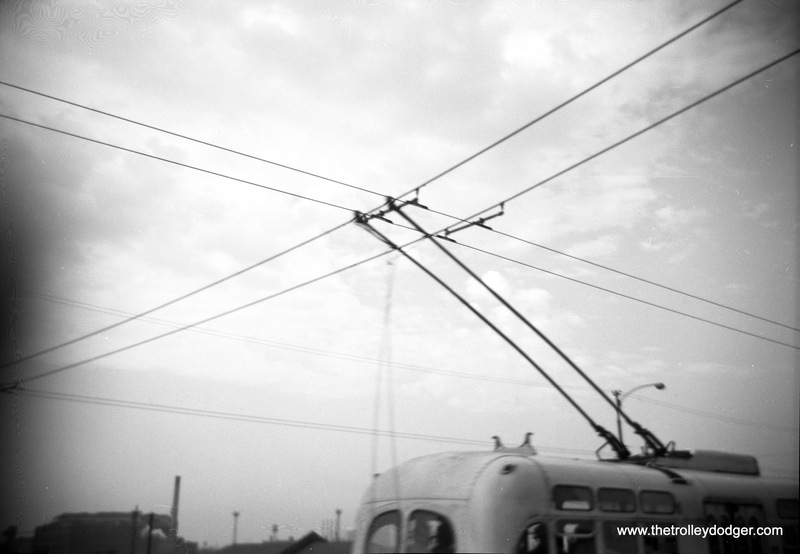 Fortunately, Selle is one of those few photographers whose work can be recognized at a glance, as it is often a cut above the rest. 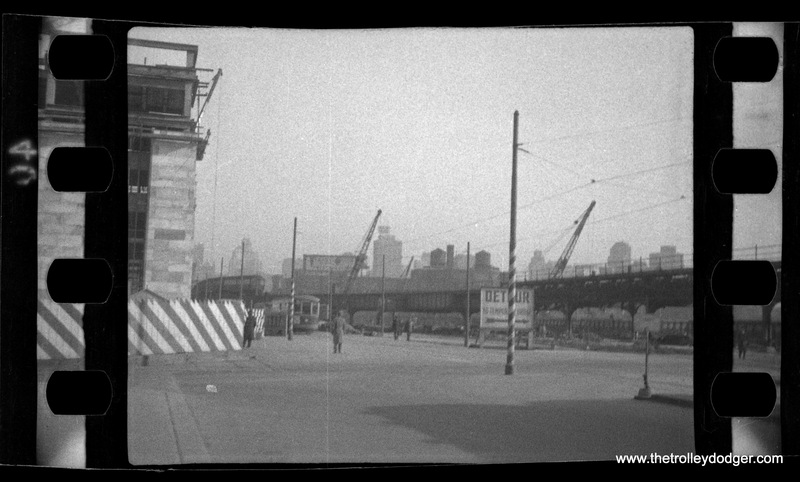 Over the years, we have purchased a few Bob Selle negatives, which have been featured on this blog (including three in today’s post). 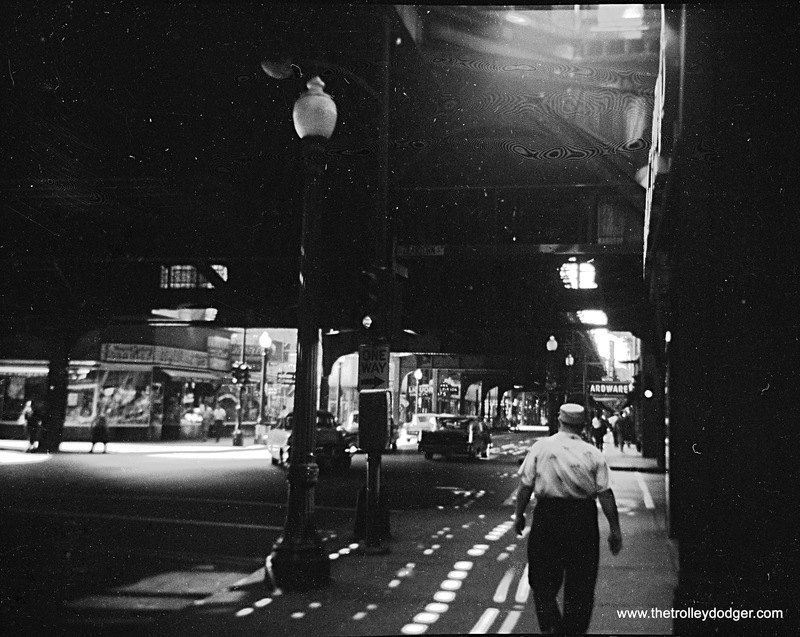 In 2011, Jeff Wien and the late Bradley Criss visited Mr. Selle in Florida, and he generously allowed them to scan some of his negatives. 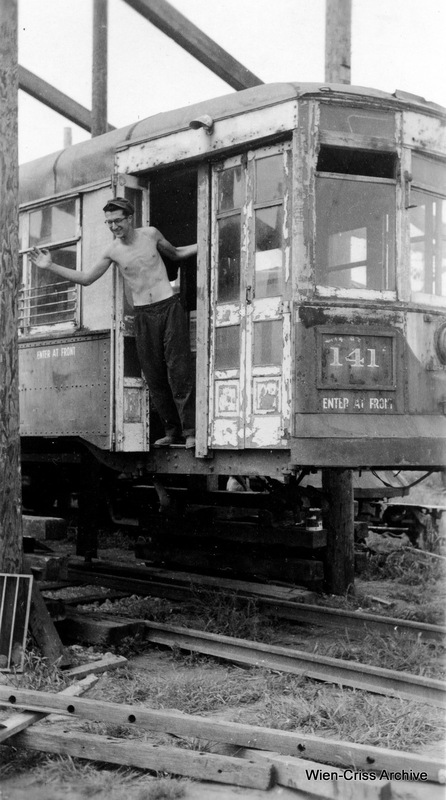 Tragically, Bradley Criss passed away in 2016 (you can read an appreciation of him here). 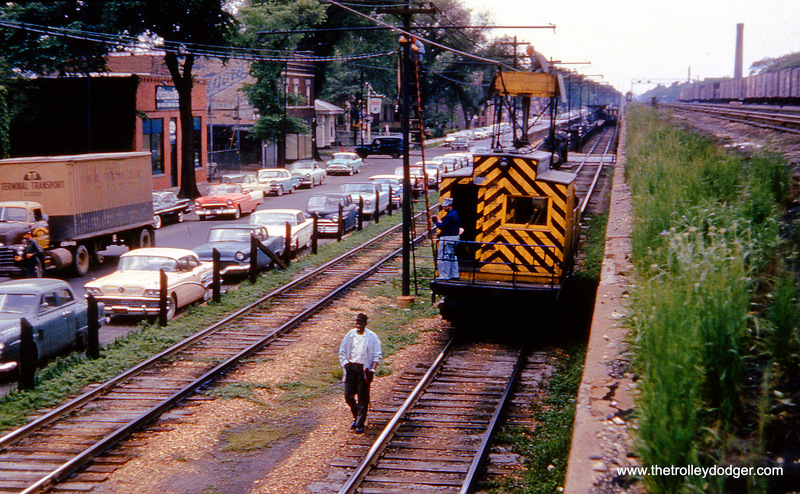 He would have been 55 years old on February 4th. 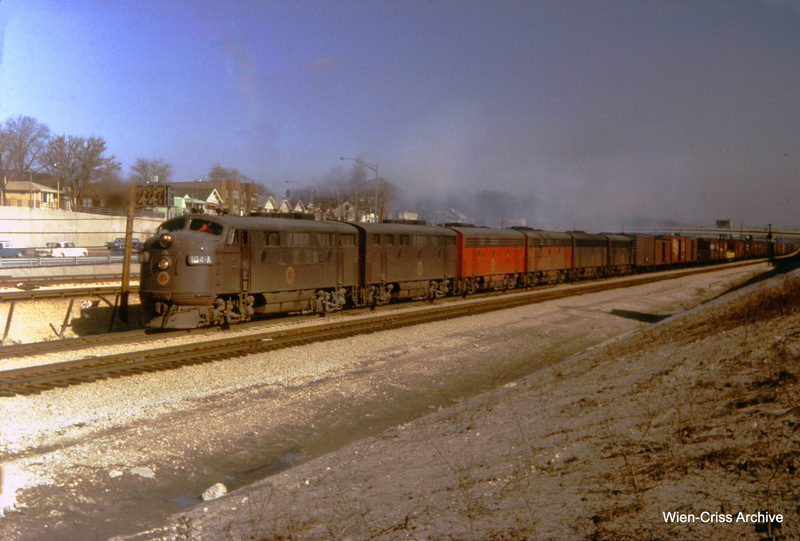 As a tribute to both Bob Selle and Bradley Criss, here is a selection from the images they scanned, courtesy of Jeff Wien and the Wien-Criss Archive. 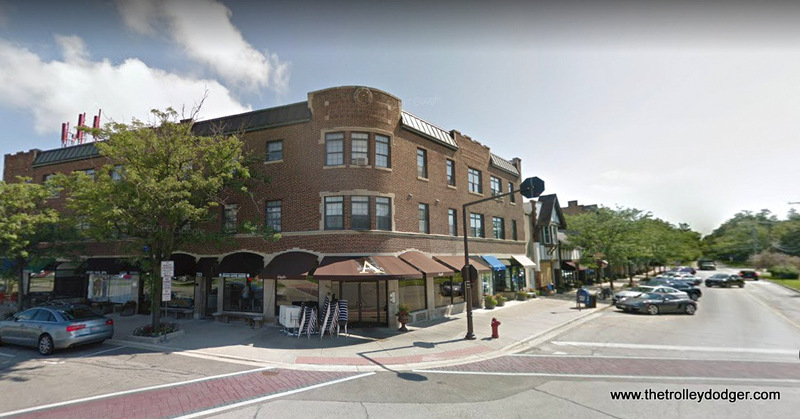 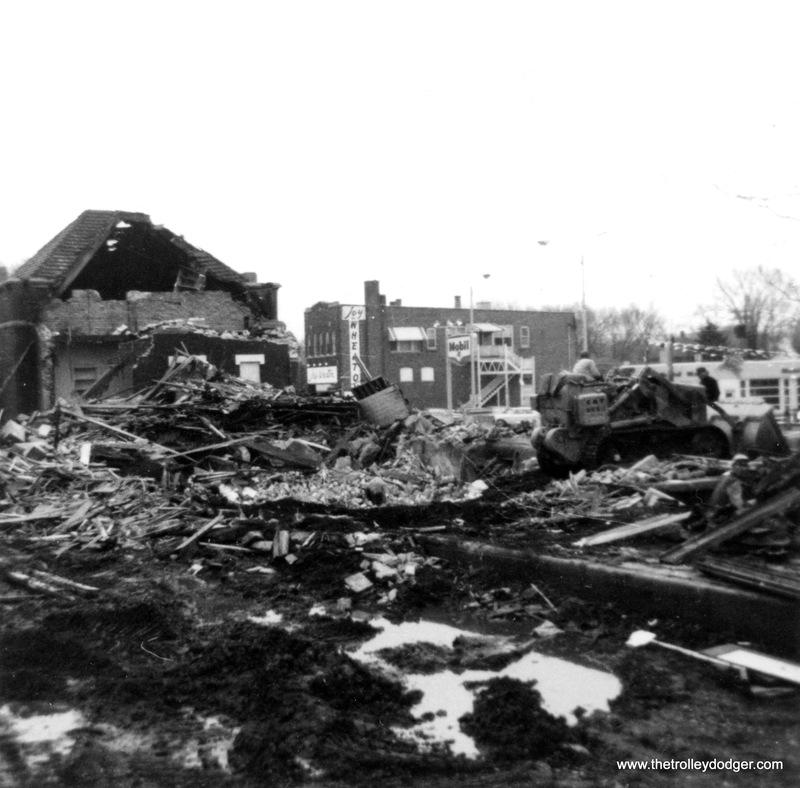 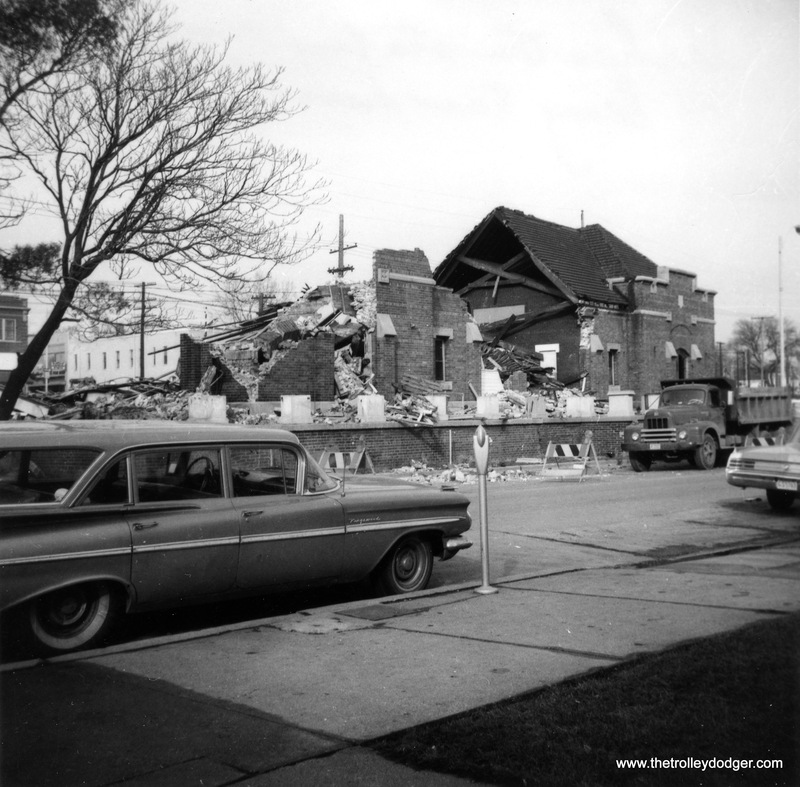 The building just visible in the previous picture, located at 514 Roger Williams Avenue in Highland Park. 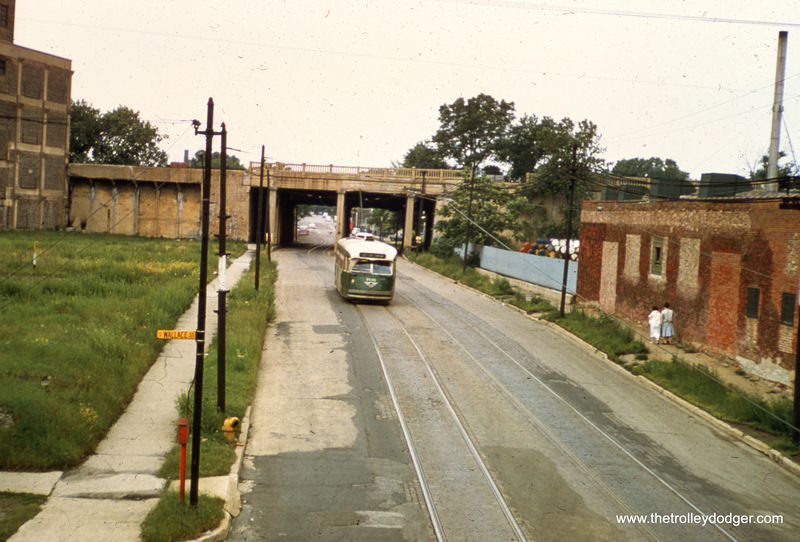 The view looking east from about 3037 West Chicago Avenue, which is probably just a bit east of where the above photo was taken. 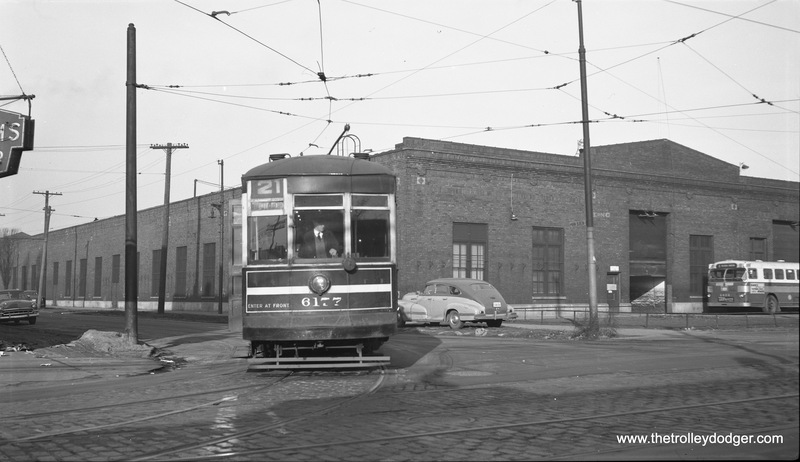 You can see that the same building is at rear on Sacramento Boulevard.